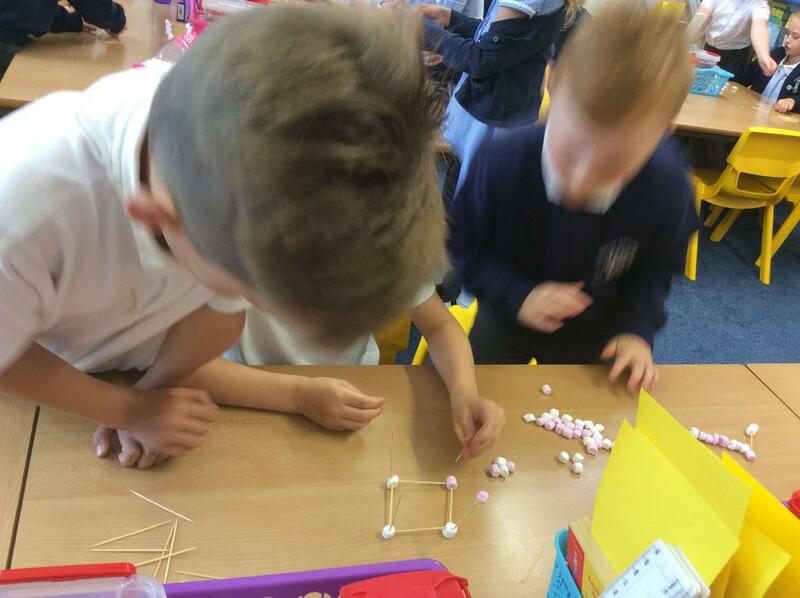 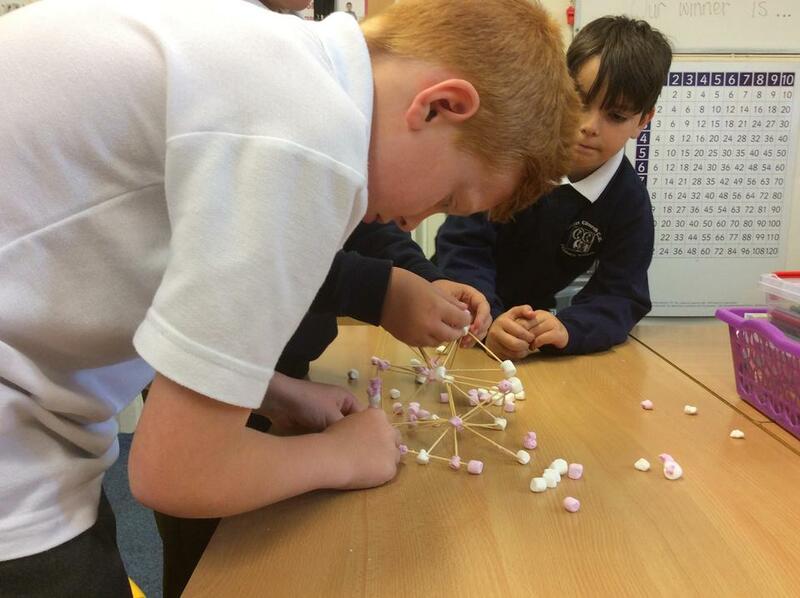 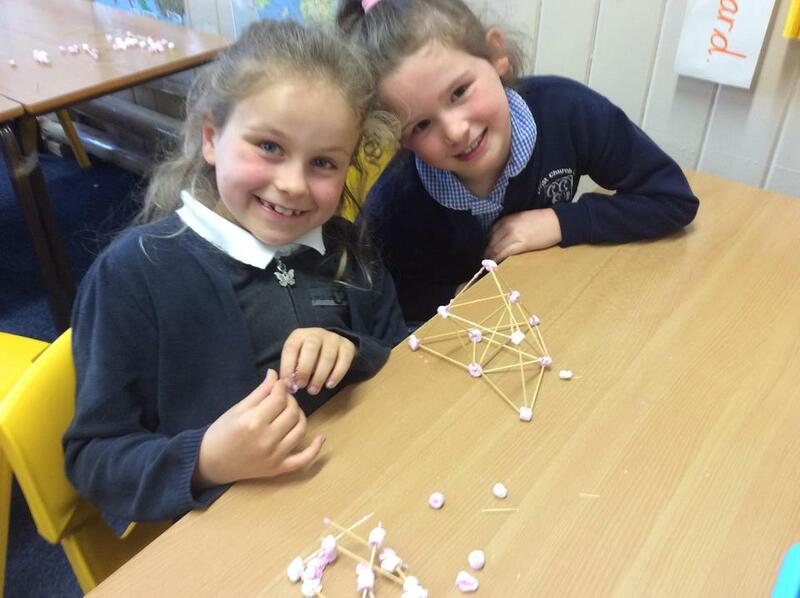 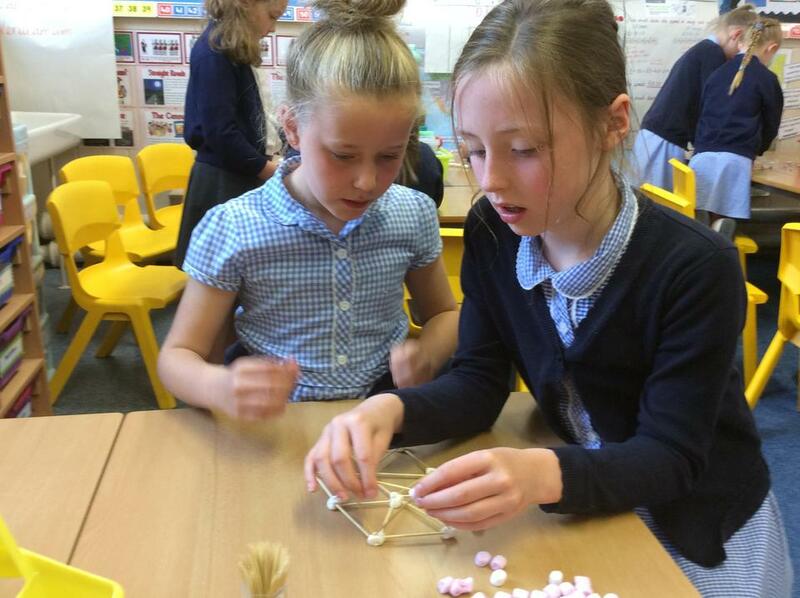 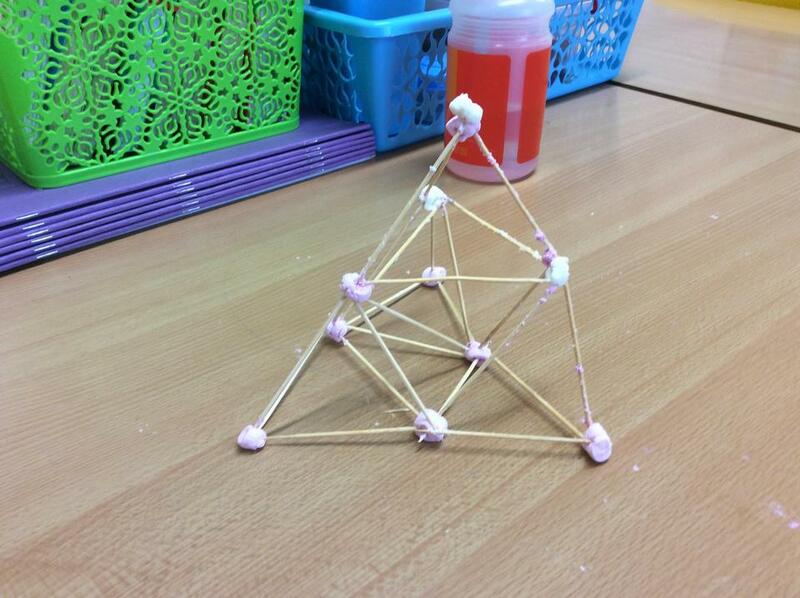 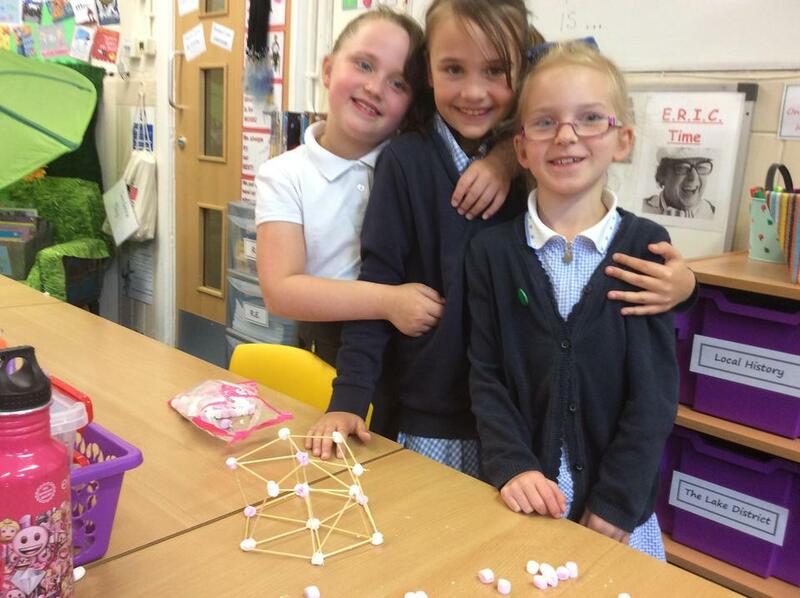 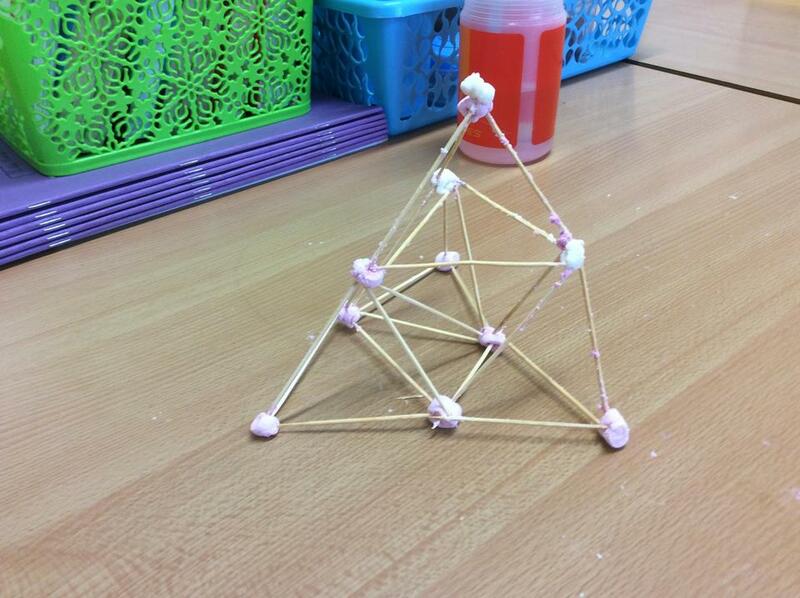 Year 3 tried 'The Great Marshmallow Challenge' this week. 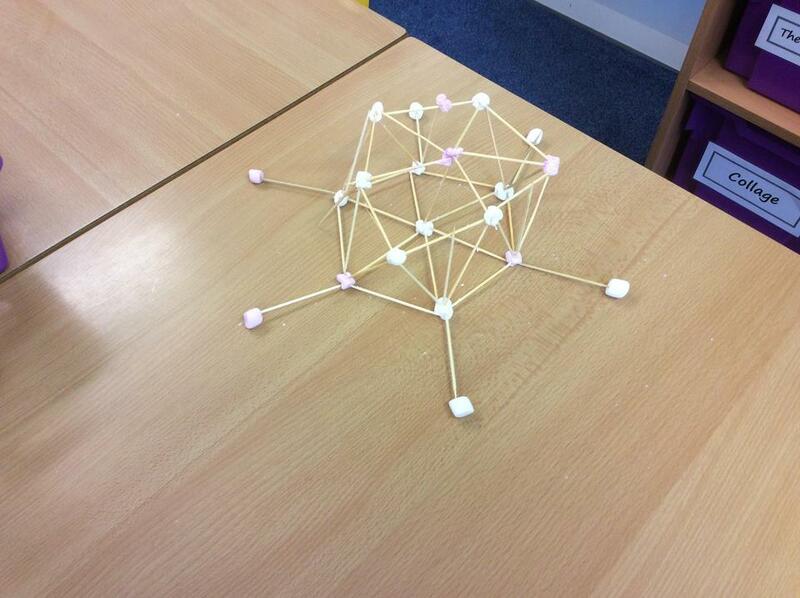 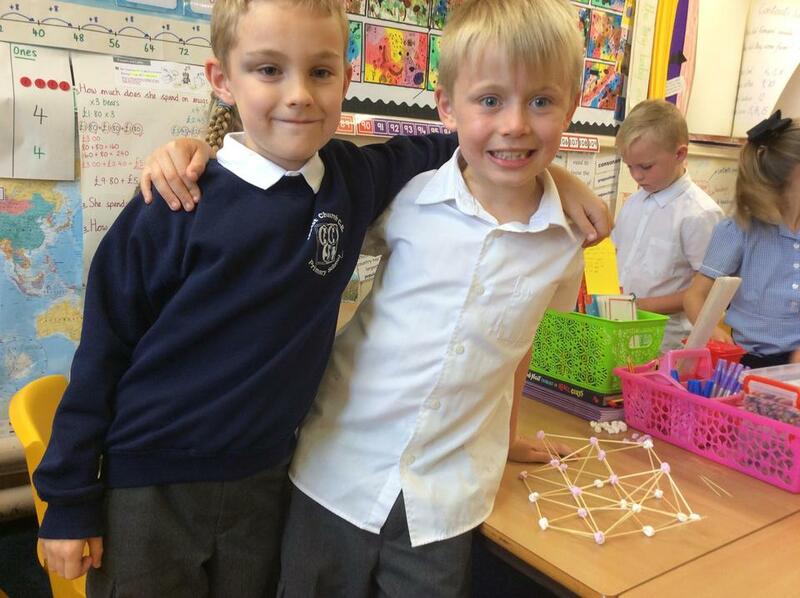 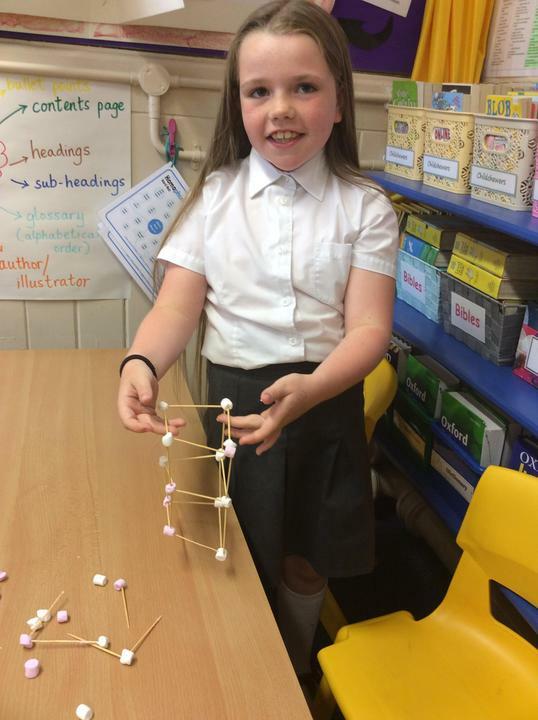 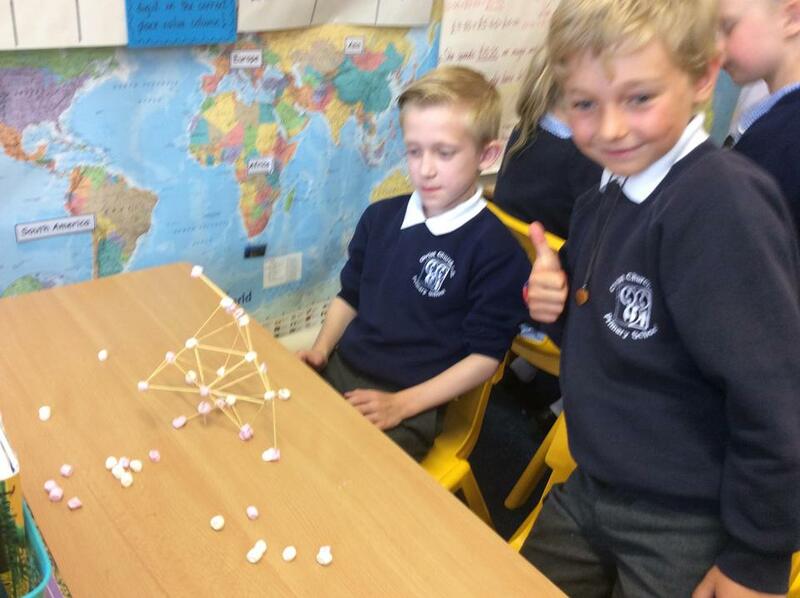 The challenge was to use cocktail sticks and mini marshmallows to build a tall, stable structure. 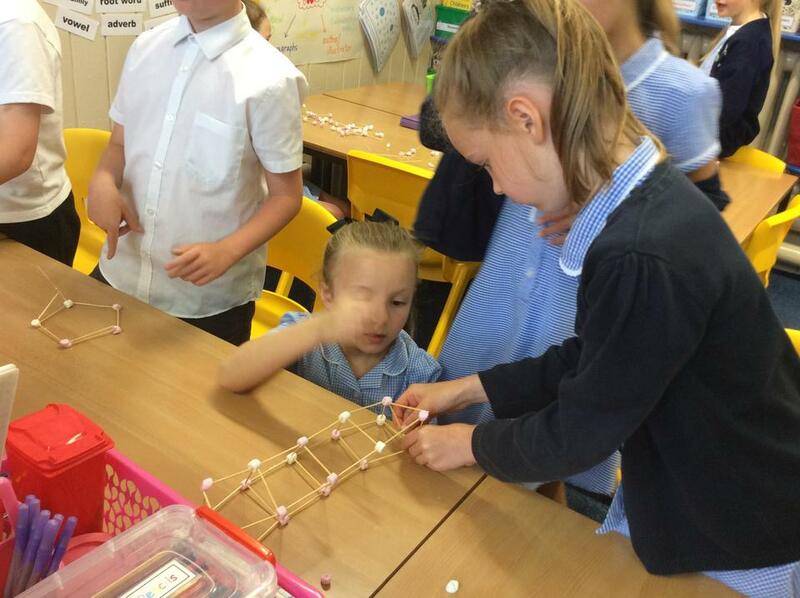 Lots of perseverance was needed! 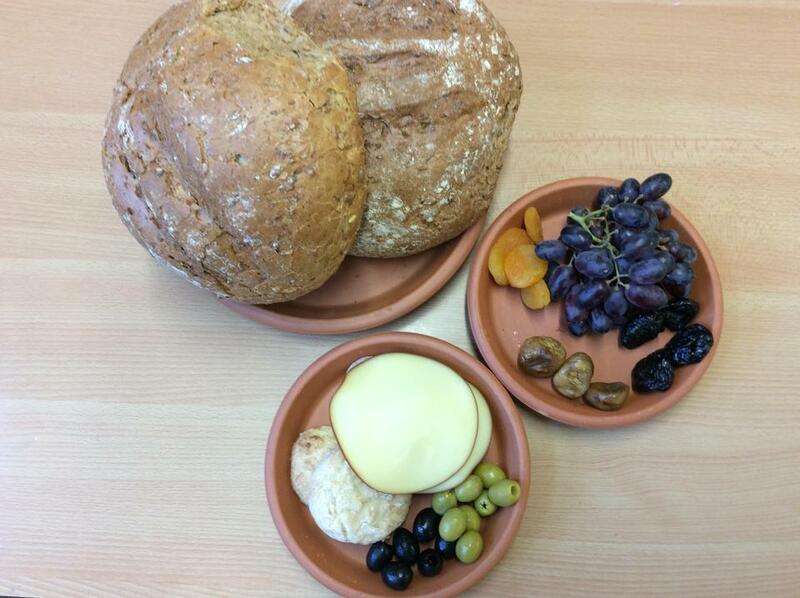 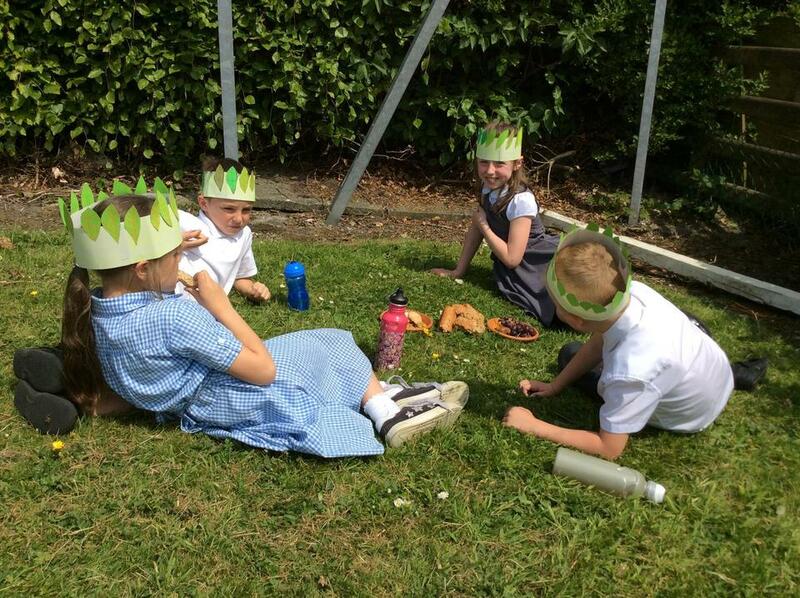 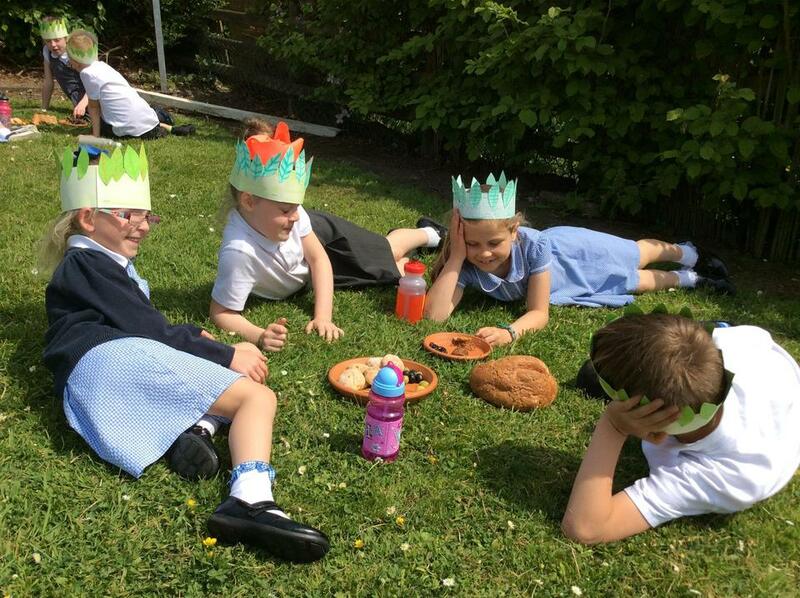 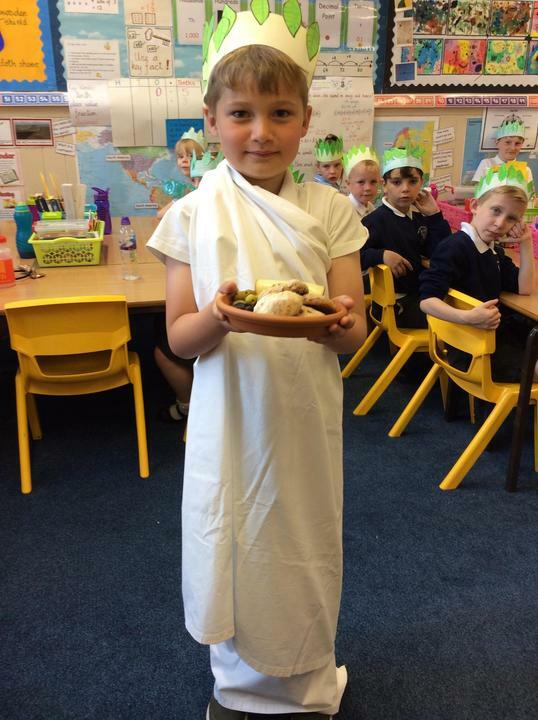 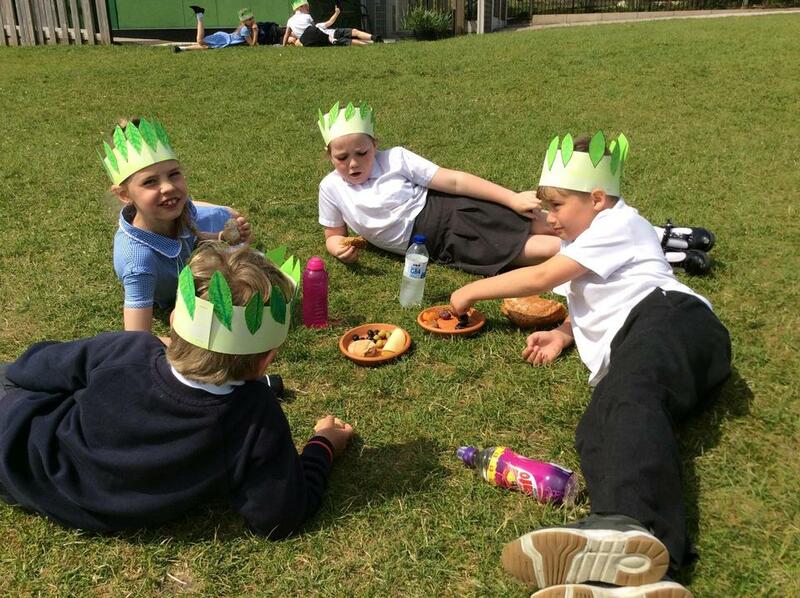 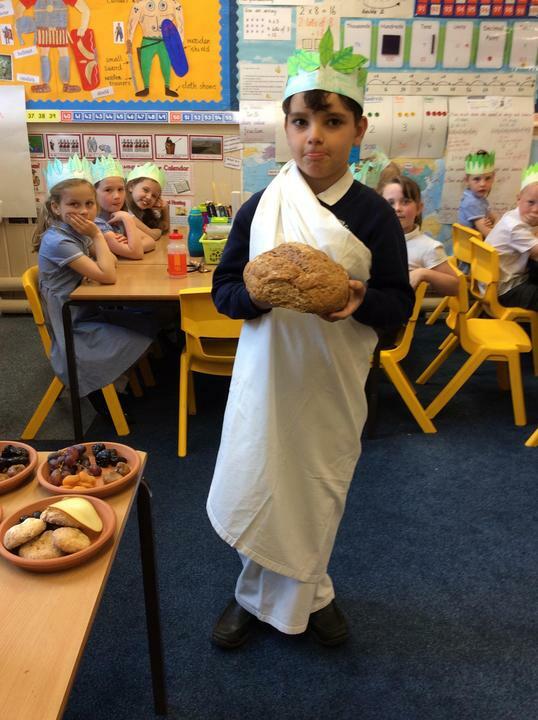 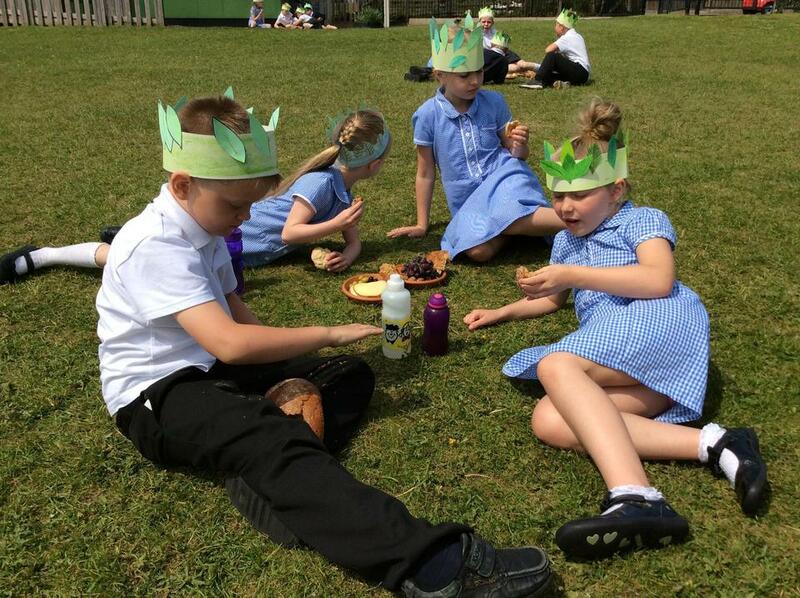 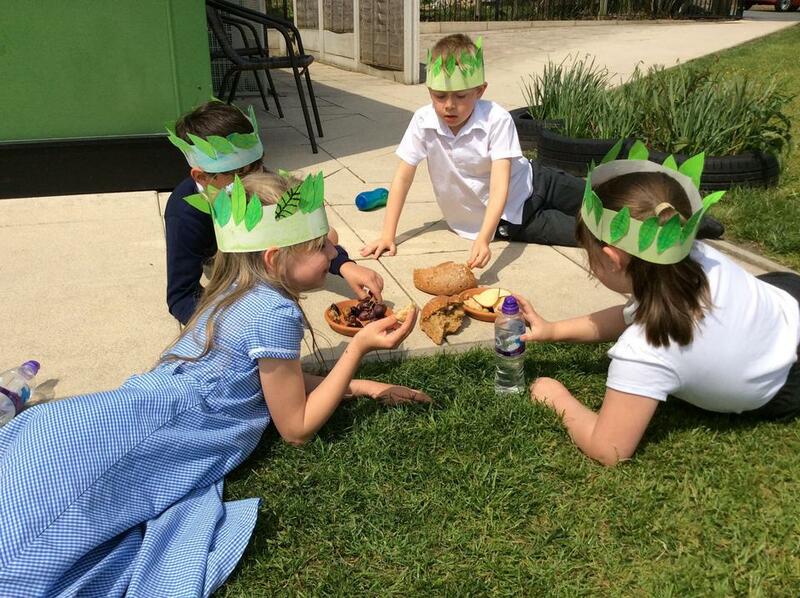 Year 3 enjoyed a Roman banquet today. 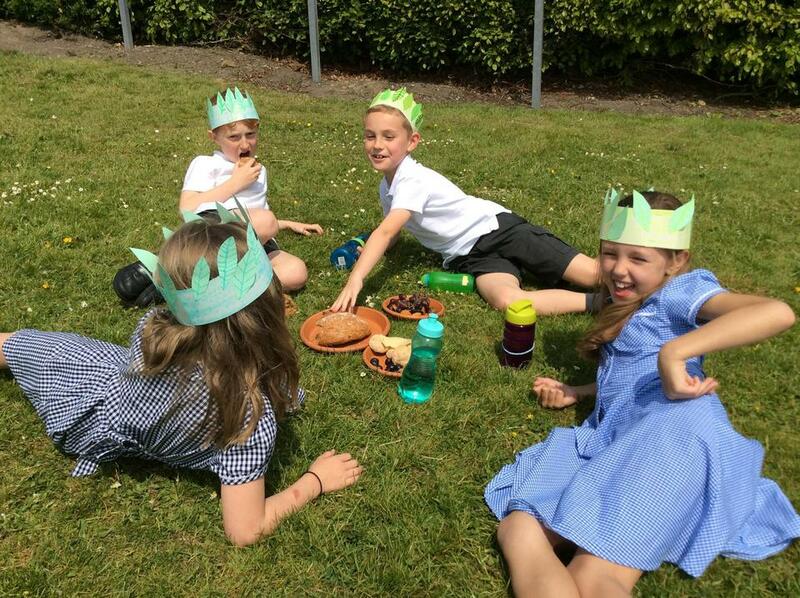 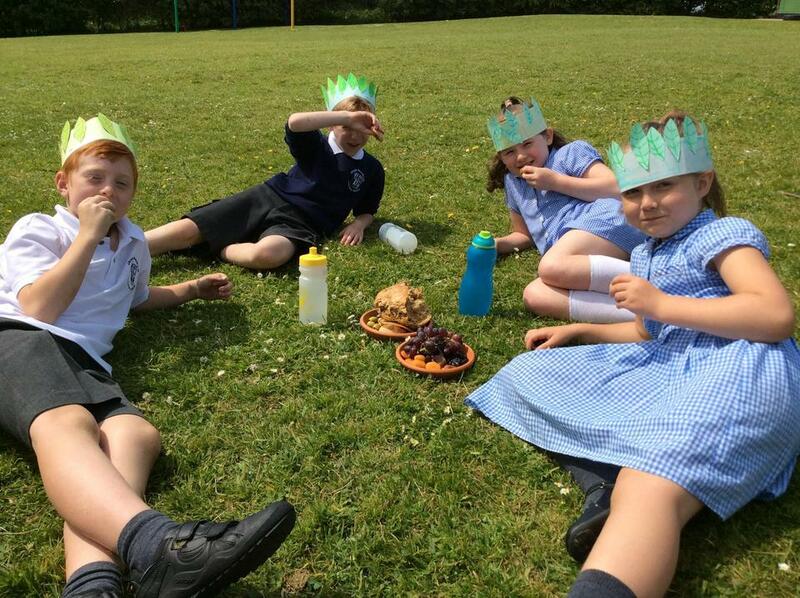 We reclined like Romans to eat our dates, figs, grapes, olives, cheese, Roman bread and Roman honey cakes (made by Mrs. Tilsley)! 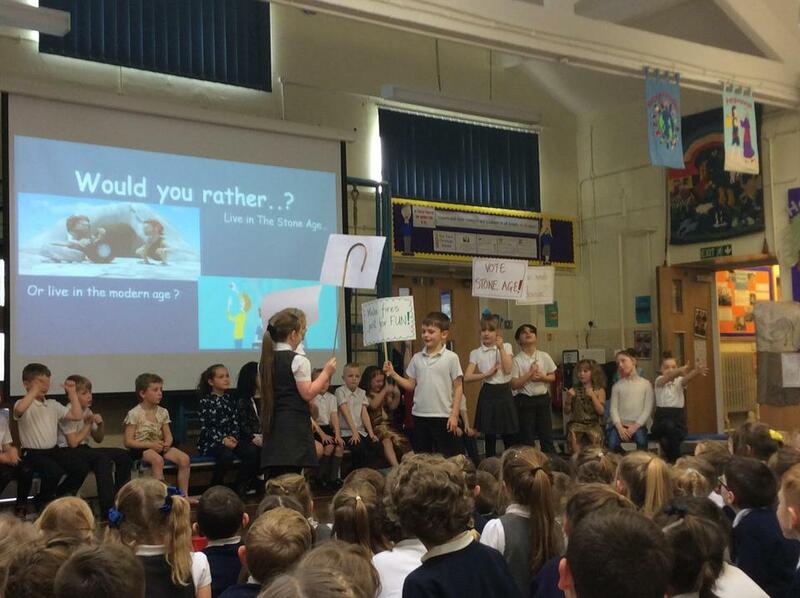 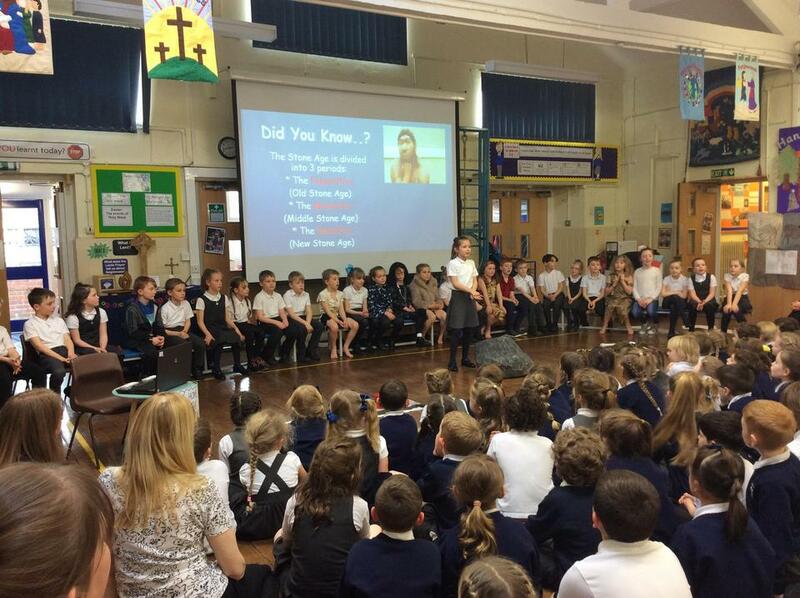 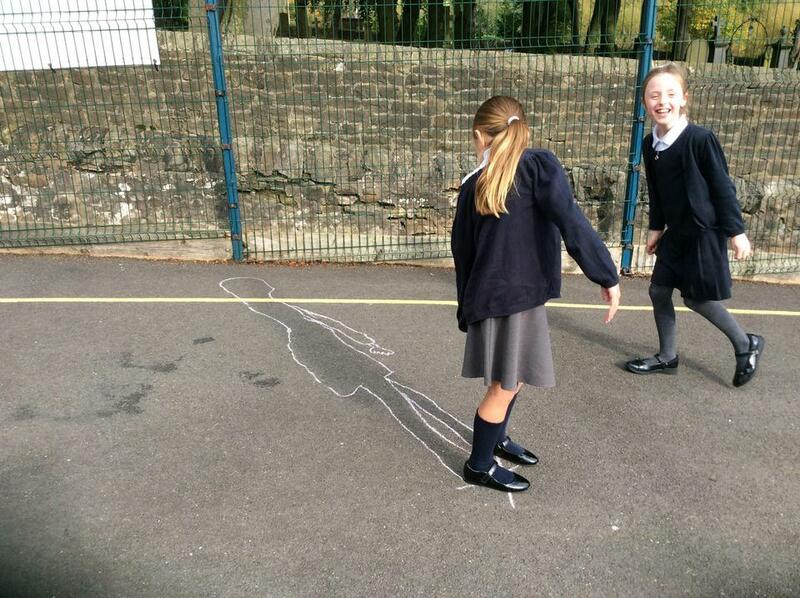 Year 3 do 'Your Mile Your Way' - with some very interesting ways indeed! 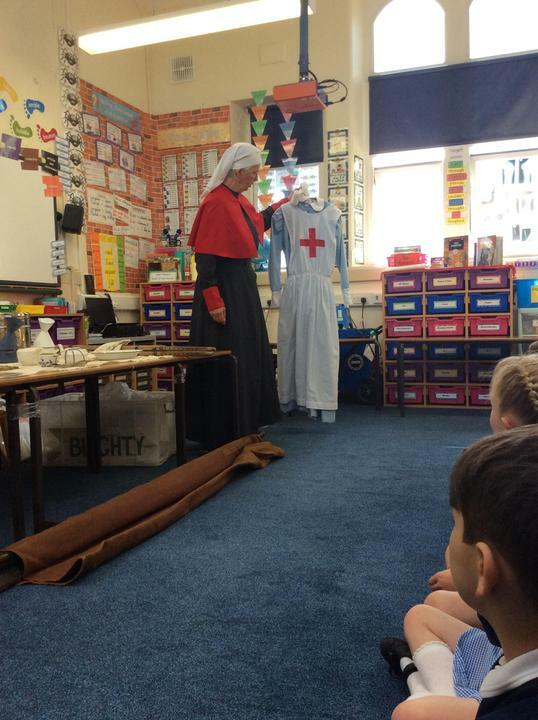 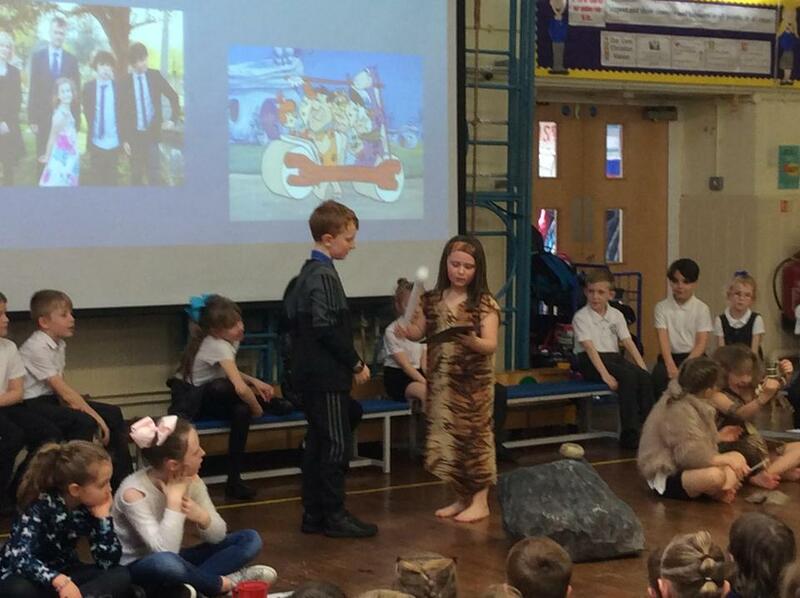 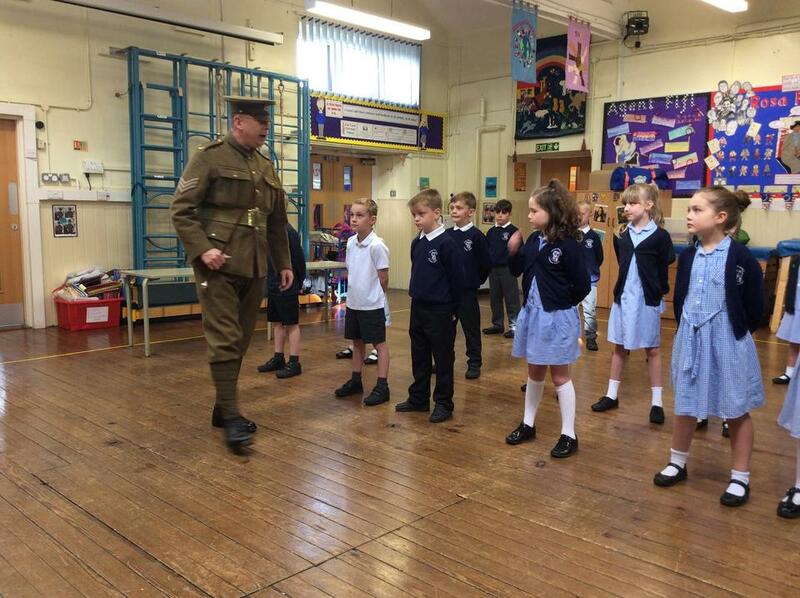 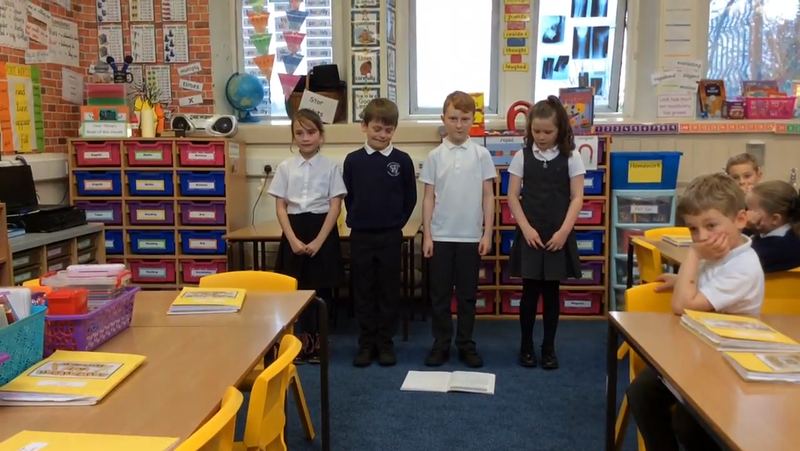 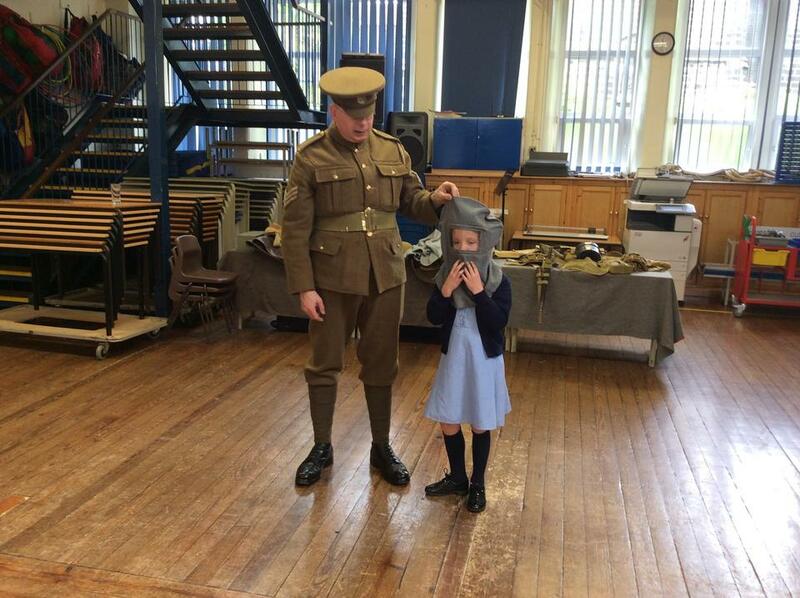 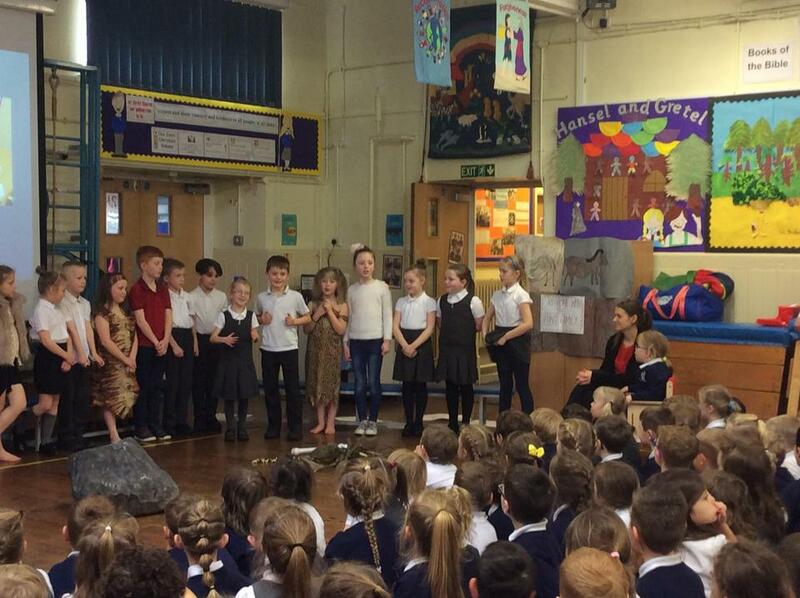 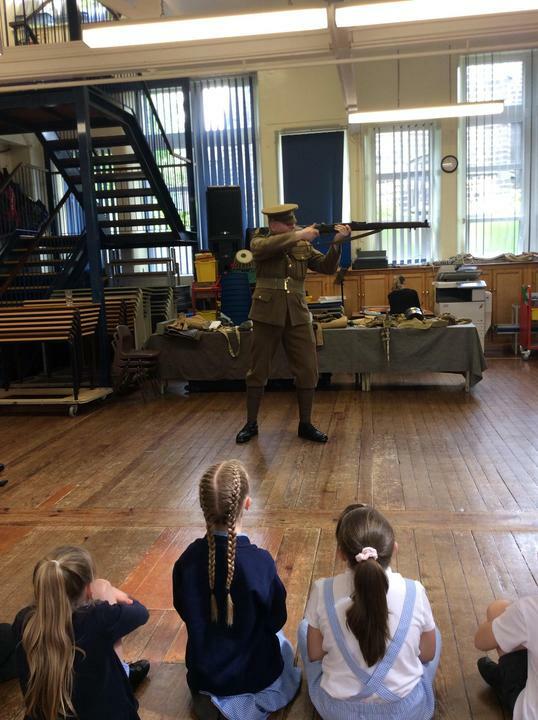 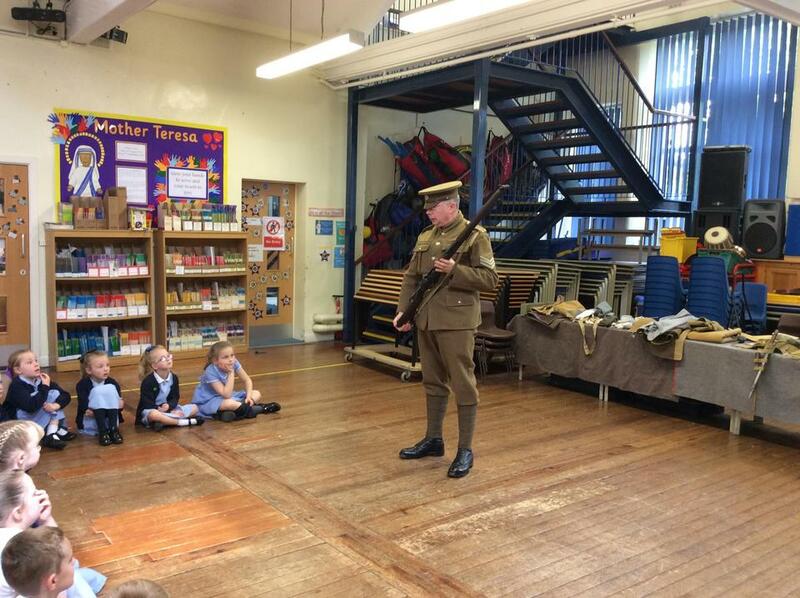 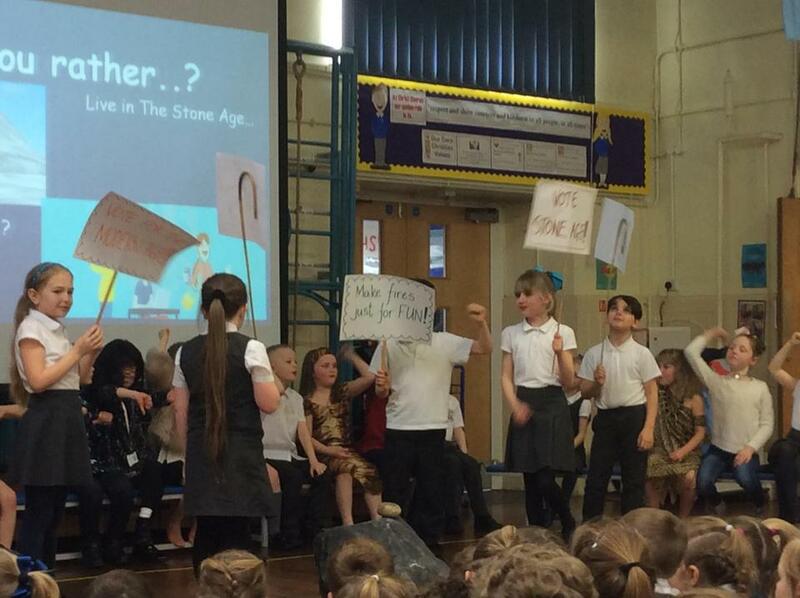 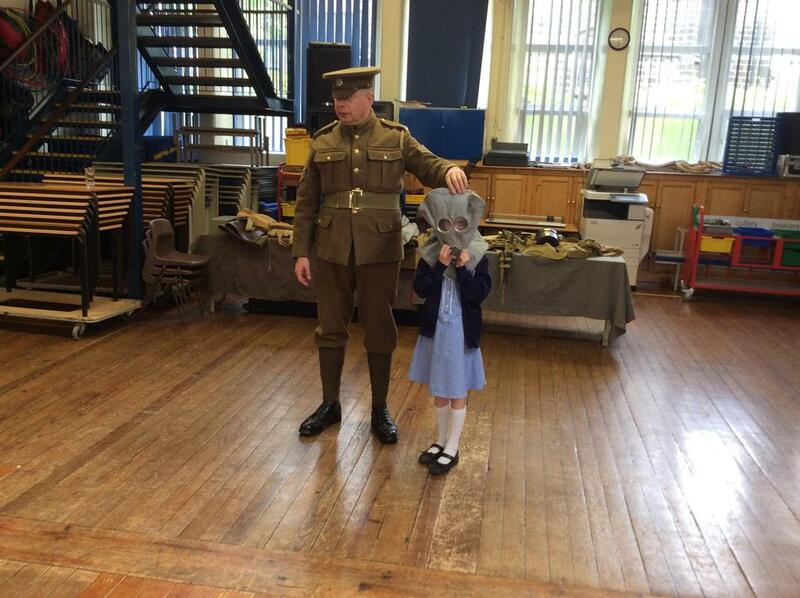 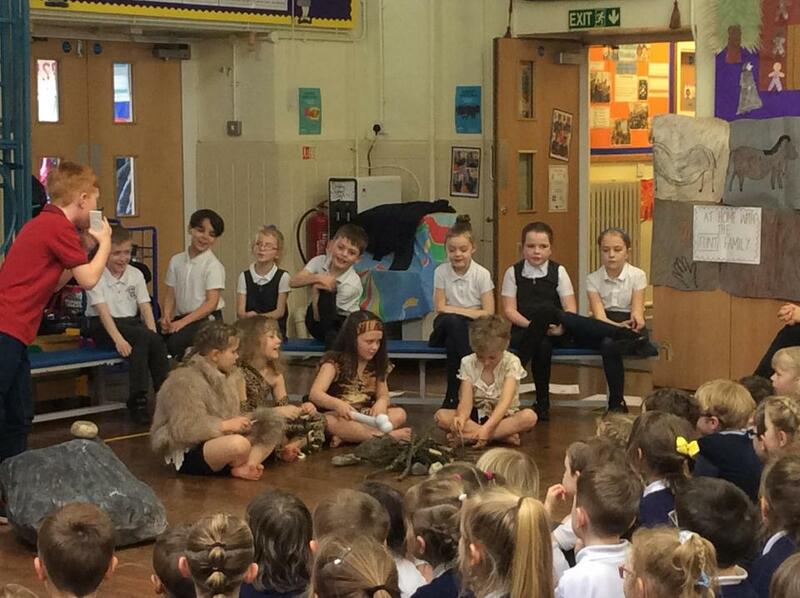 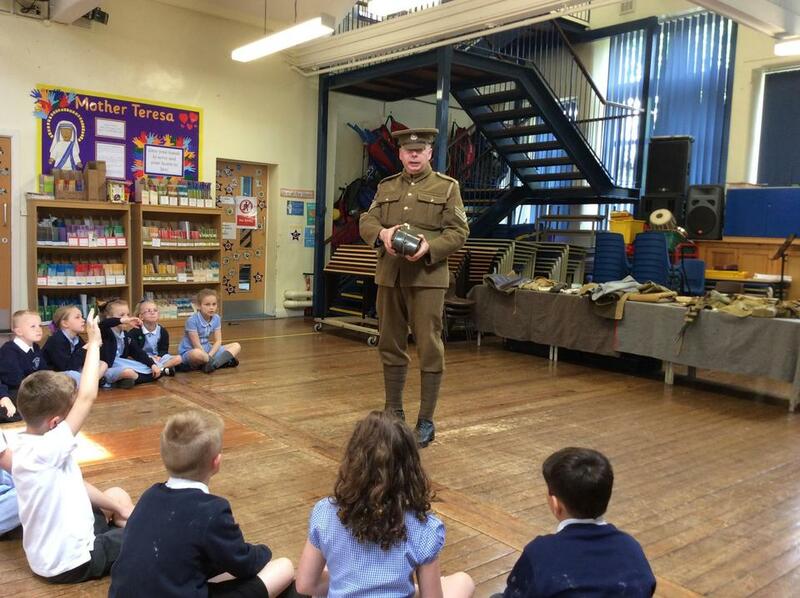 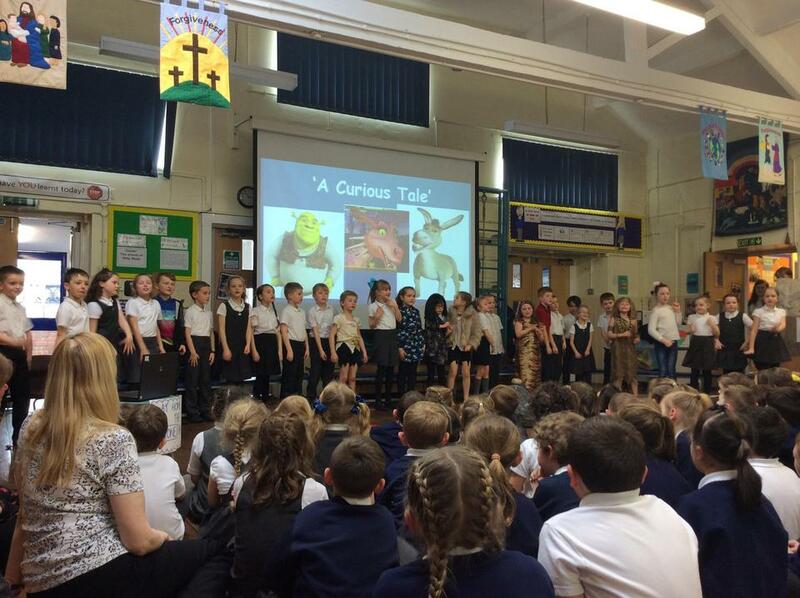 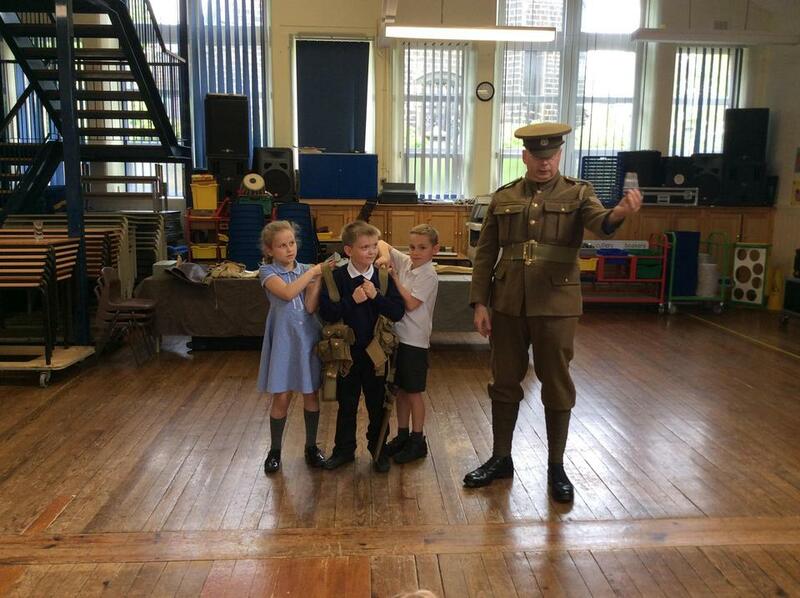 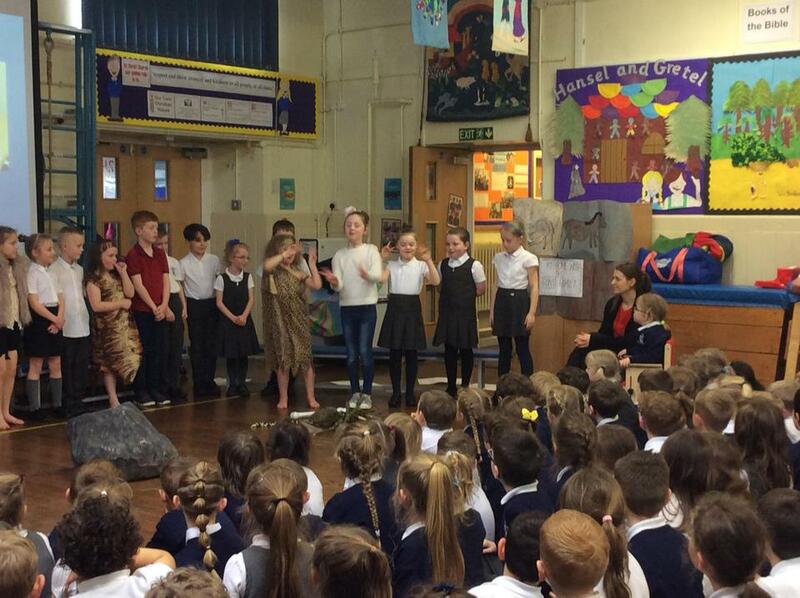 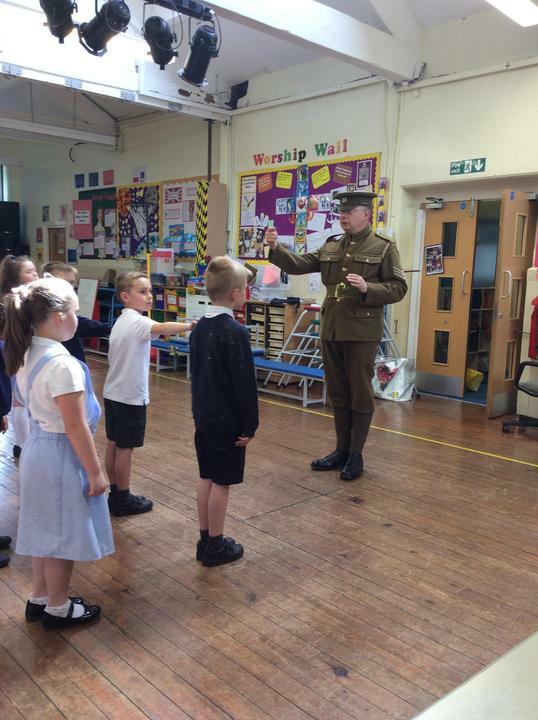 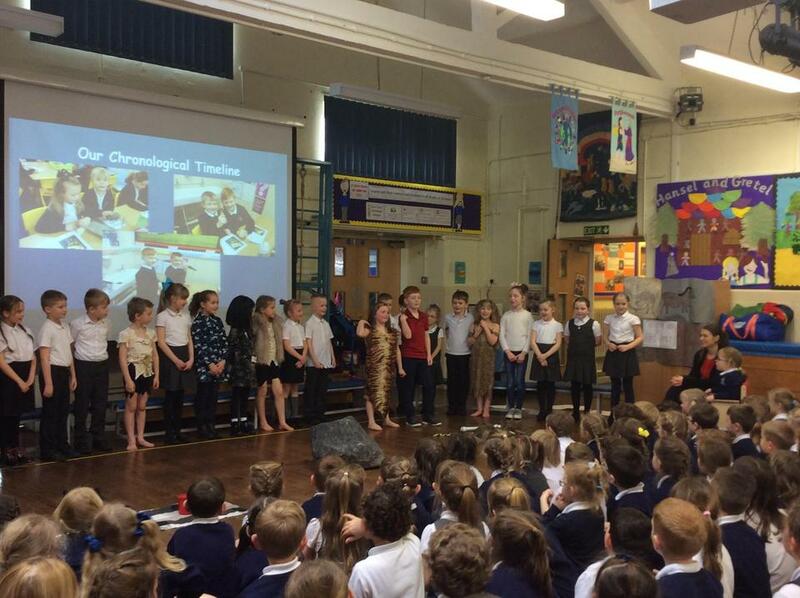 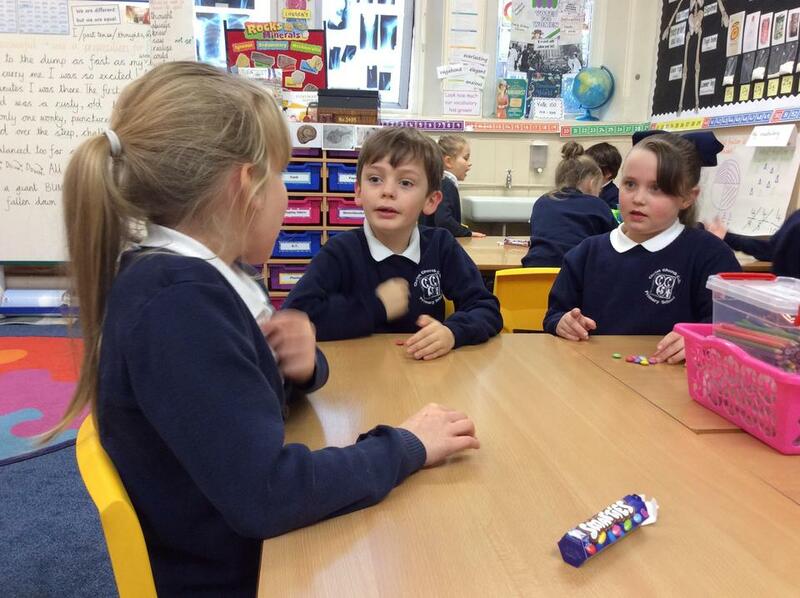 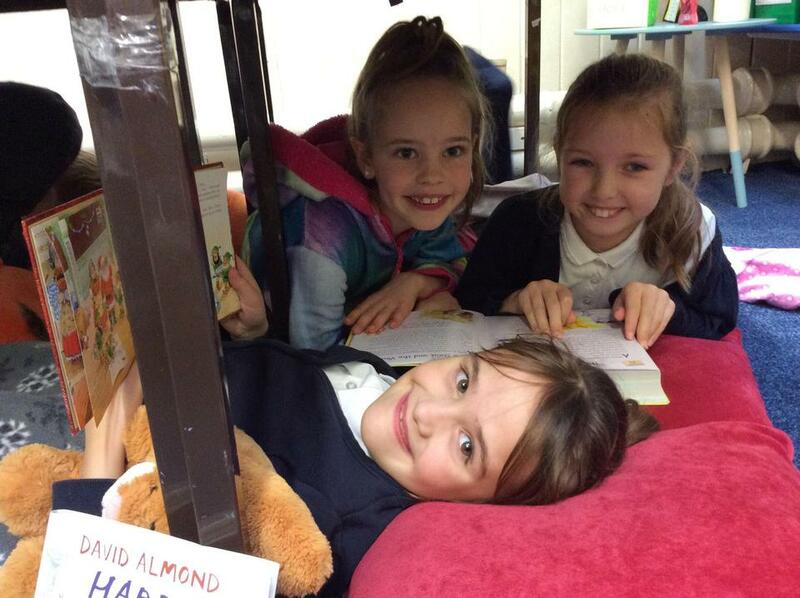 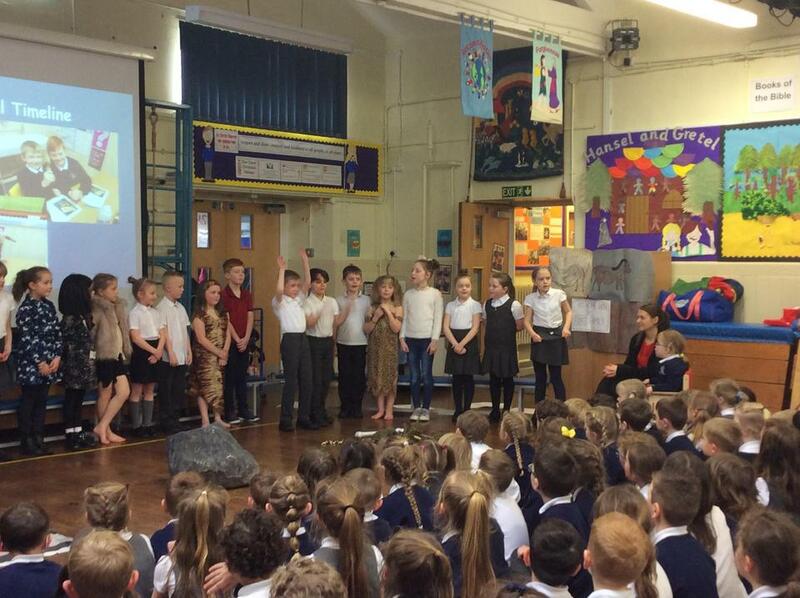 This week Year 3 have been writing, directing, filming and performing their own plays. 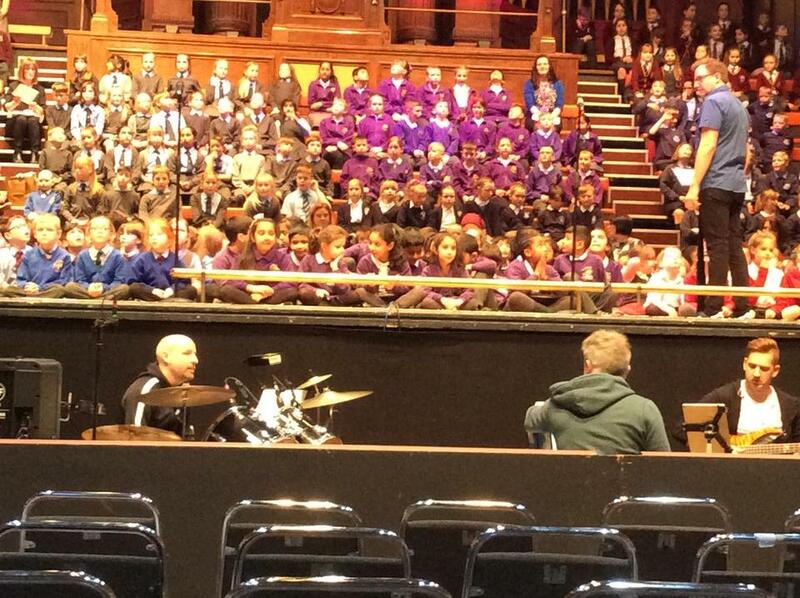 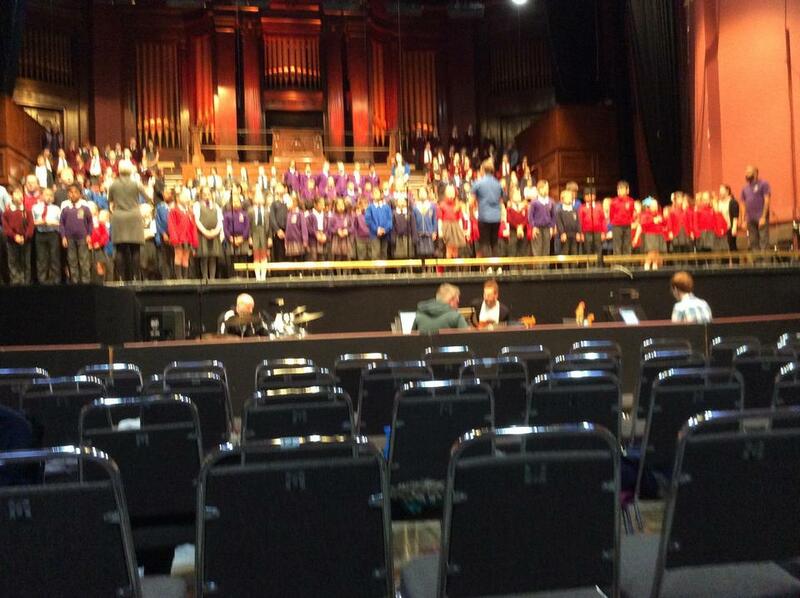 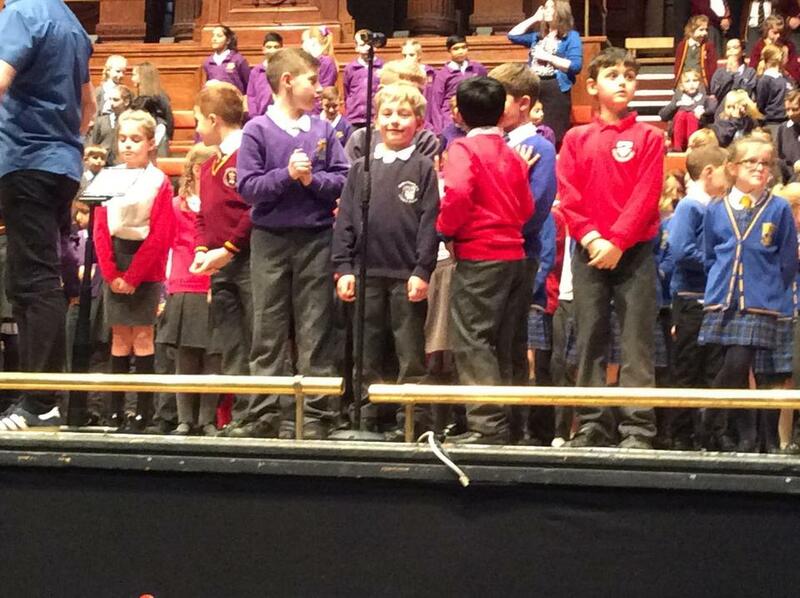 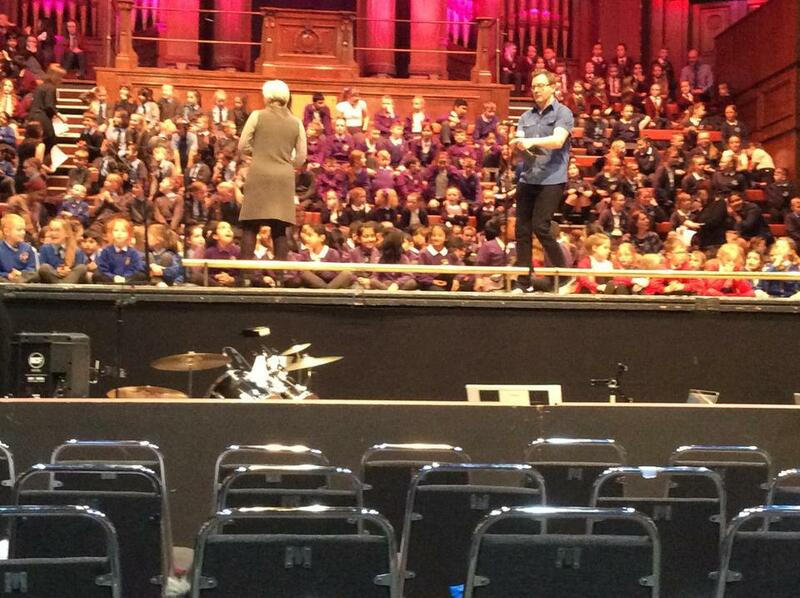 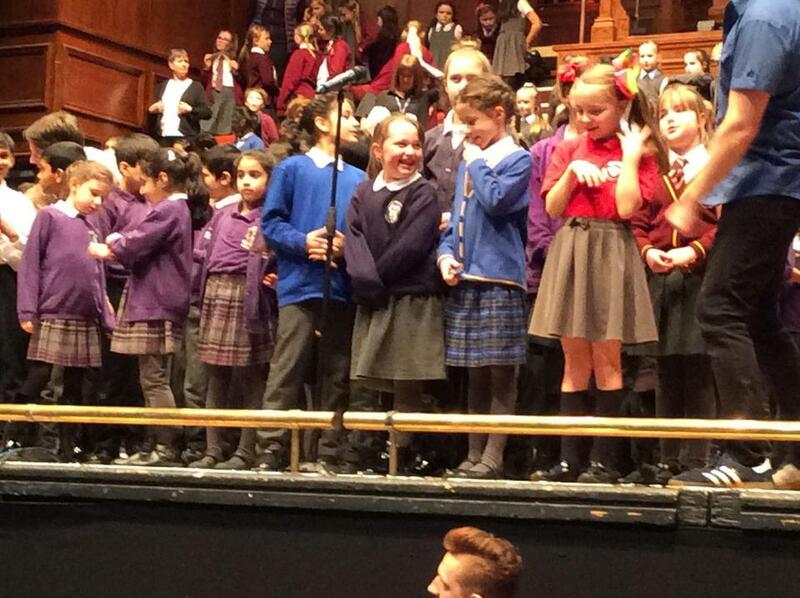 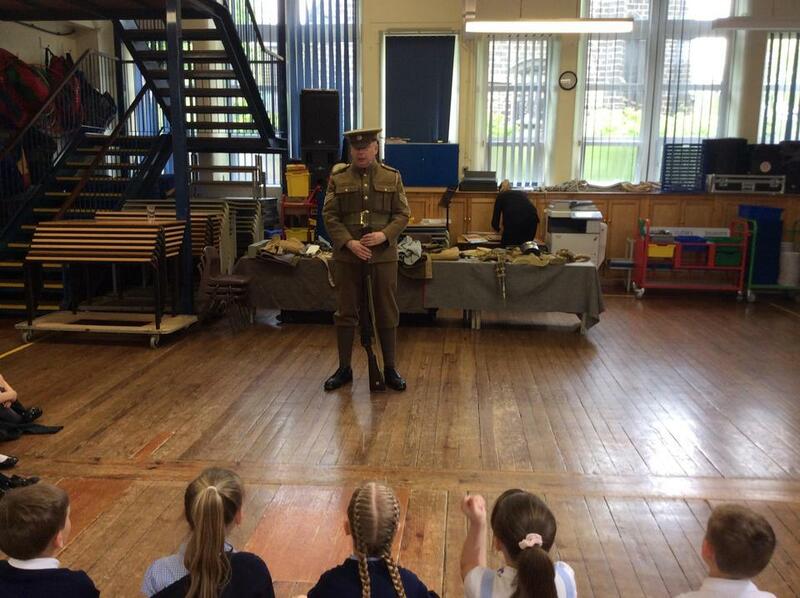 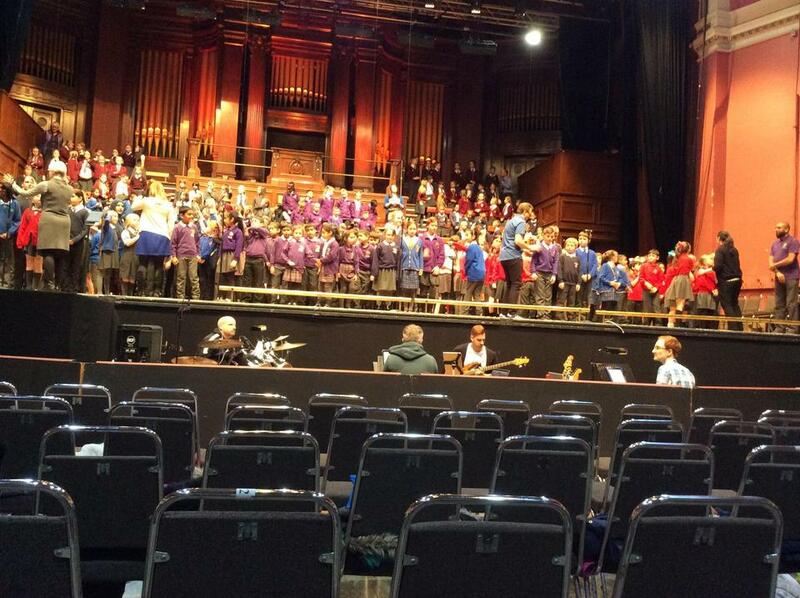 The children did really well with just twenty minutes rehearsal time! 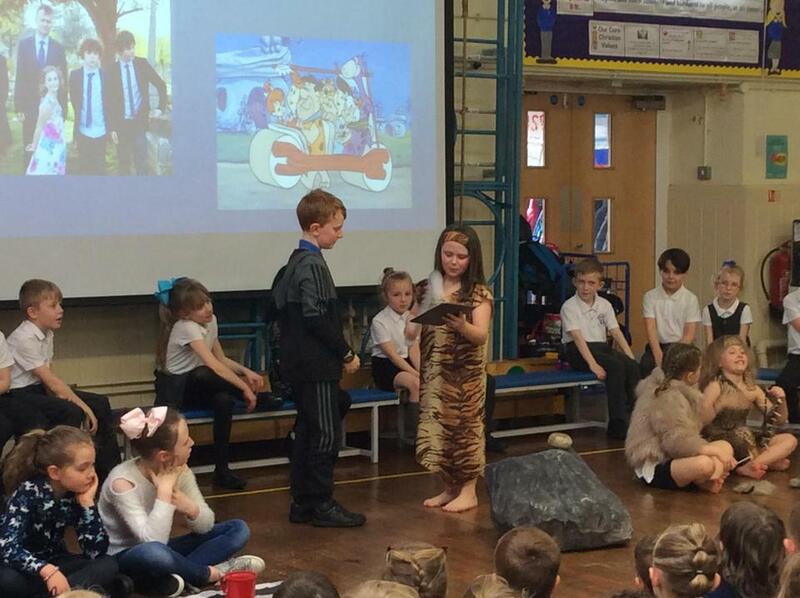 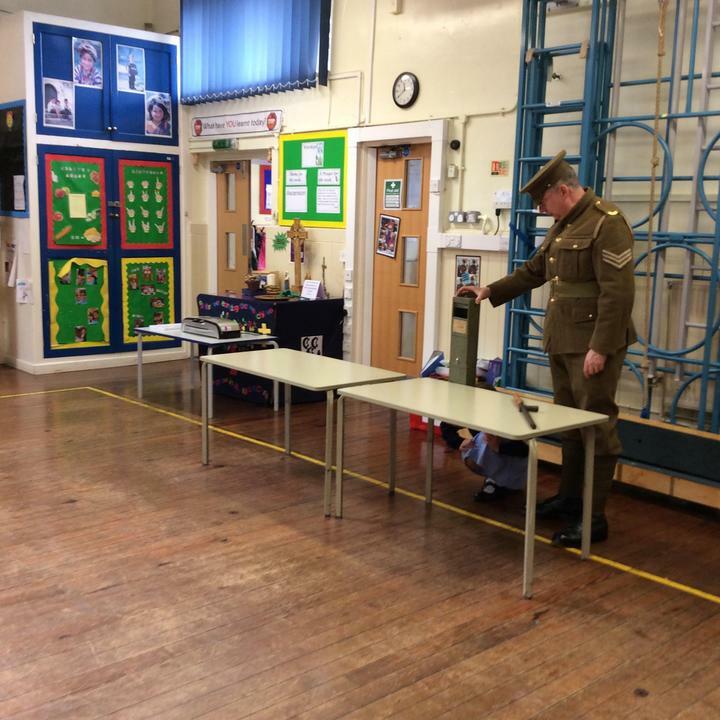 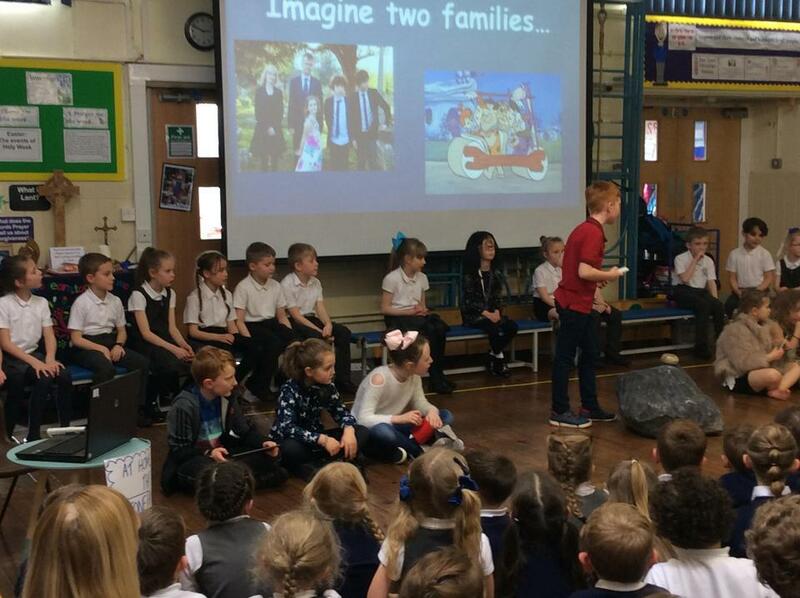 Have a look at some of the scenes from our play 'The Popsicle Boy'. 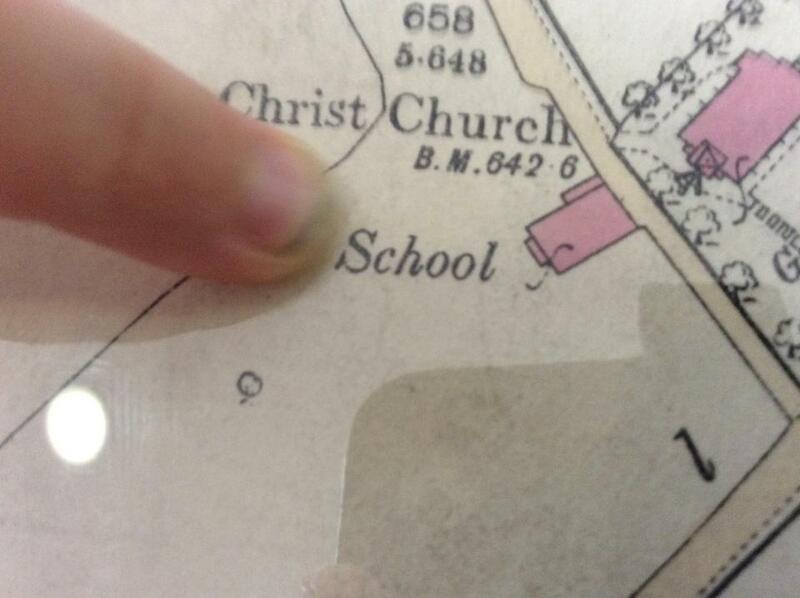 Welcome back to school everyone. 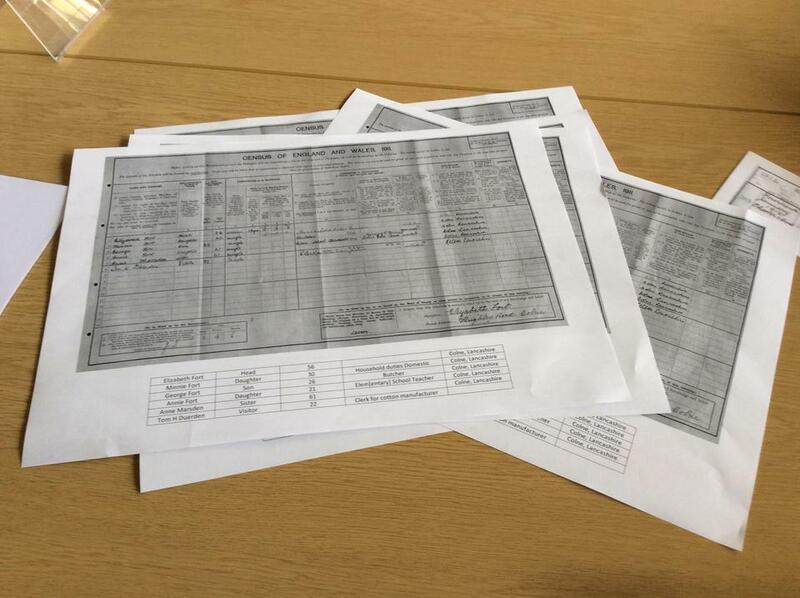 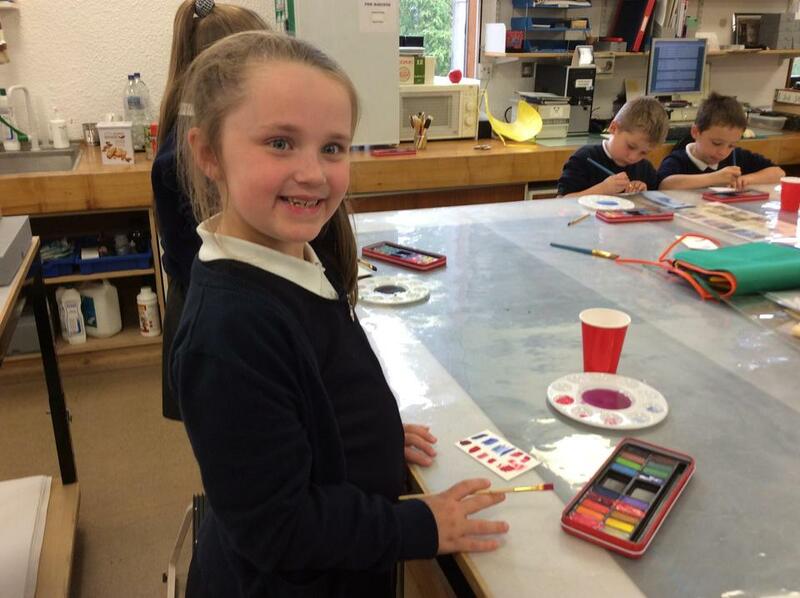 It's going to be a busy Summer Term! 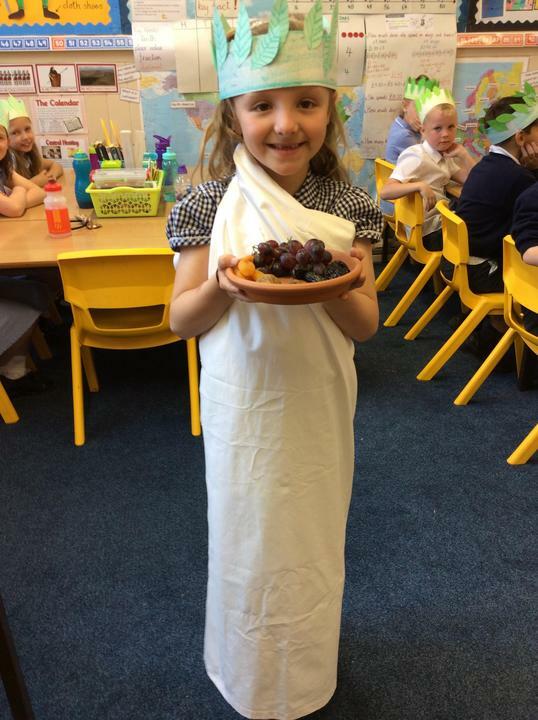 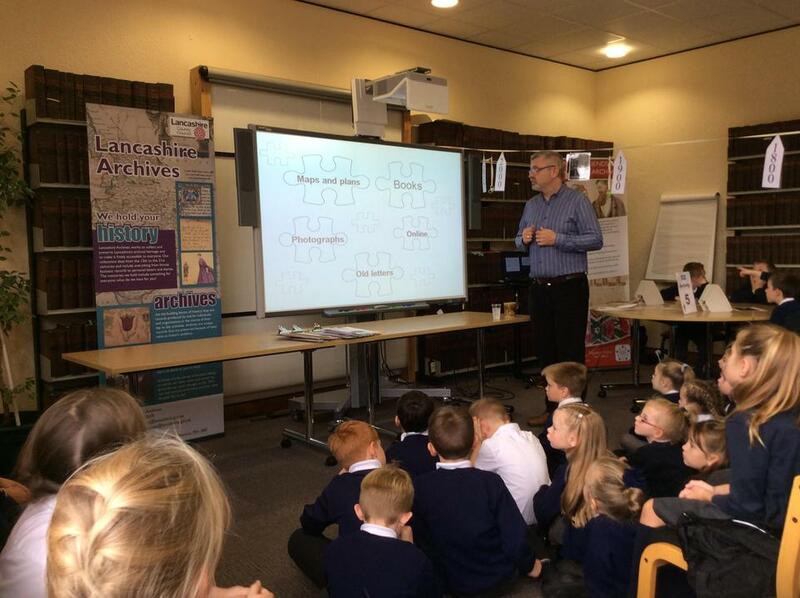 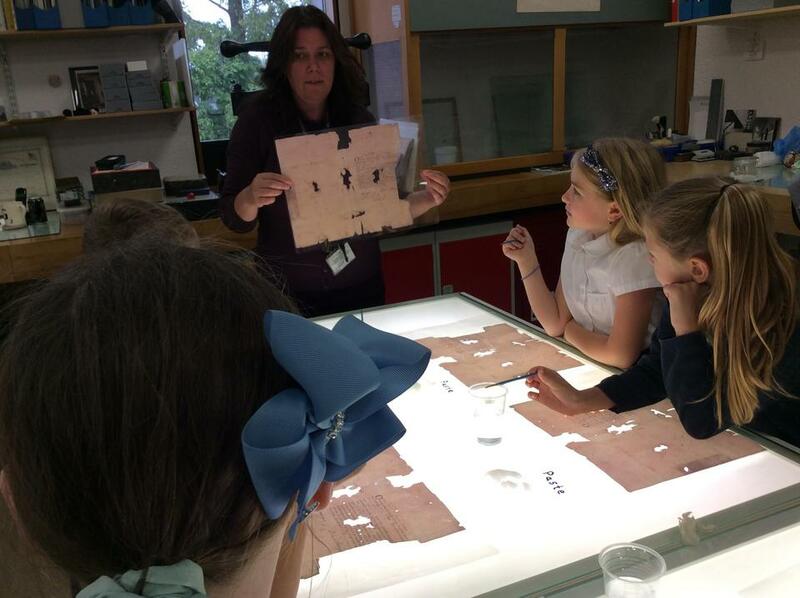 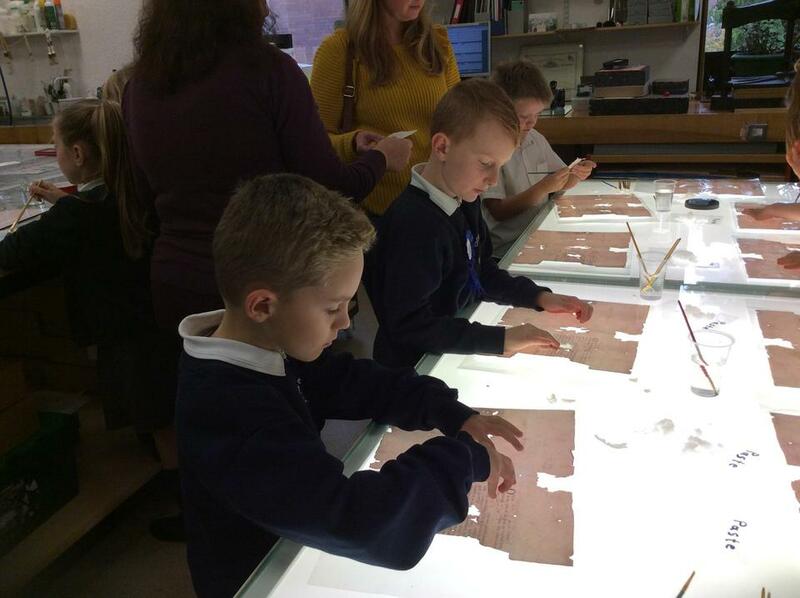 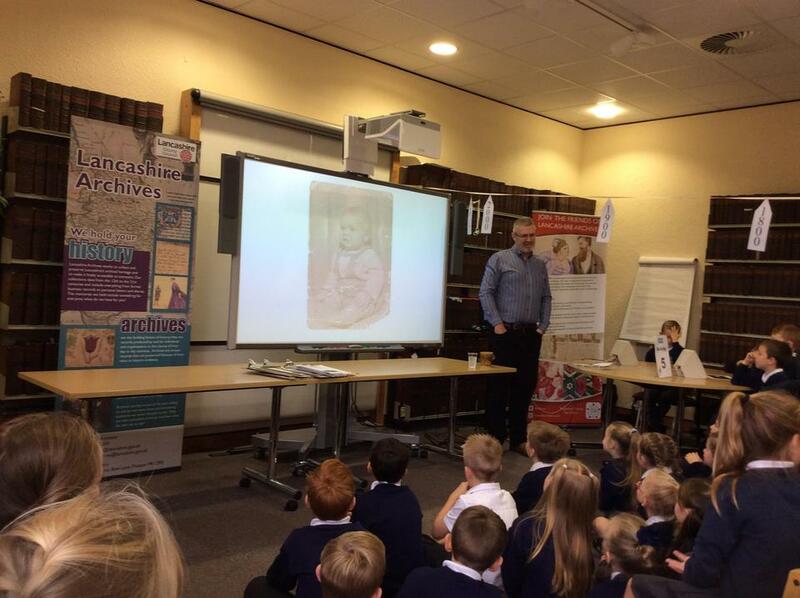 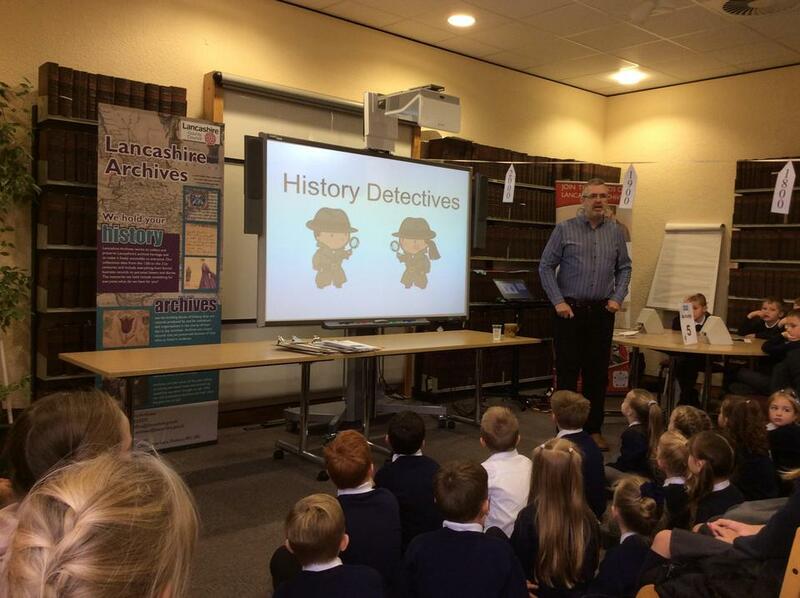 Our main topic this half-term is The Romans and what they did for us. 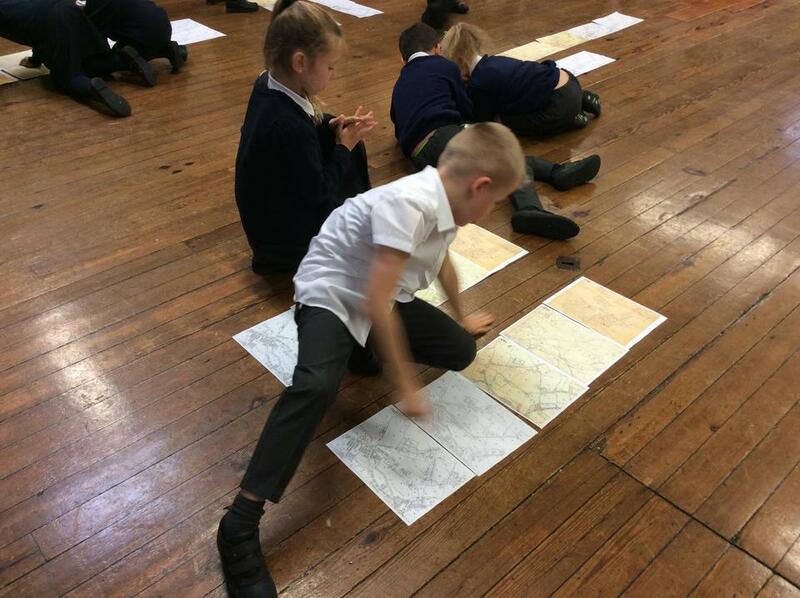 We will also be finding out about the Lake District in our geography work. 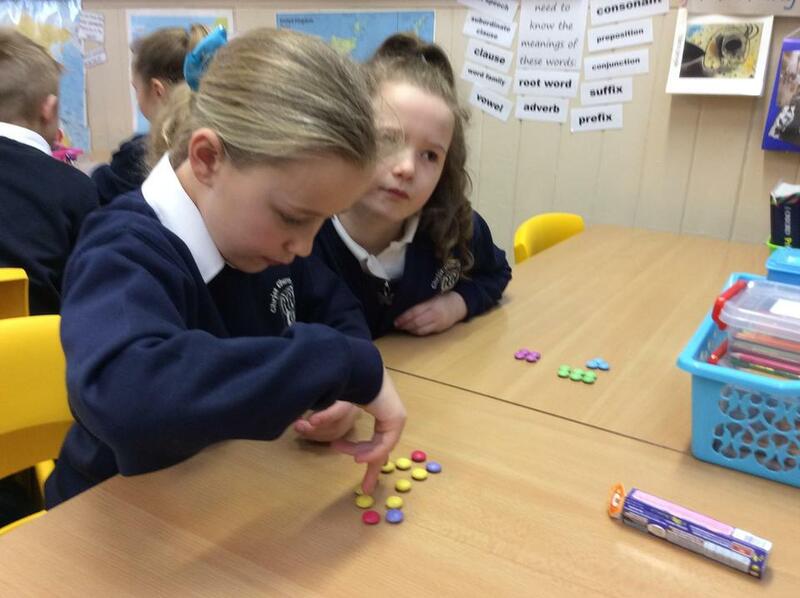 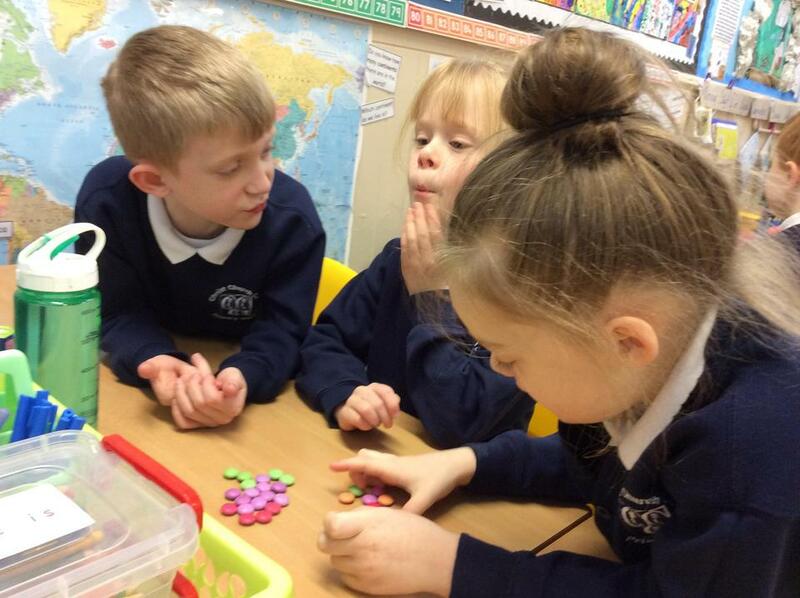 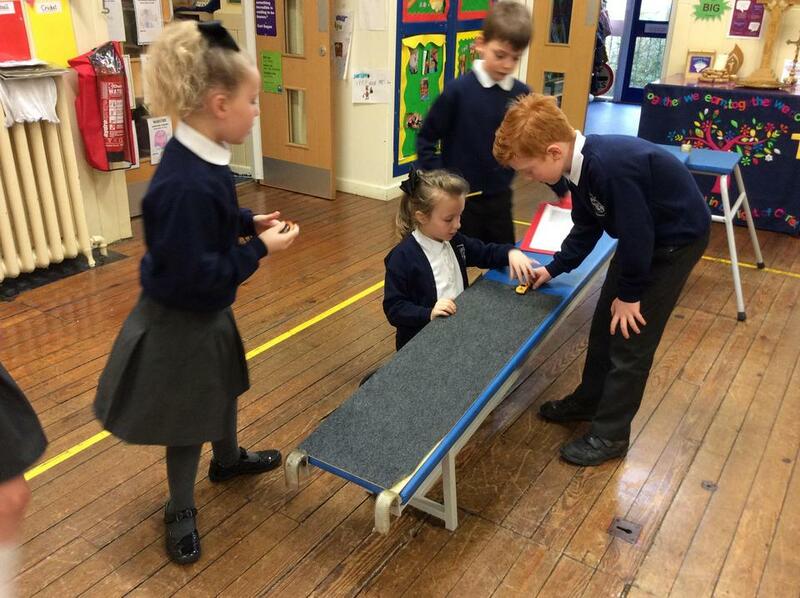 This week we have been investigating forces. 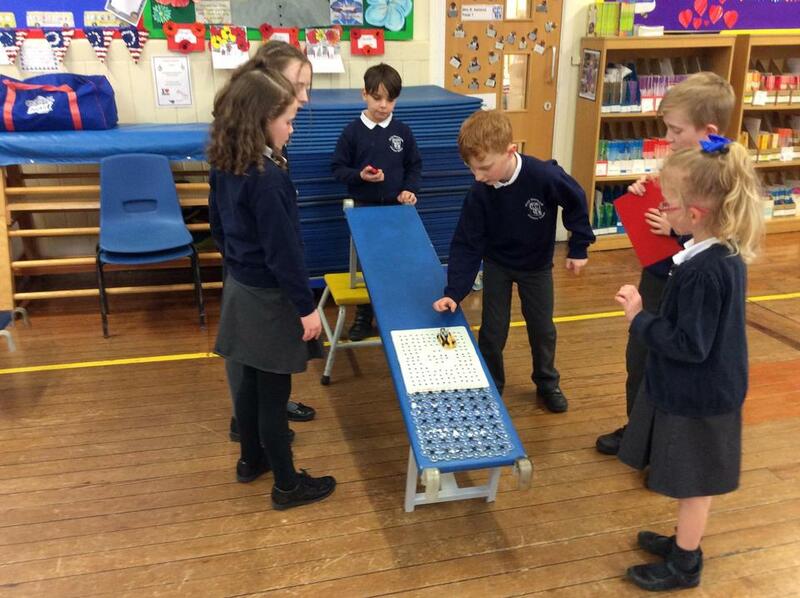 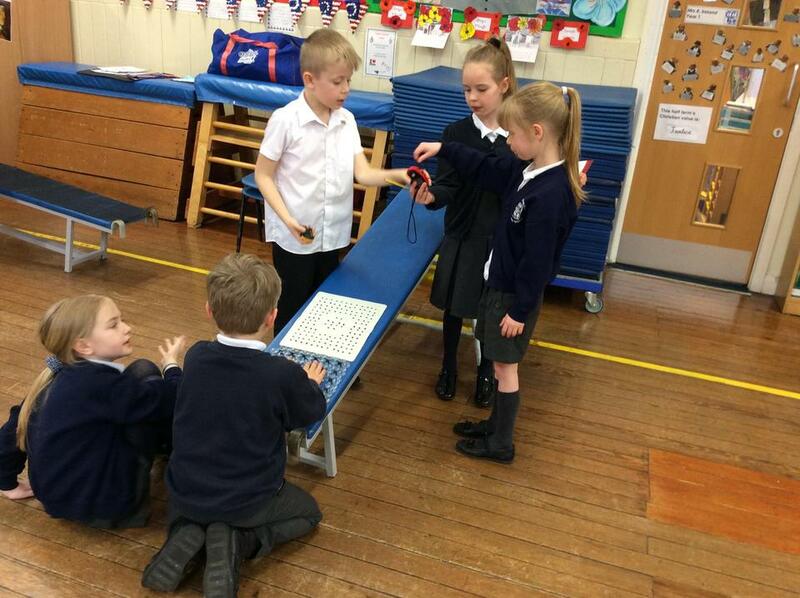 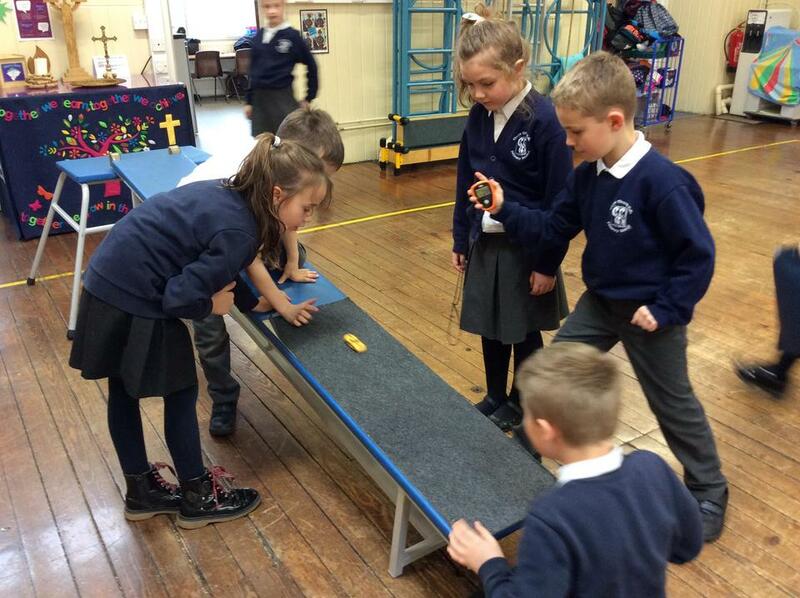 We did an experiment to find out which surface a toy car moved the quickest on. 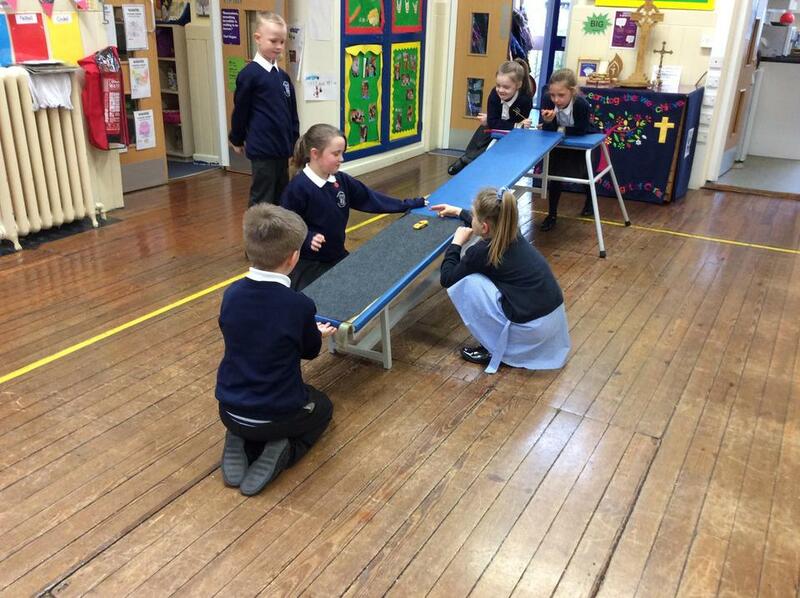 I hope we've all remembered the word friction! 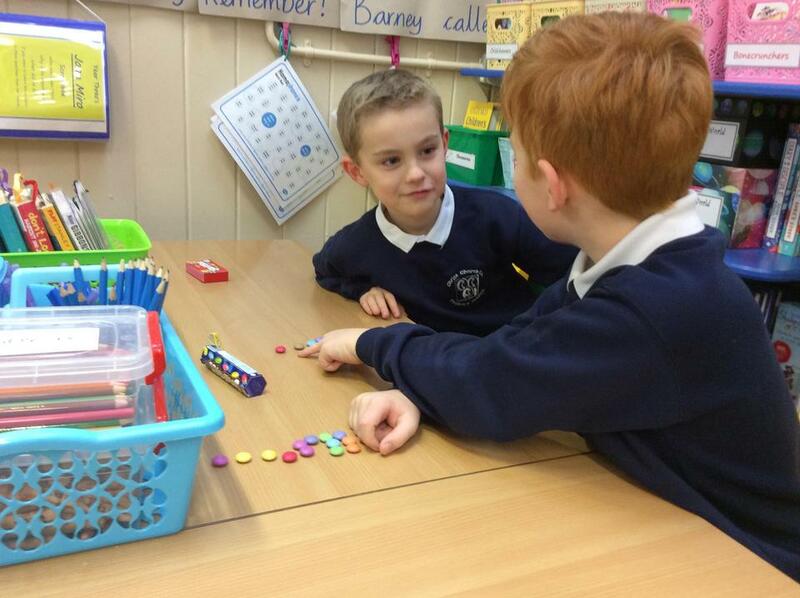 Welcome back to school for the second half of the Spring term. 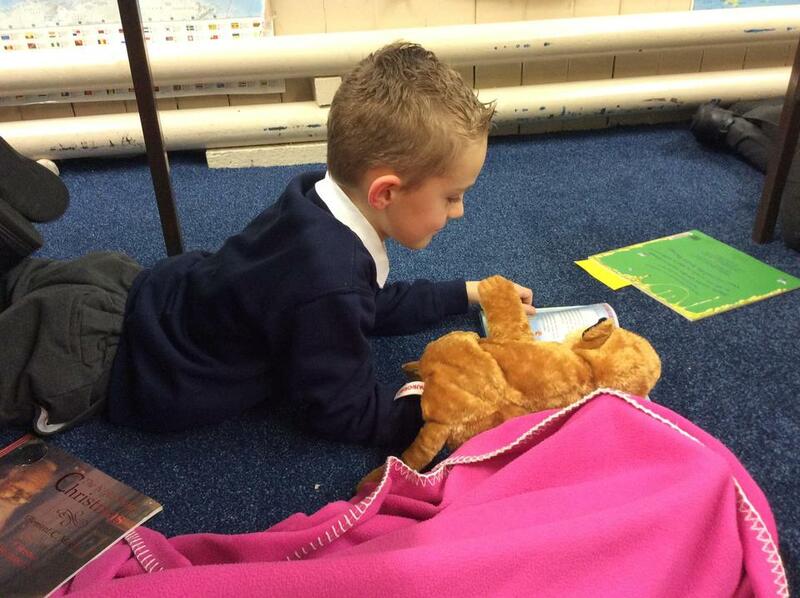 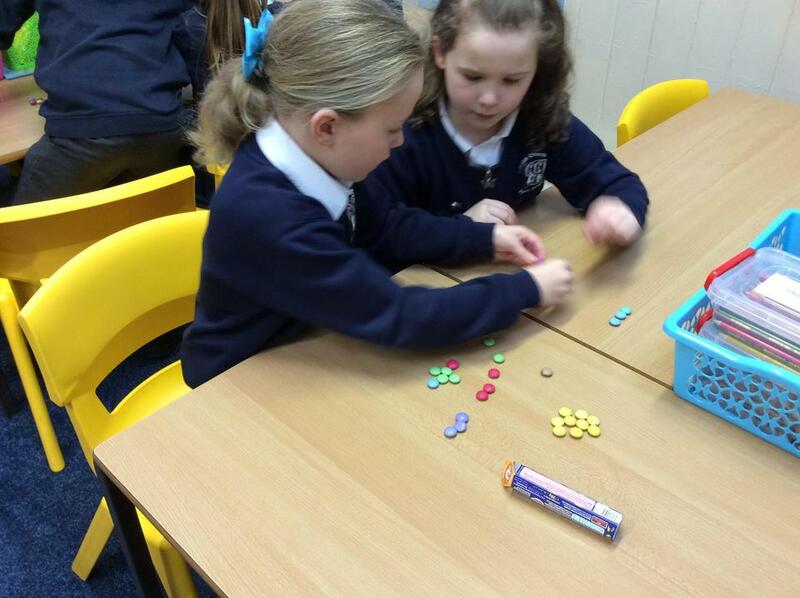 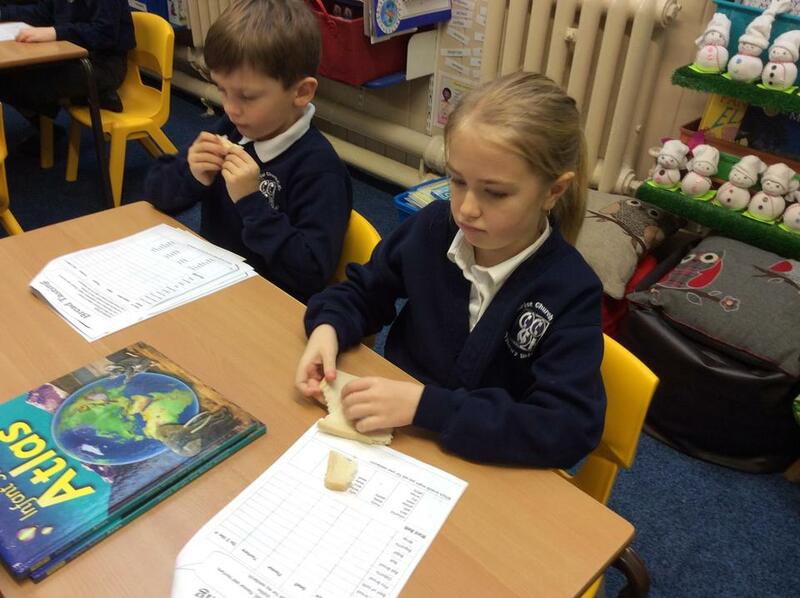 We have started the week with an activity for The Pendle Reading Challenge. 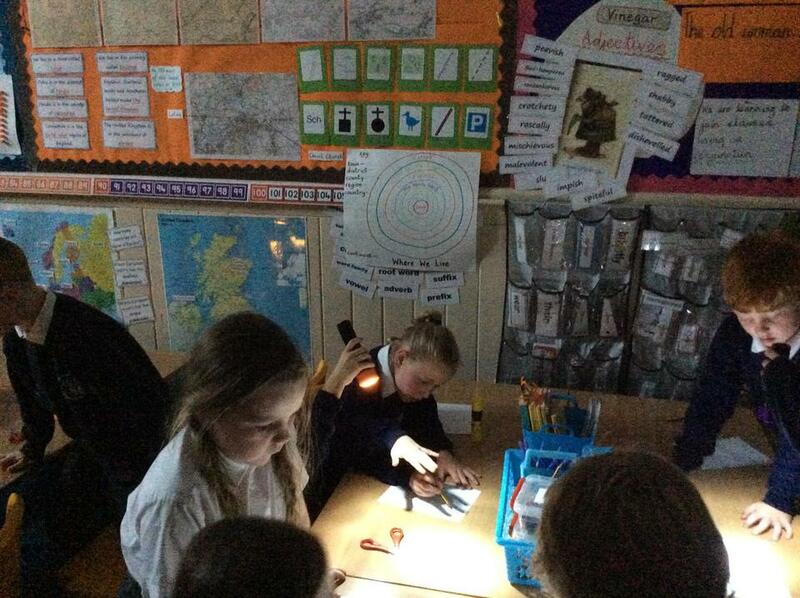 We have been using the book 'Mirror' by Jeannie Baker to find out about life in Australia and Morocco. 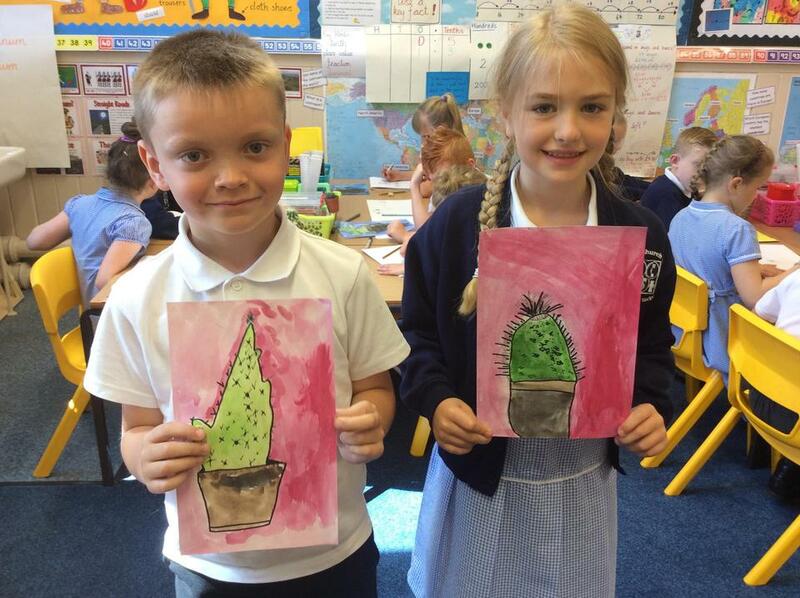 We have written pen pal letters and had a go at some Moroccan art too. 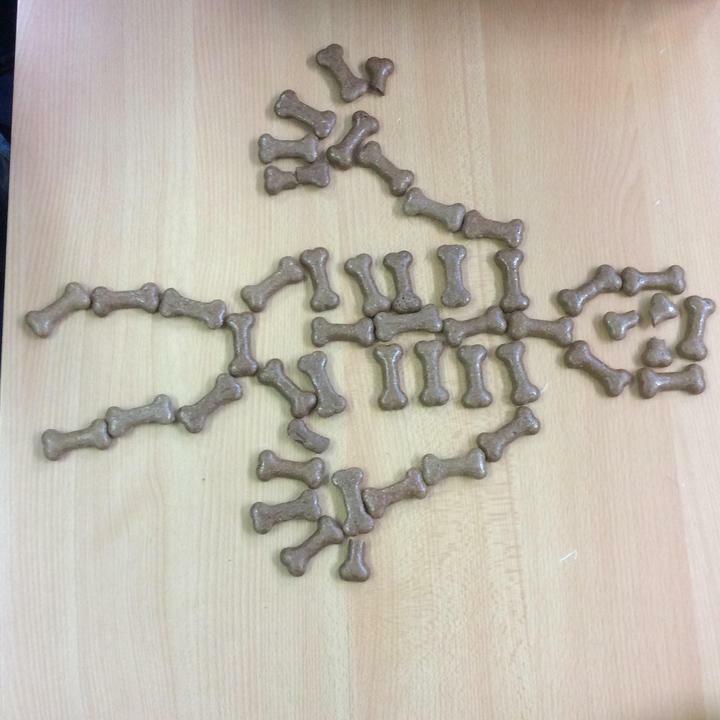 Merry Christmas, everyone! 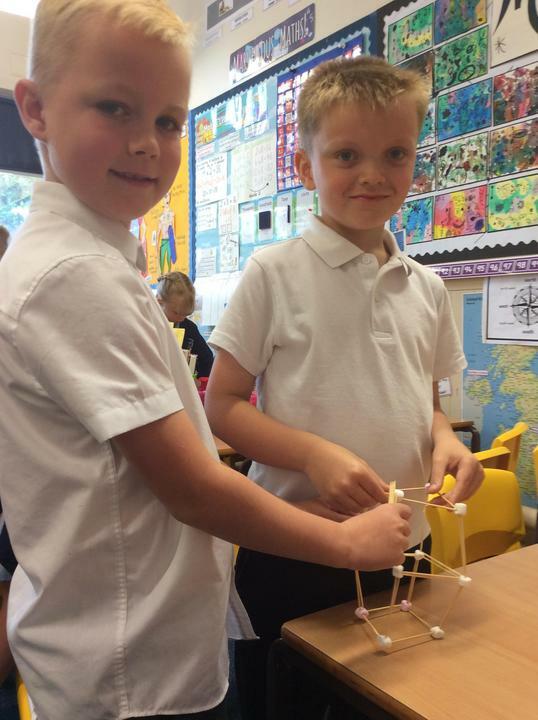 From the Year 3 snowmen! 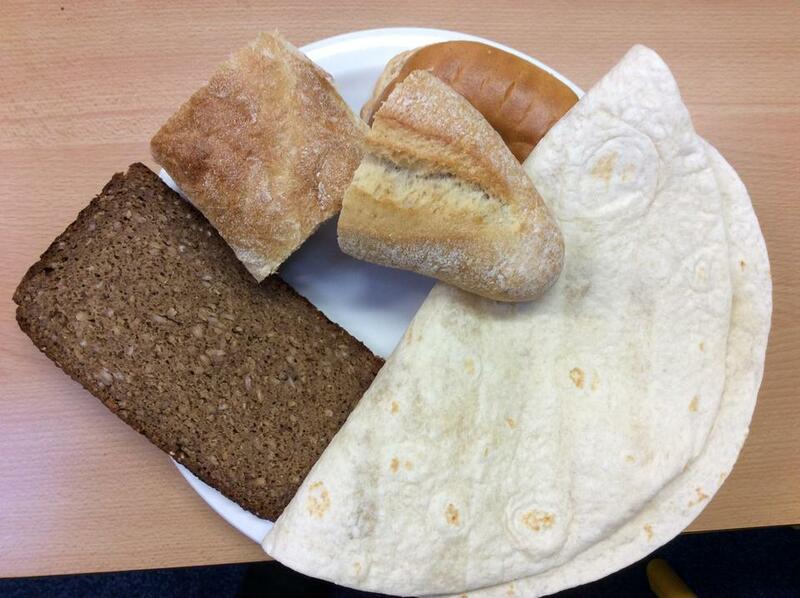 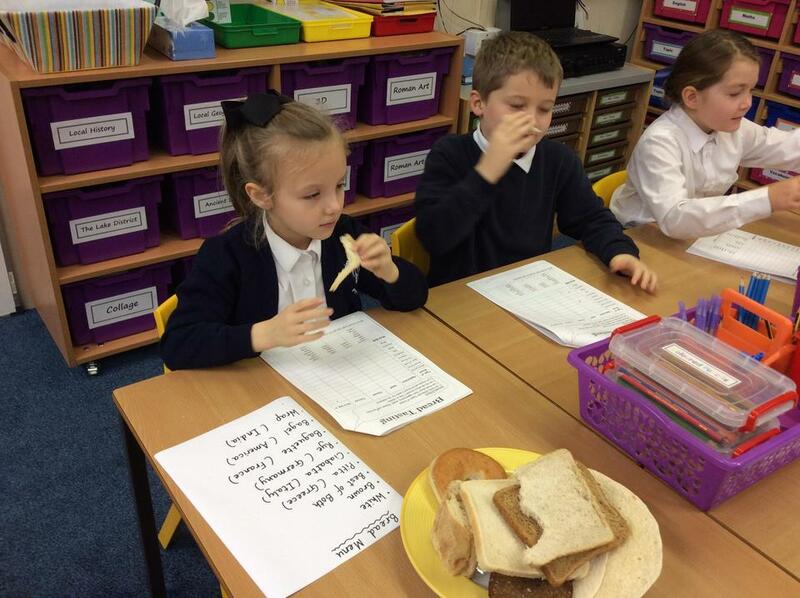 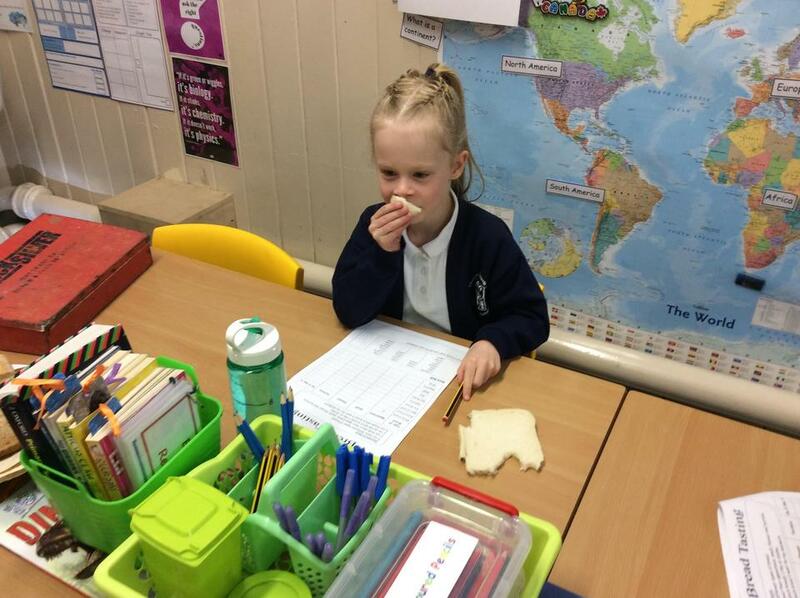 As part of our food technology work Year 3 have been taste testing different types of bread. 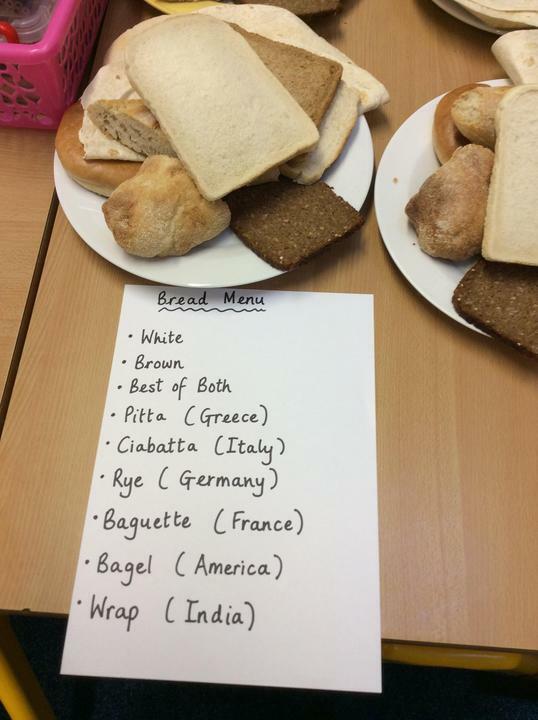 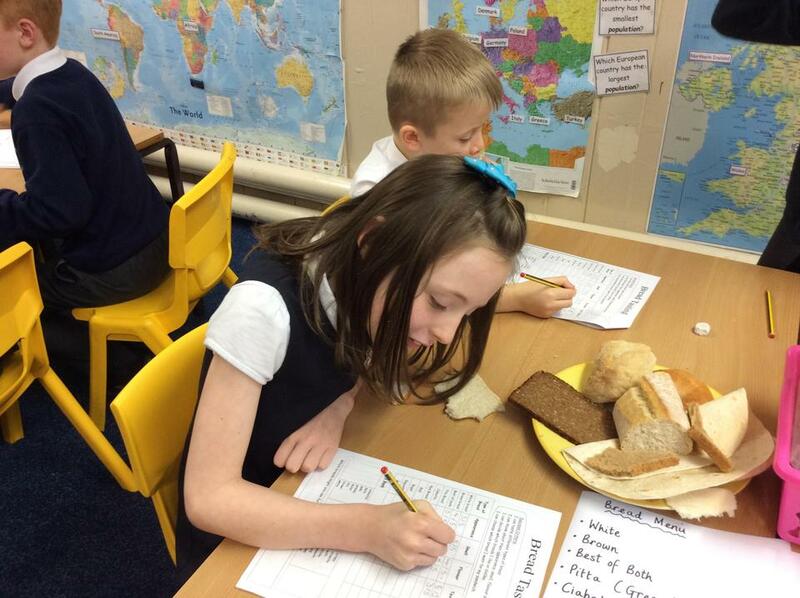 We also took the opportunity to find out which countries the breads originated from. 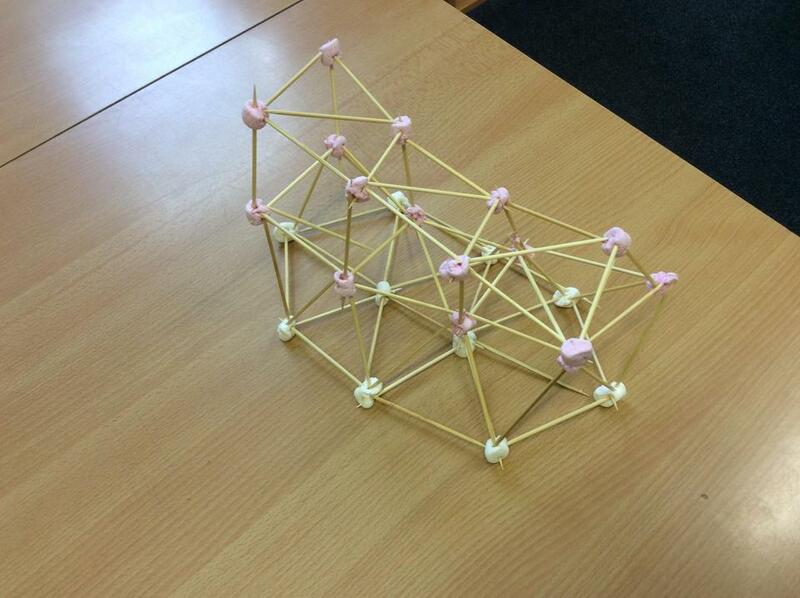 As part of our work in Art and Design we have been looking at the 3D work of Peter Anton. 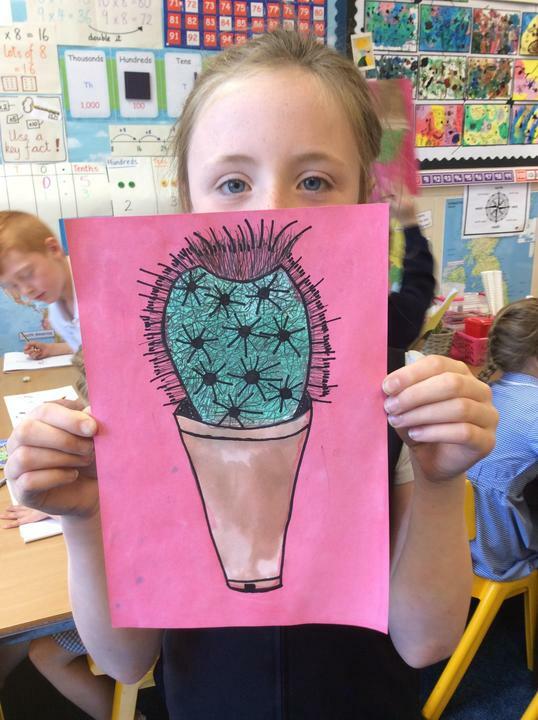 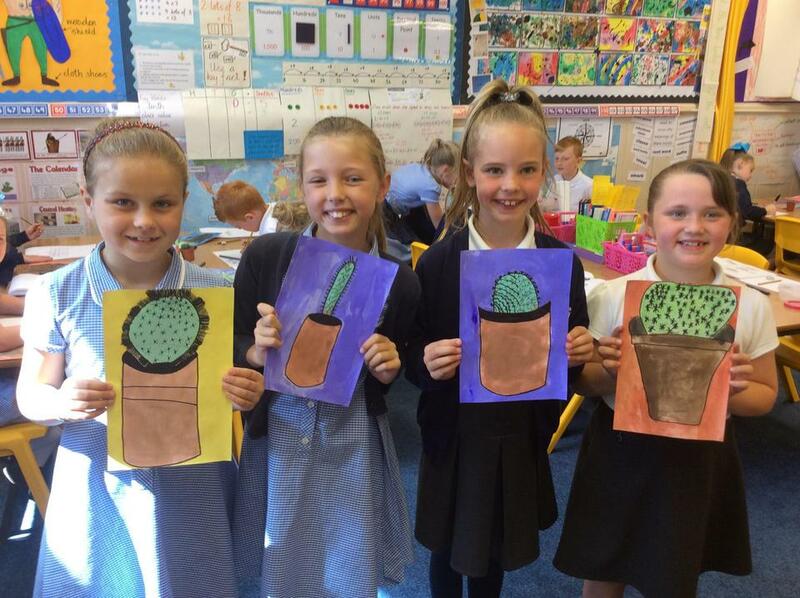 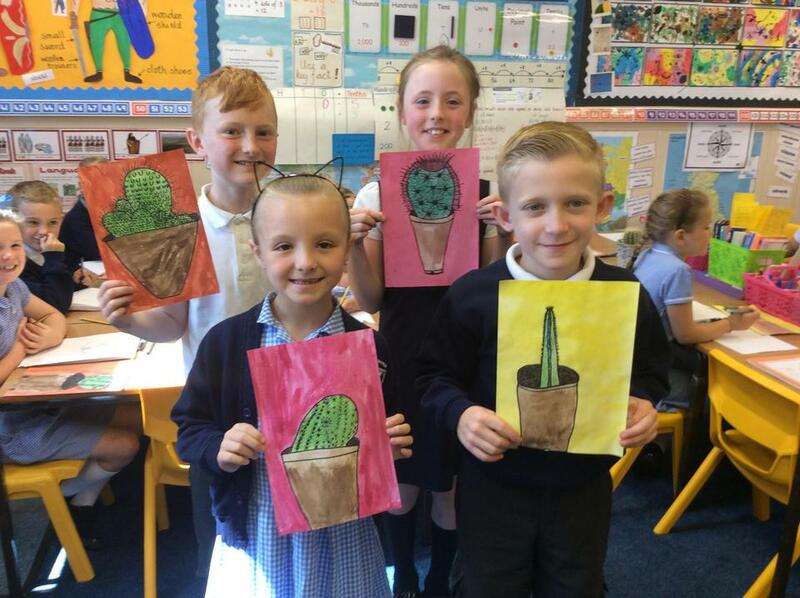 This has inspired us to create our own 3D art work with clay. 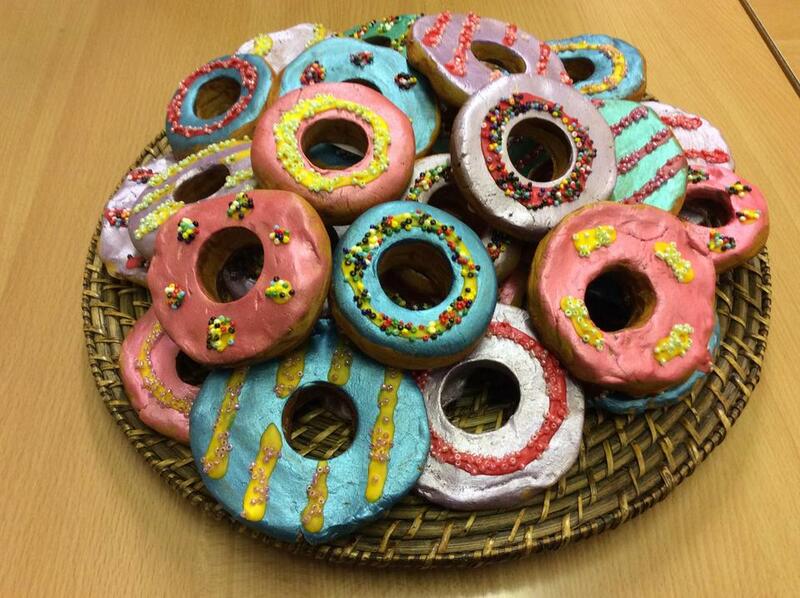 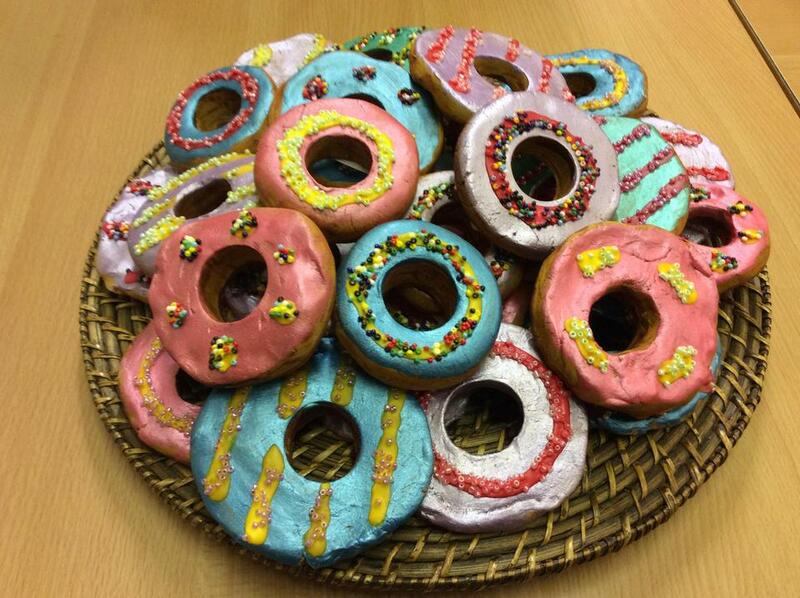 Doughnuts, anyone? 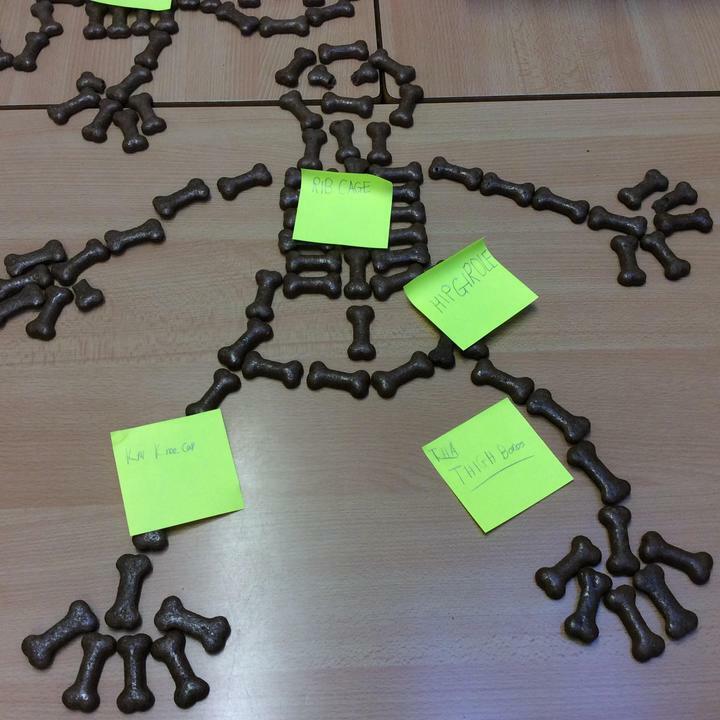 This week Year 3 have been thinking about the main functions of the human skeleton. 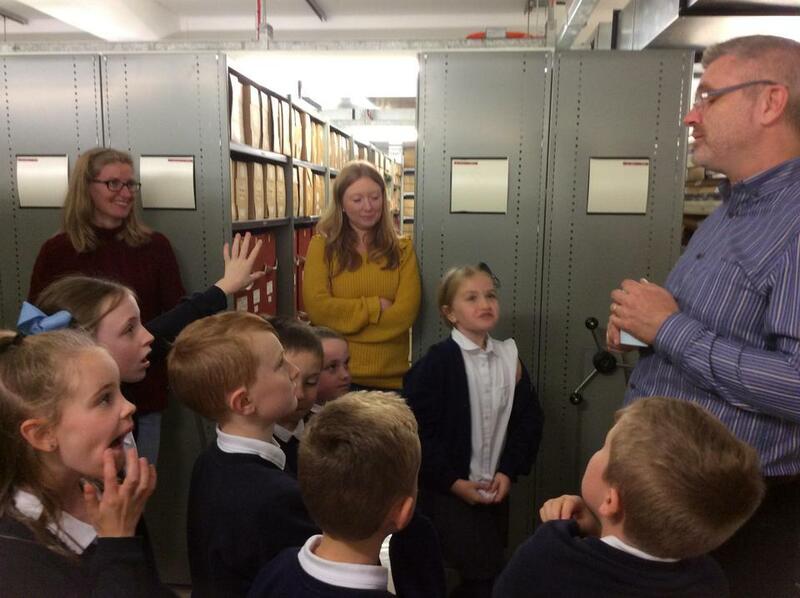 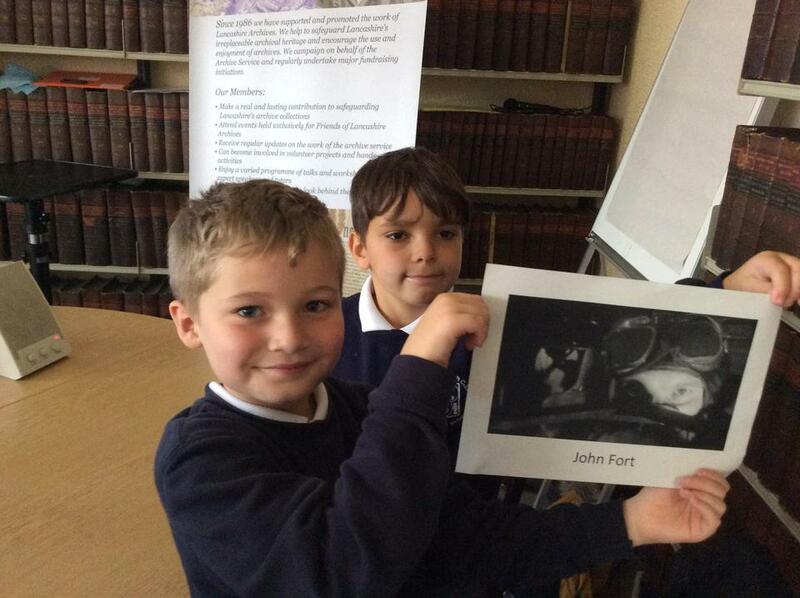 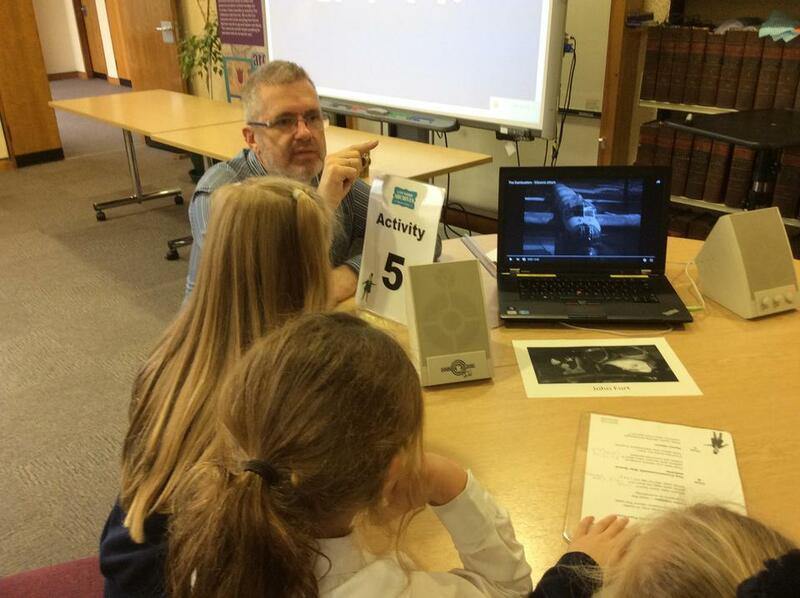 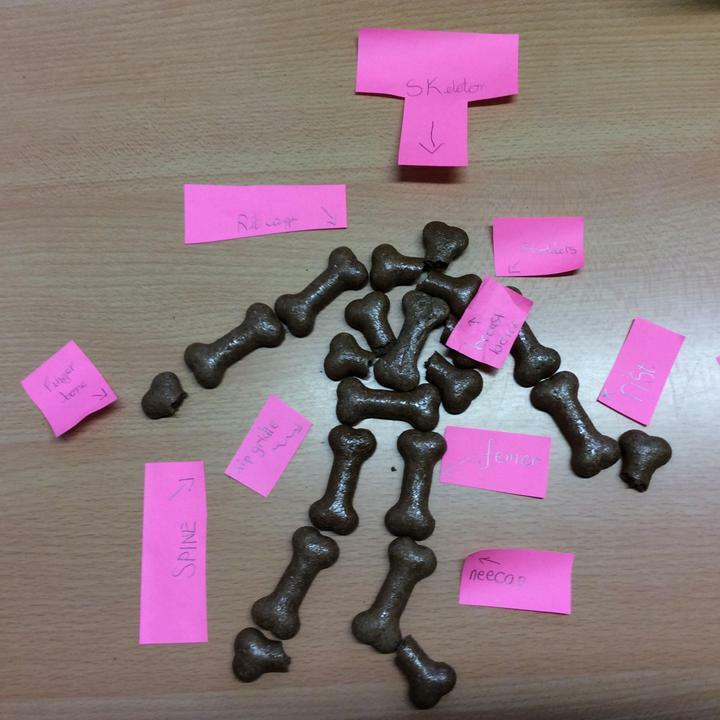 We have also tried to remember the 'scientific' names for some of the bones. 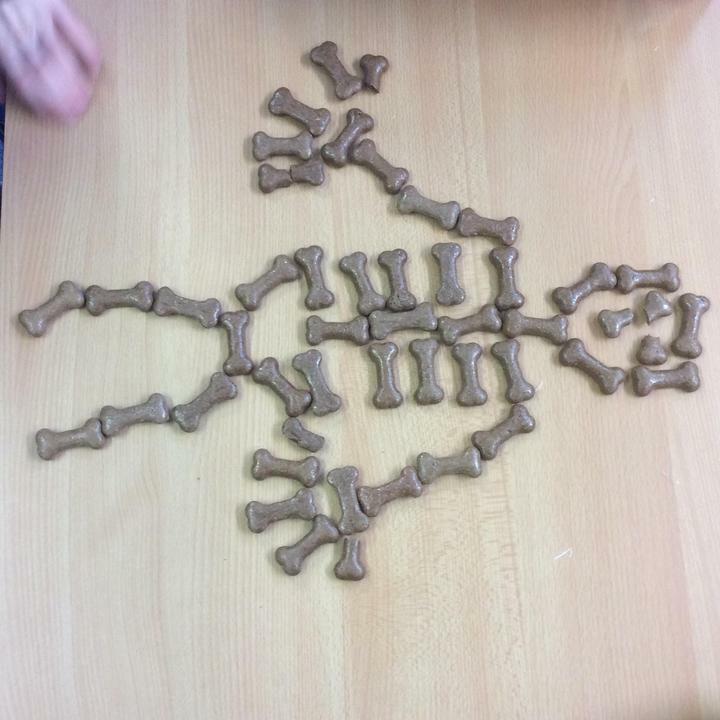 We had some fun replicating skeletons using bone shaped dog biscuits! 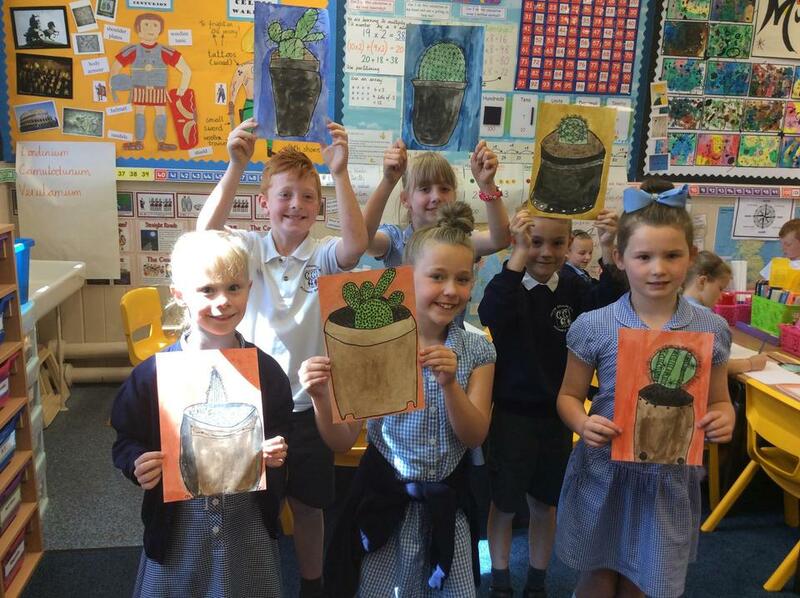 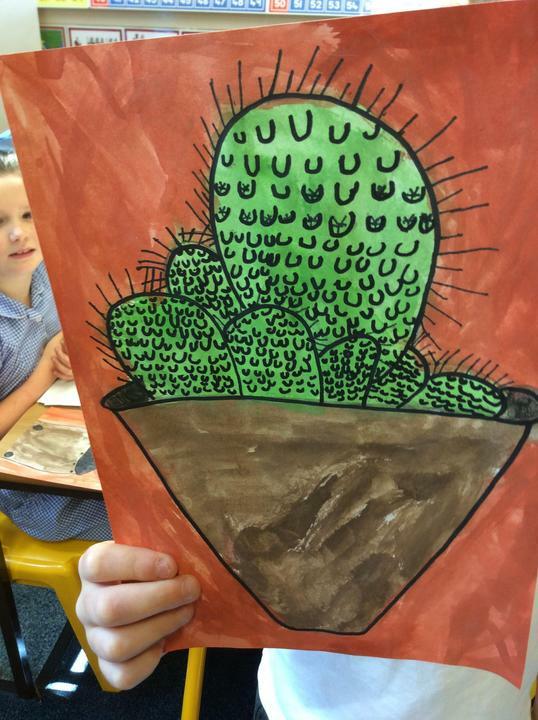 Take a look at the culmination of Year Three's study of the artist Joan Miro. 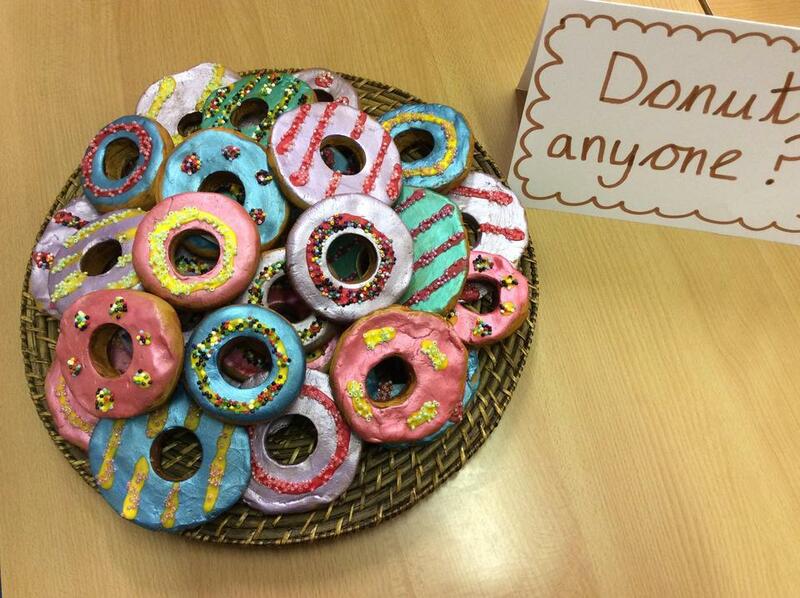 This display makes our classroom an interesting and vibrant place to be! 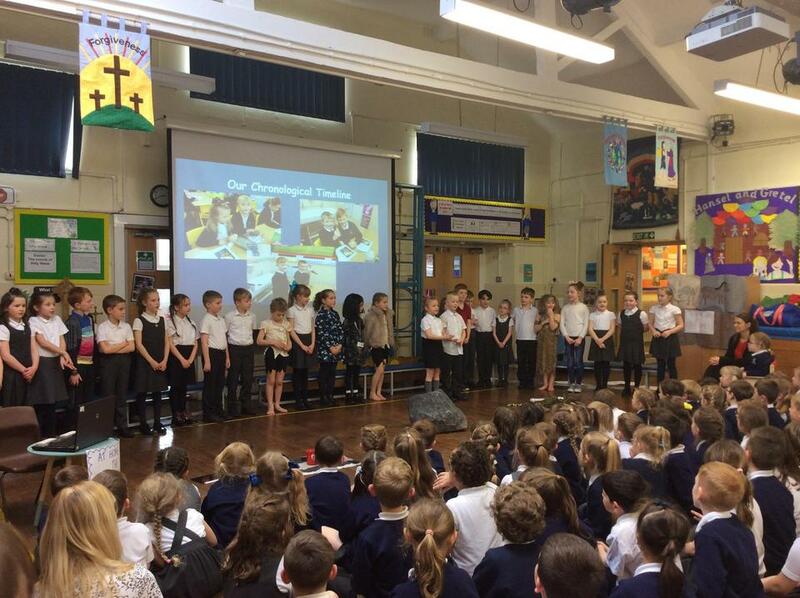 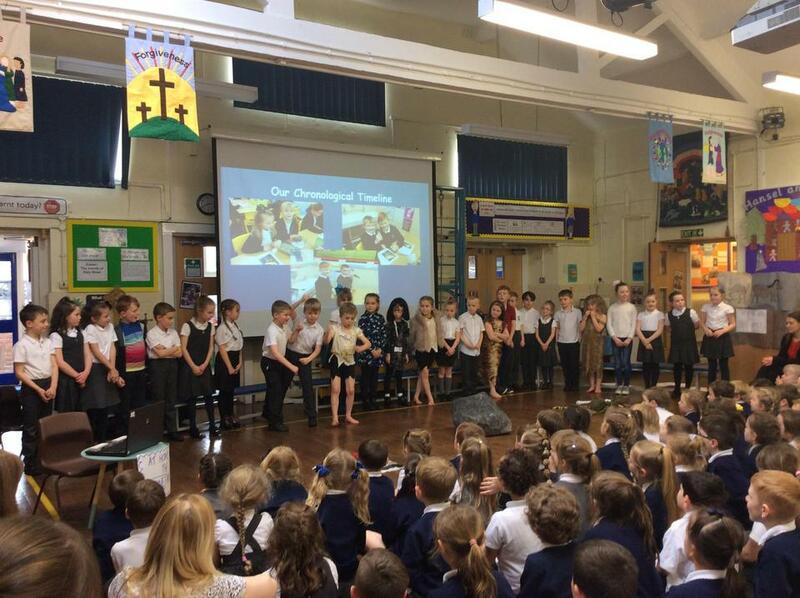 Well done, Year 3! 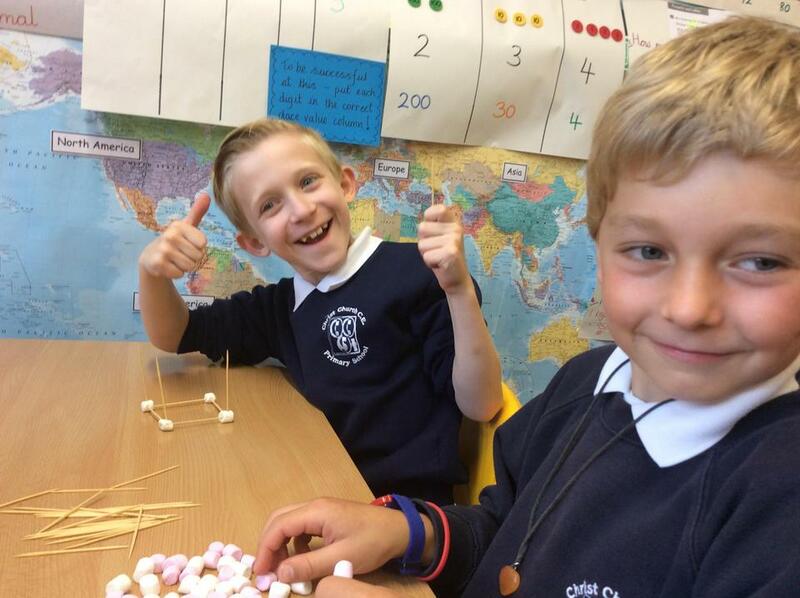 Welcome back to a new half term everyone! 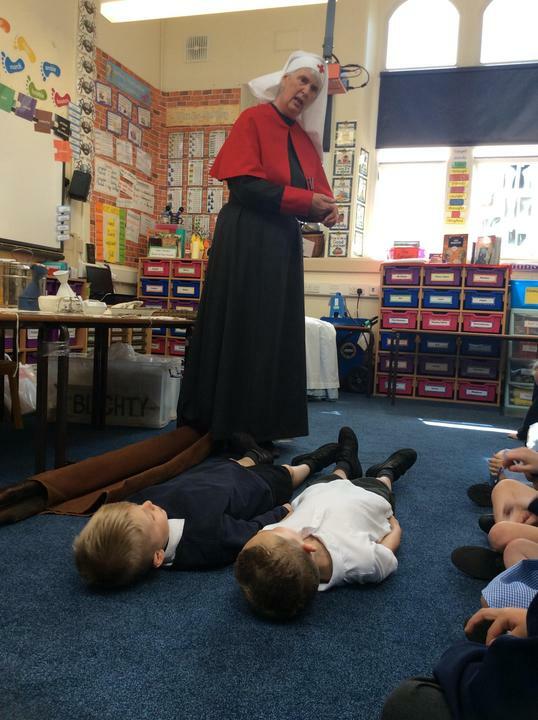 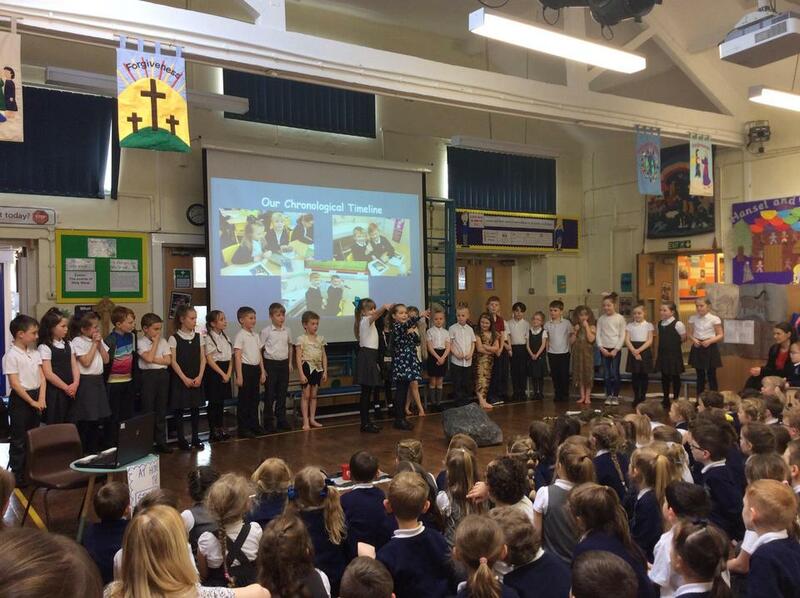 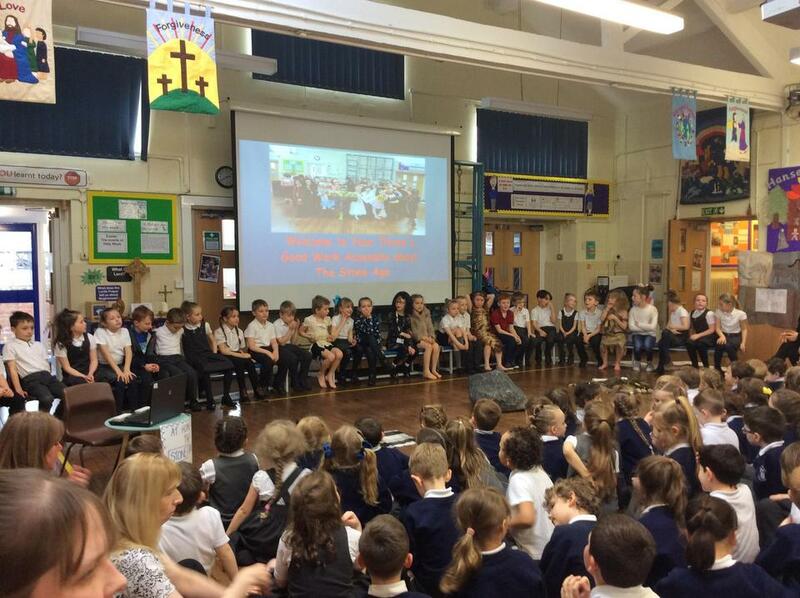 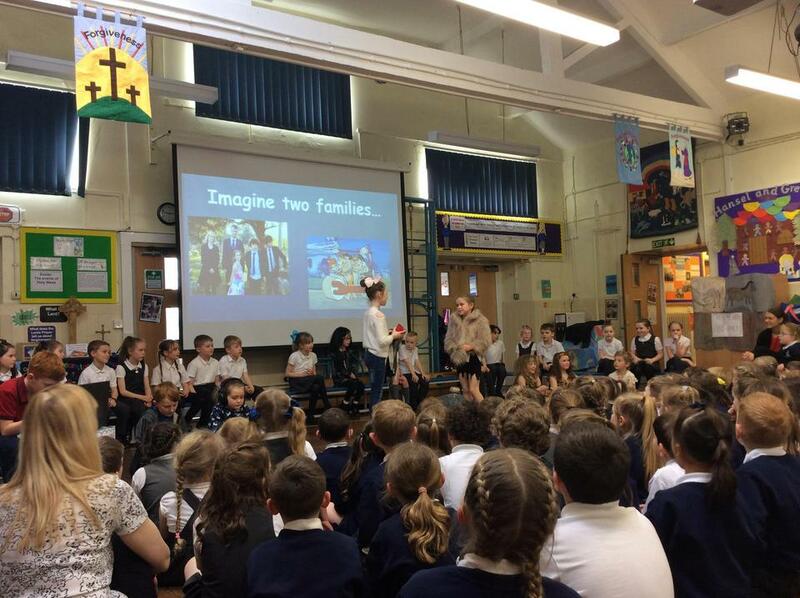 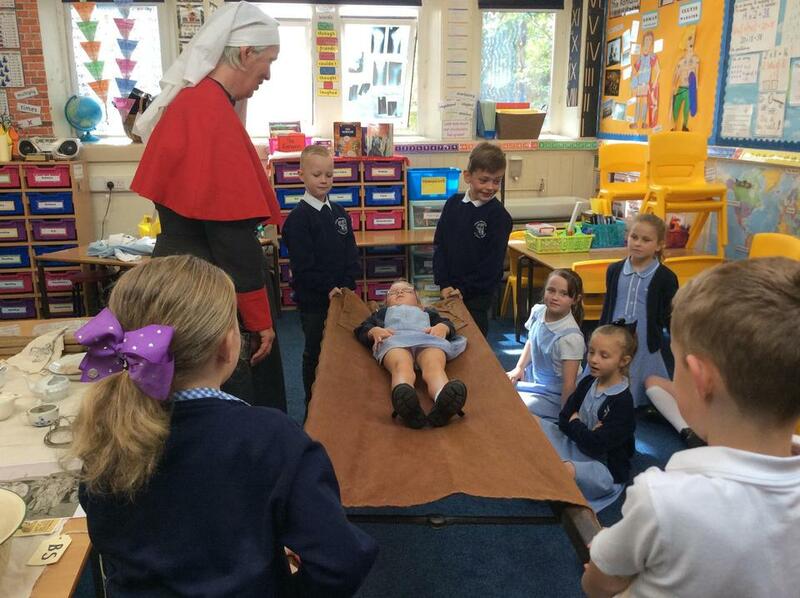 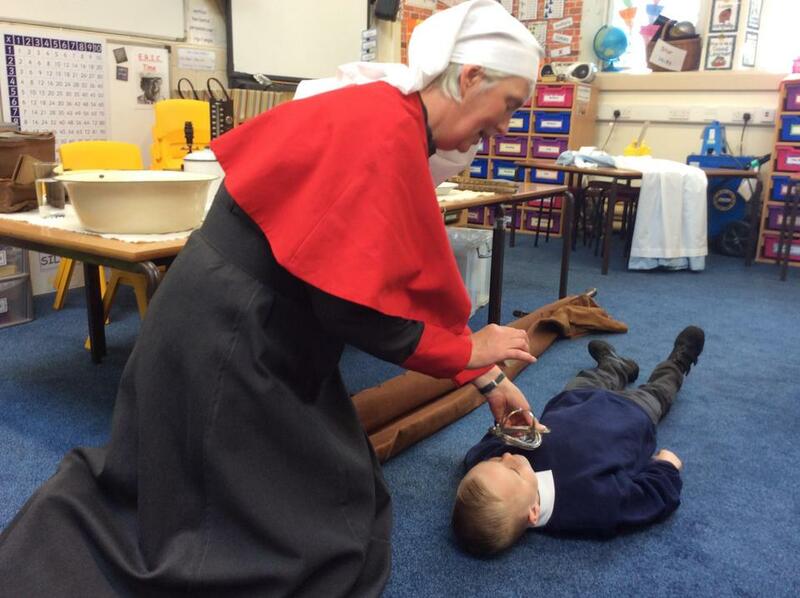 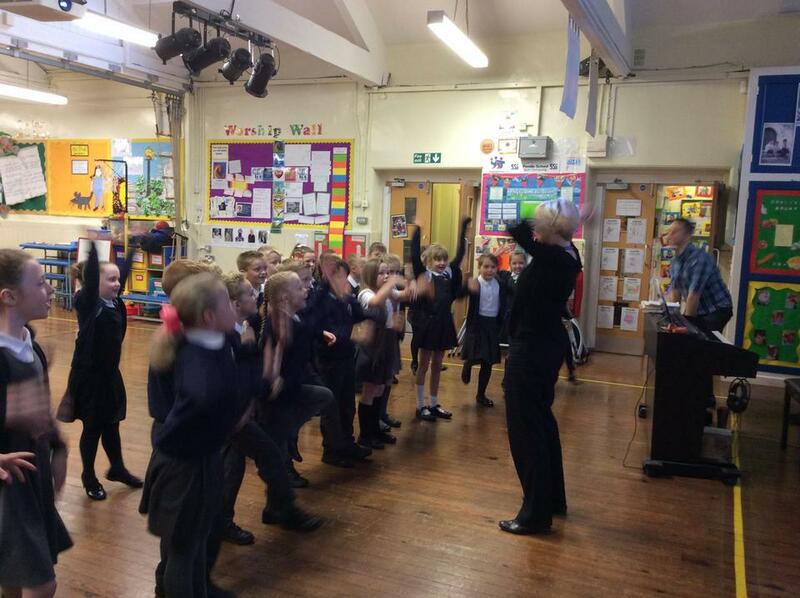 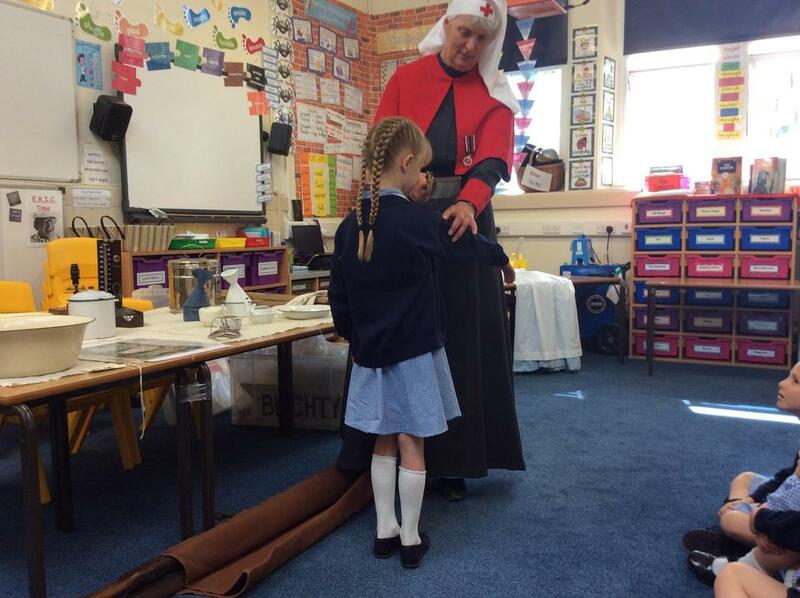 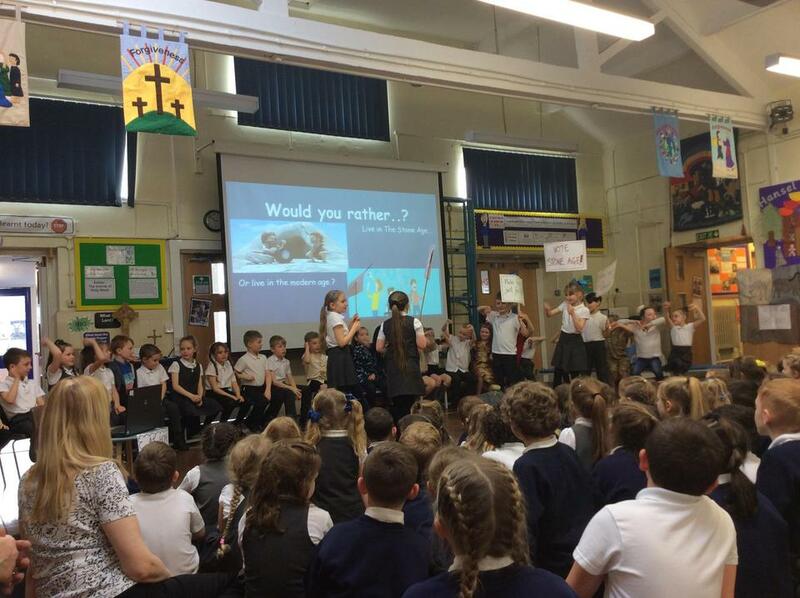 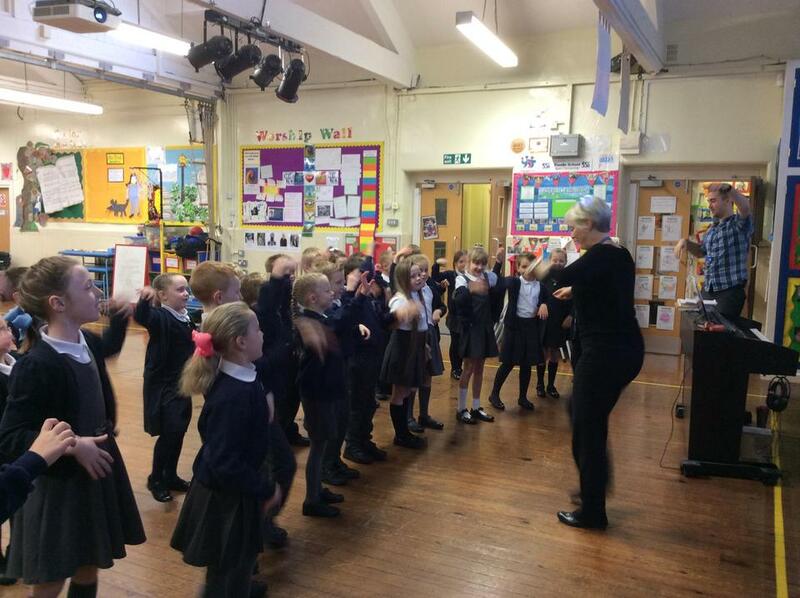 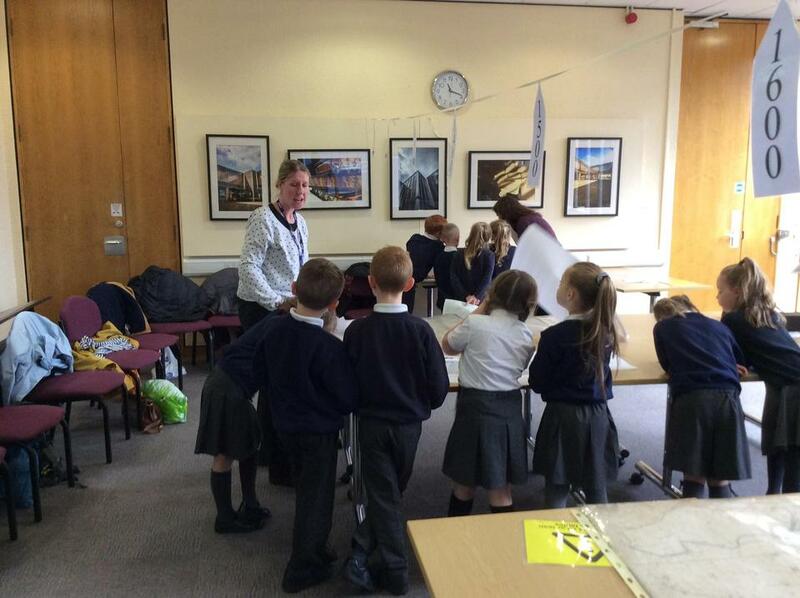 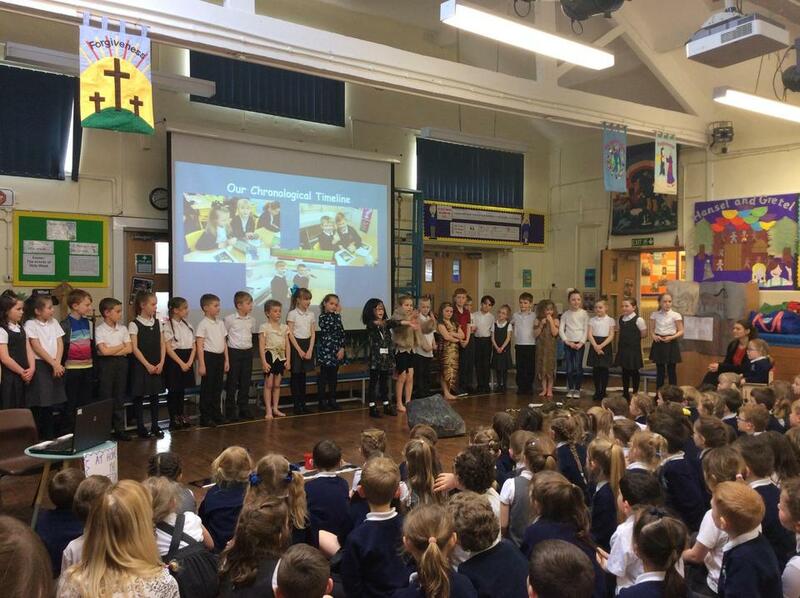 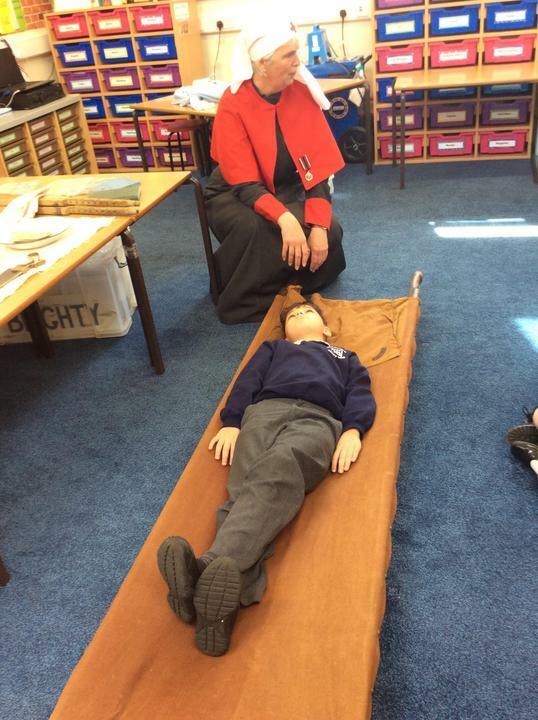 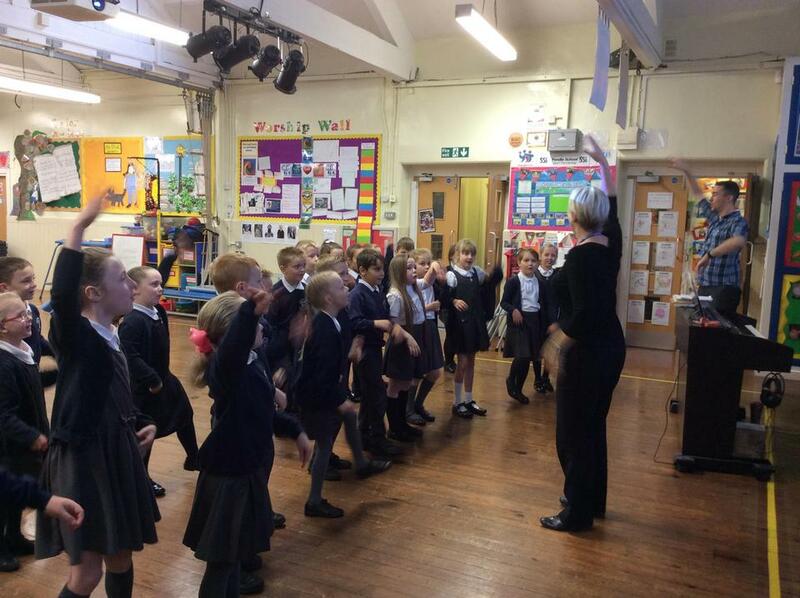 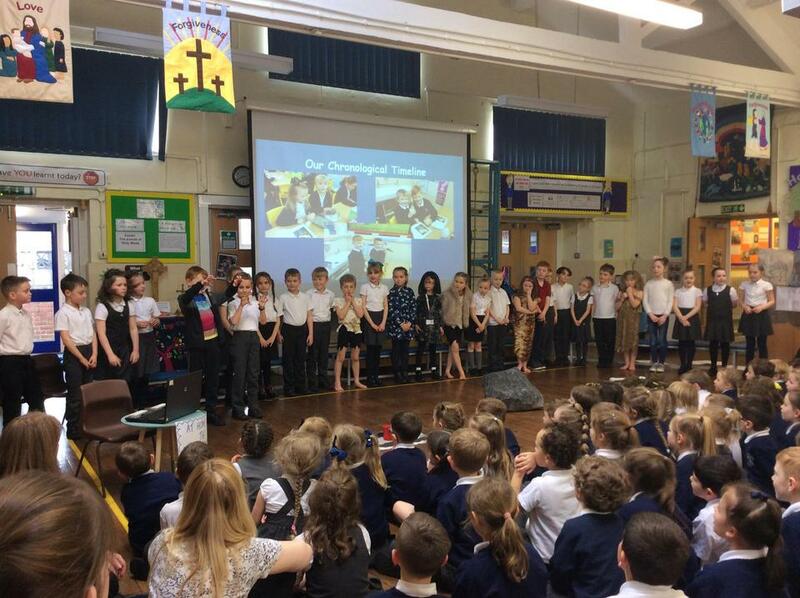 Today Year 3 had their first 'Sing Together' session with Gill and George from Blackburn Cathedral. 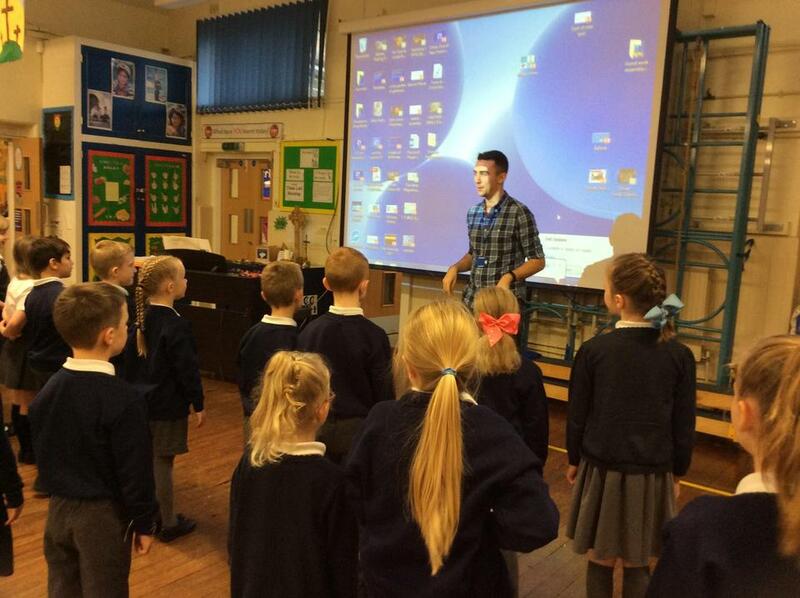 We have eight songs to learn in readiness for a concert with other local schools. 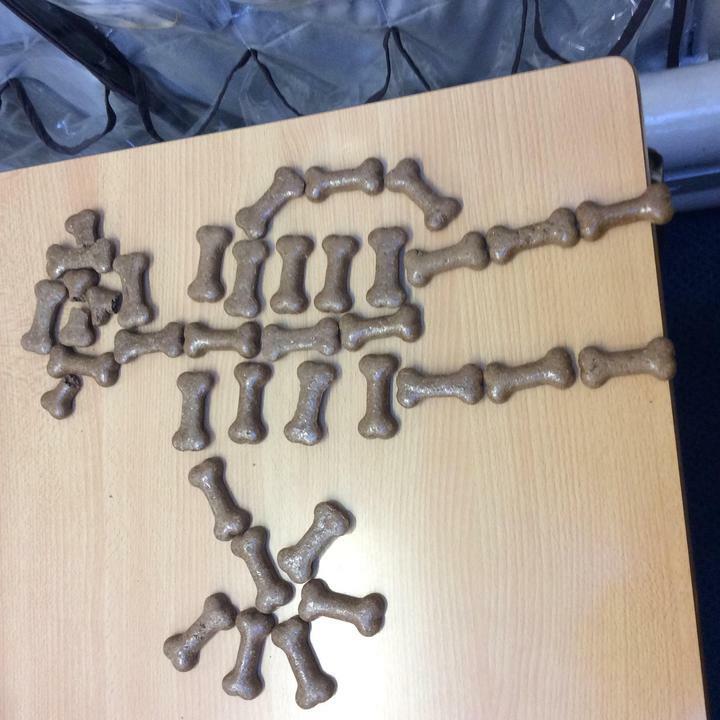 In R.E. 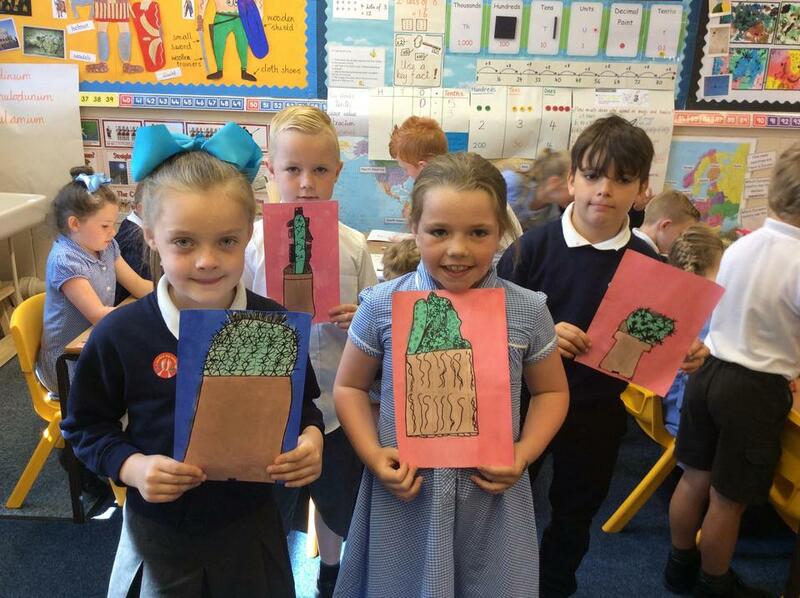 this week Year 3 have been finding out about The 5 Pillars of Islam which guide Muslims in how to live their lives. 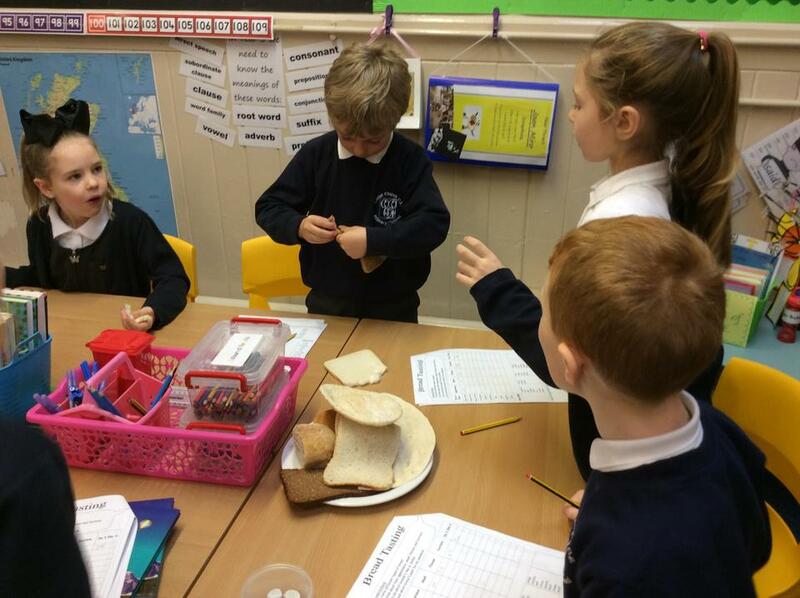 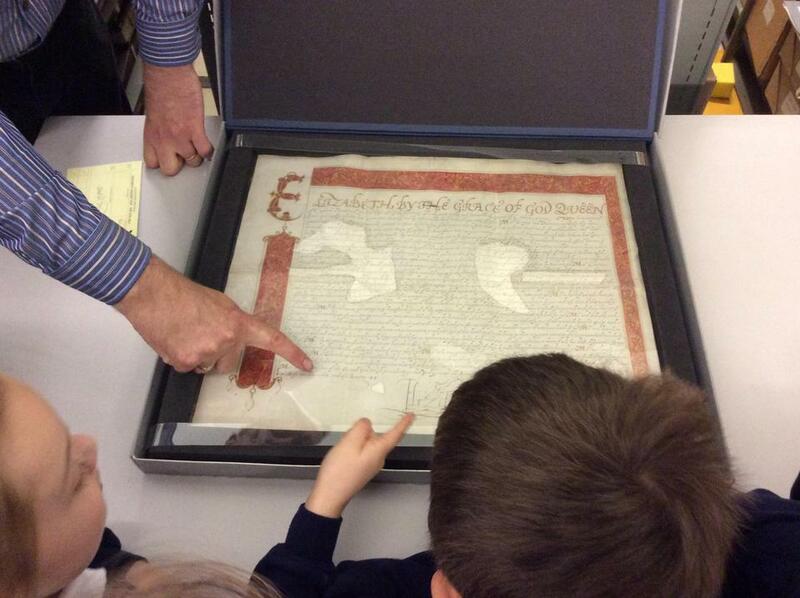 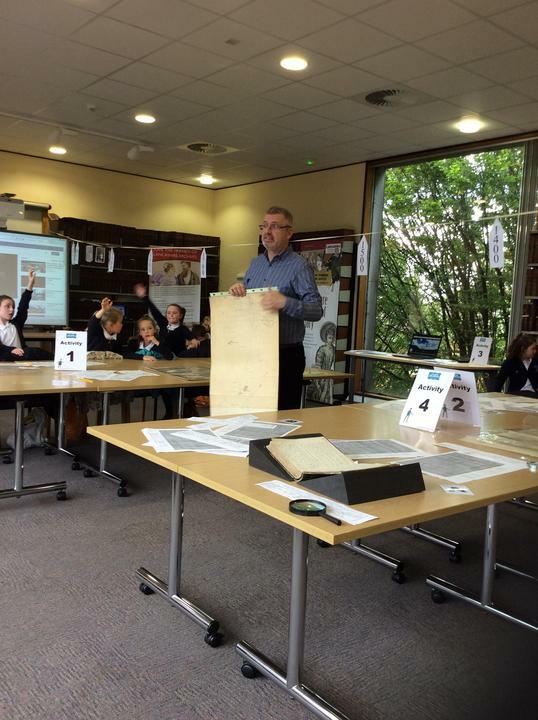 We enjoyed having a look at some special objects used in the Islamic faith. 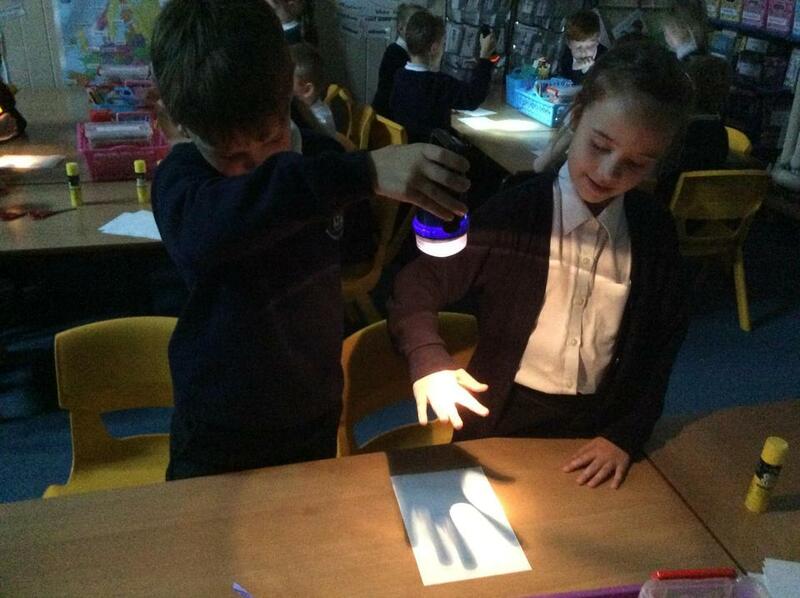 In Science this week Year 3 have been investigating how shadows are formed. 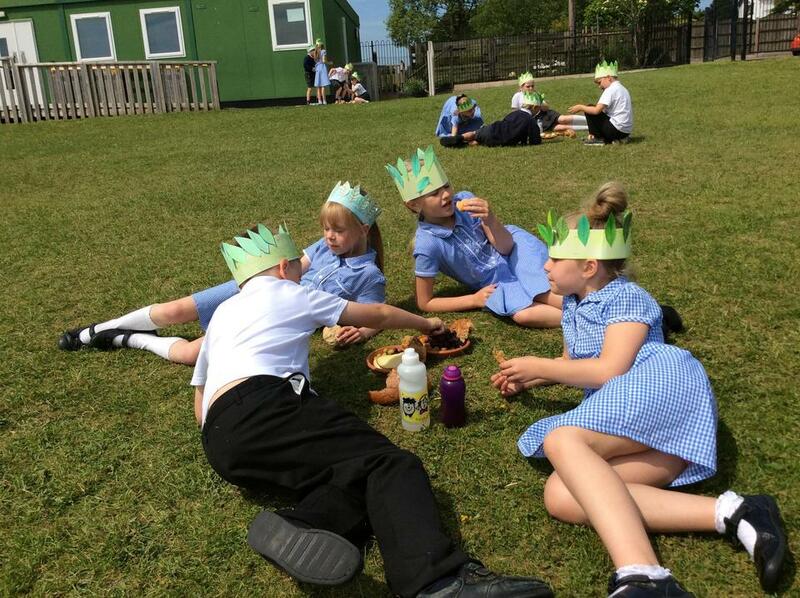 On Monday we went outside when the sun was out (we didn't have long!) 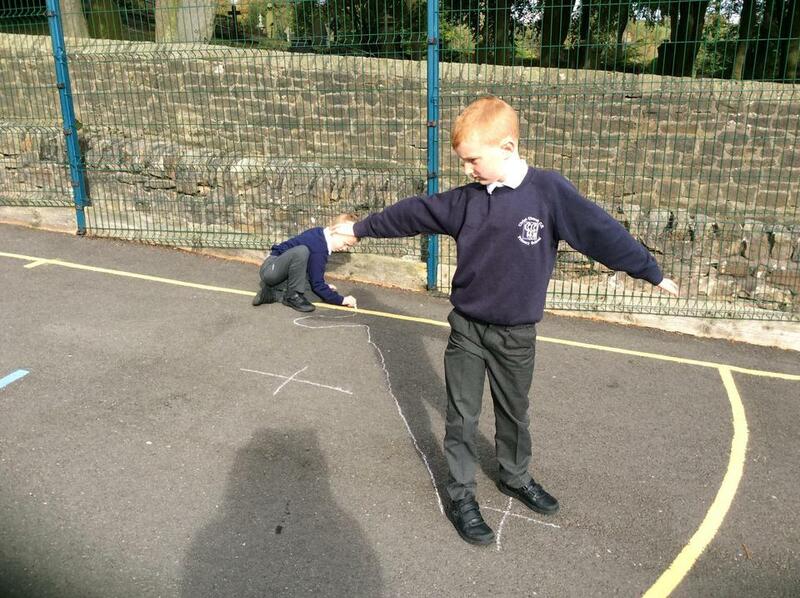 to draw round the shadows our bodies made. 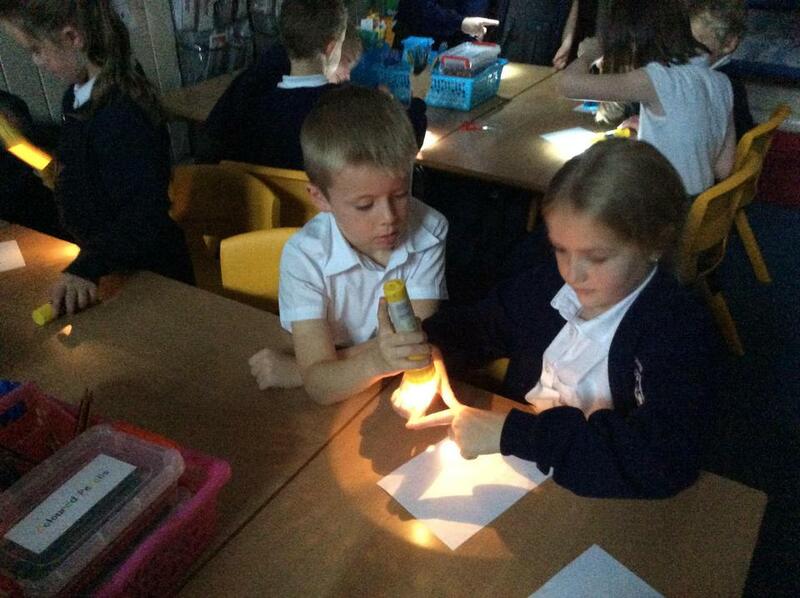 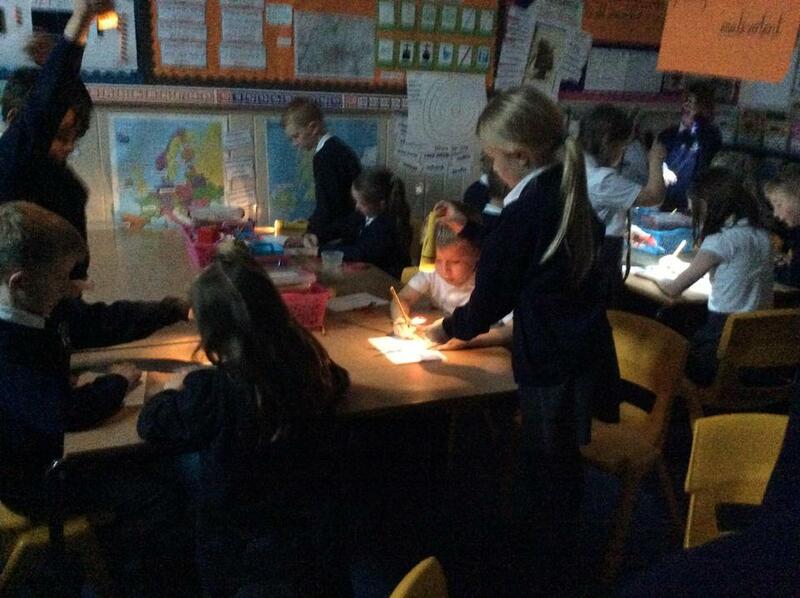 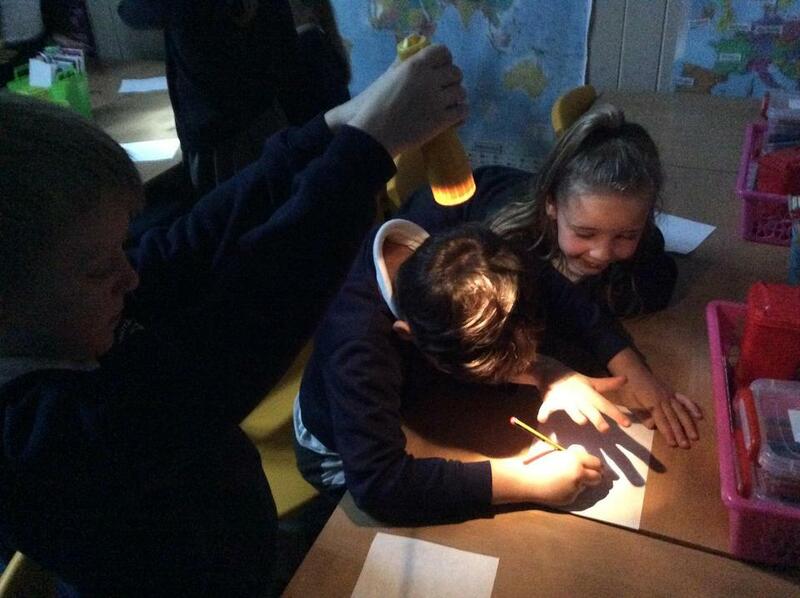 Back in the classroom we used torches as a light source to make shadows from different objects. 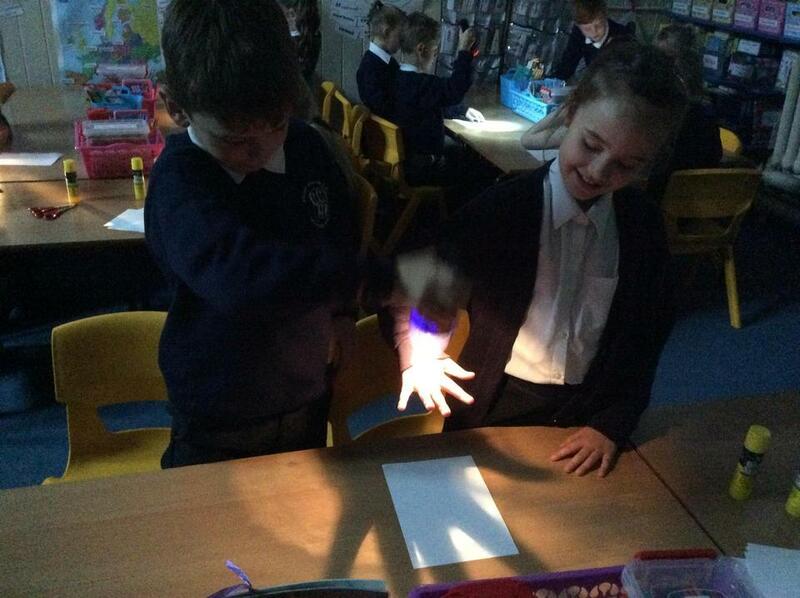 The children did really well at using some scientific words like transparent and opaque. 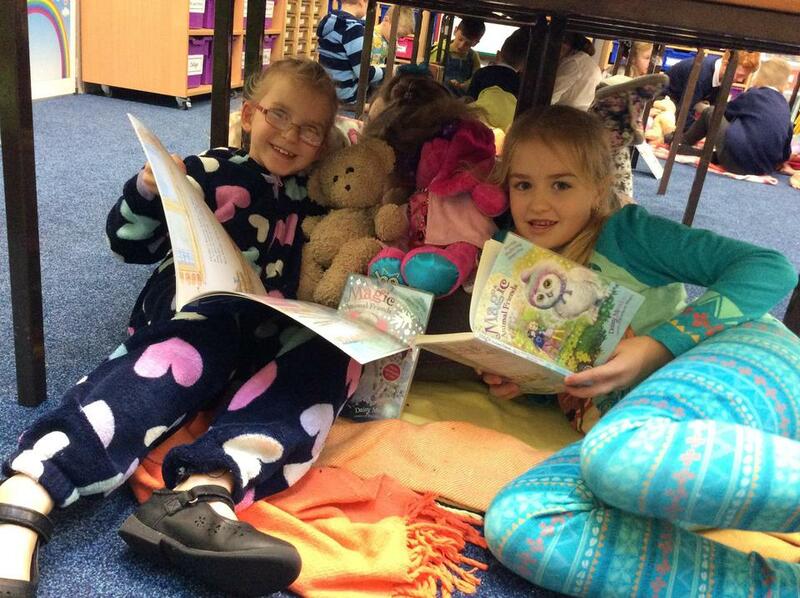 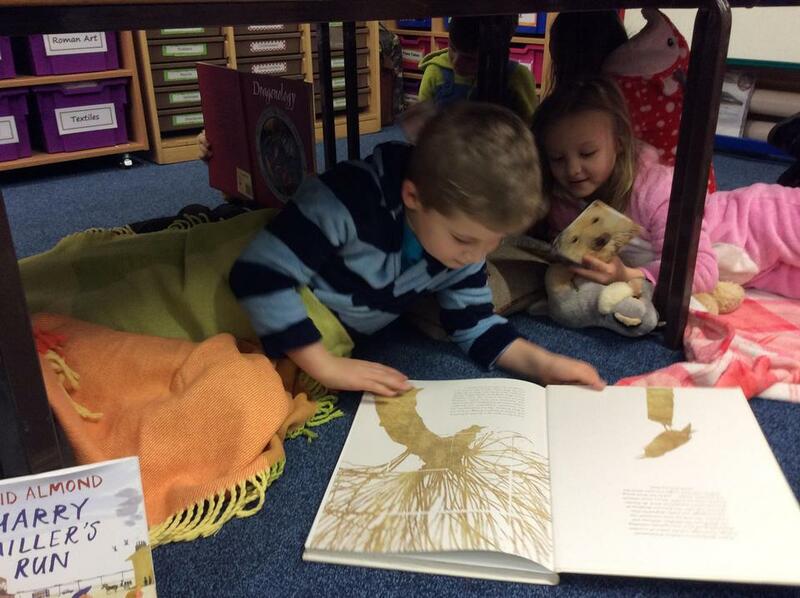 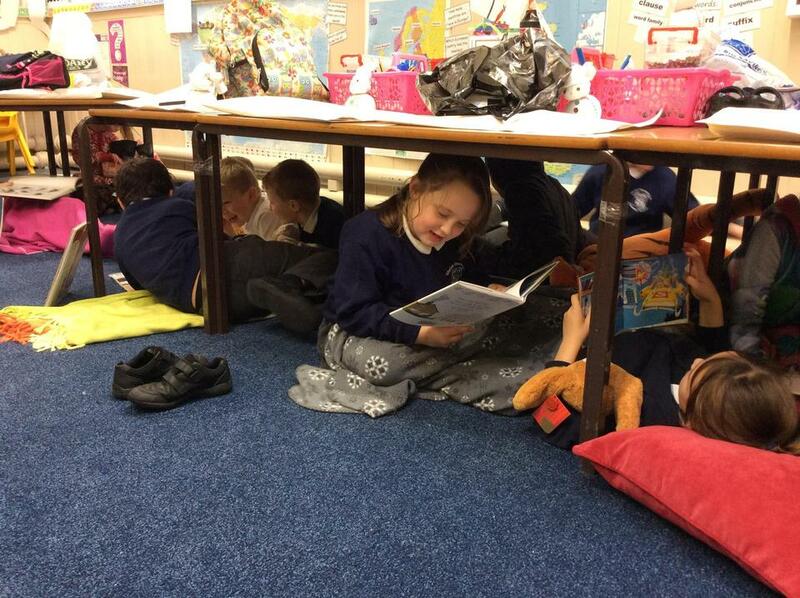 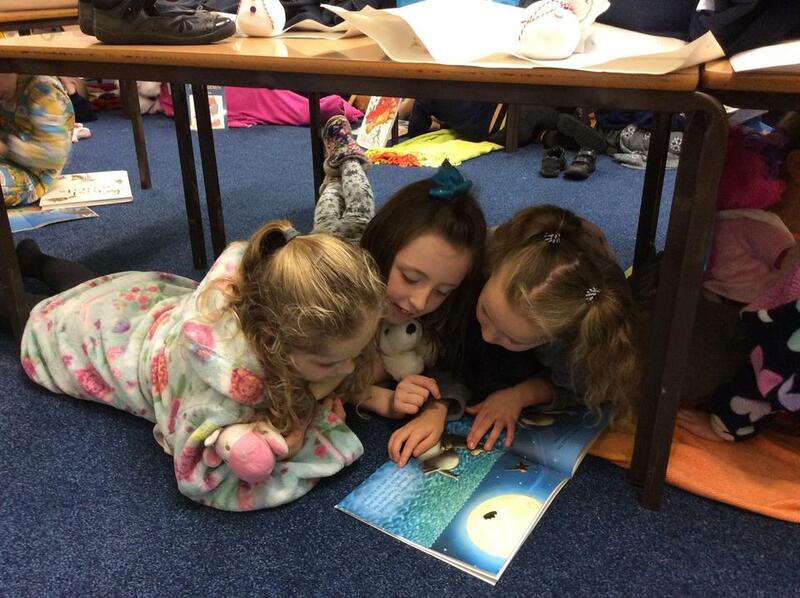 This week in English we have continued to read folk tales about Lancashire. 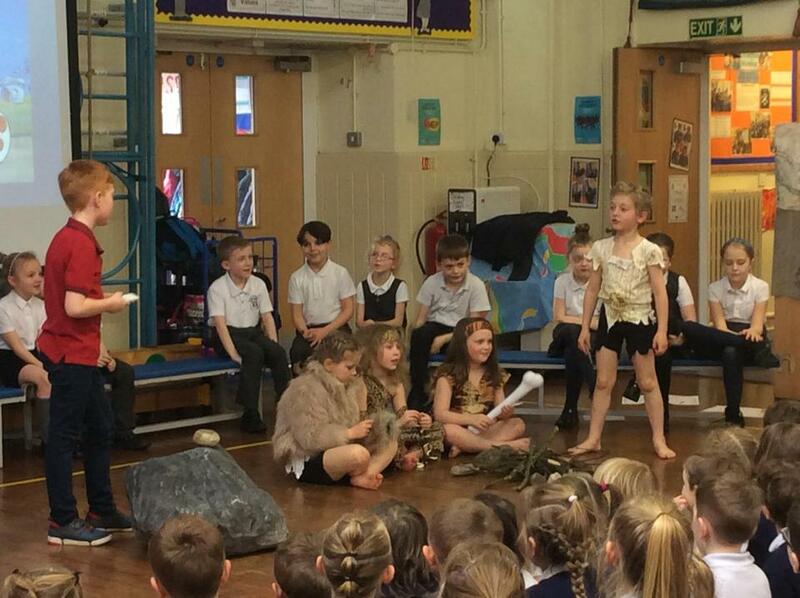 This week's folk tale has been about a boggart that used to live in Ball Grove. 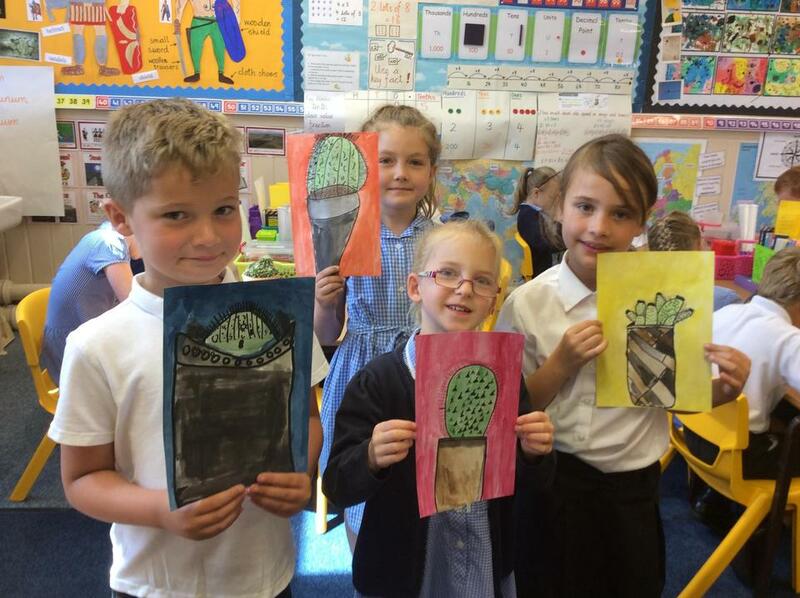 We have discovered that boggarts are very mischievous and bad tempered creatures. 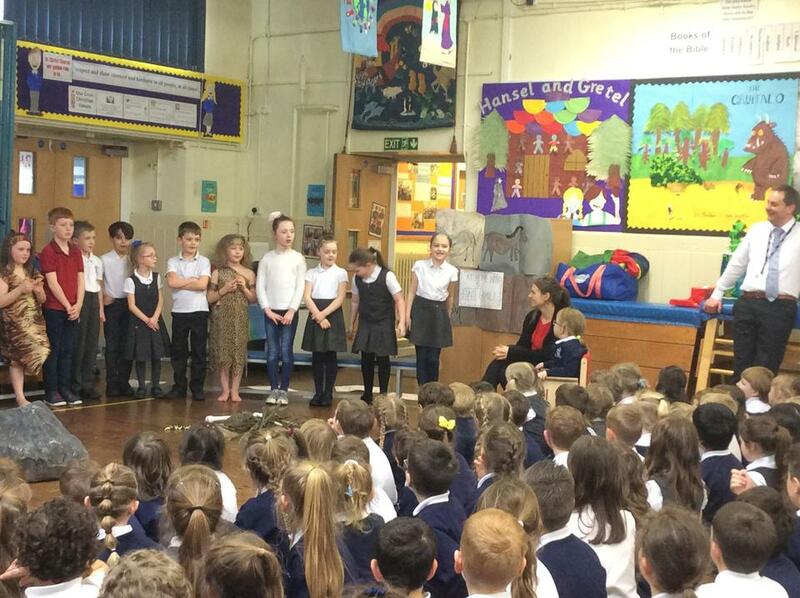 We have read some eye witness accounts of boggart sightings. 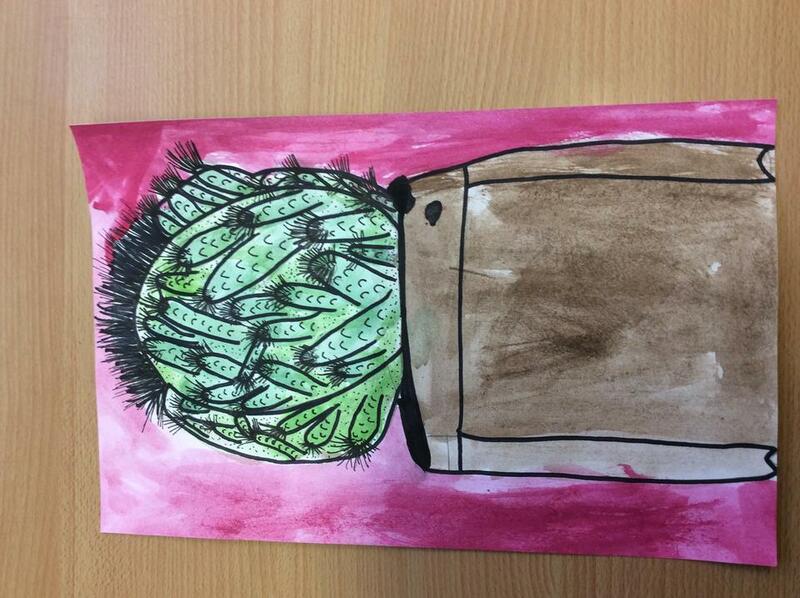 Next week we are going to make a boggart story trail in Ball Grove Park. 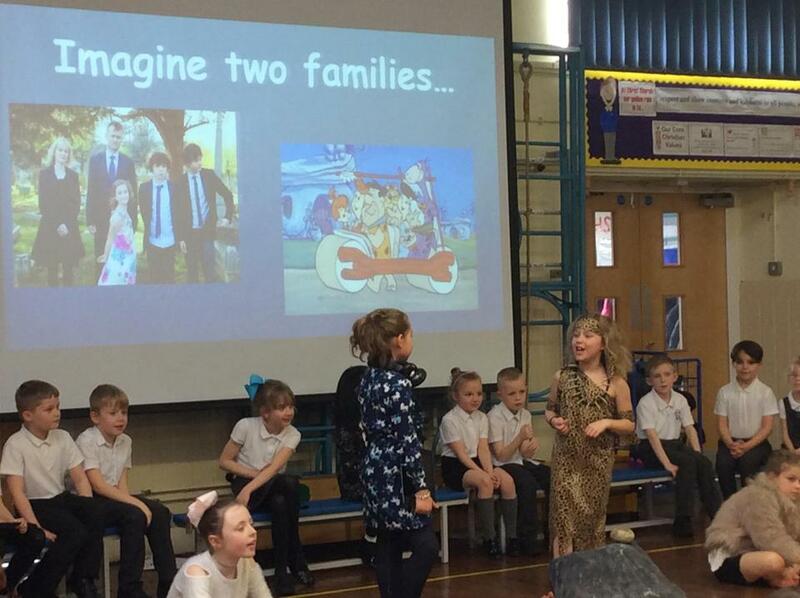 I wonder if we'll spot any boggarts? 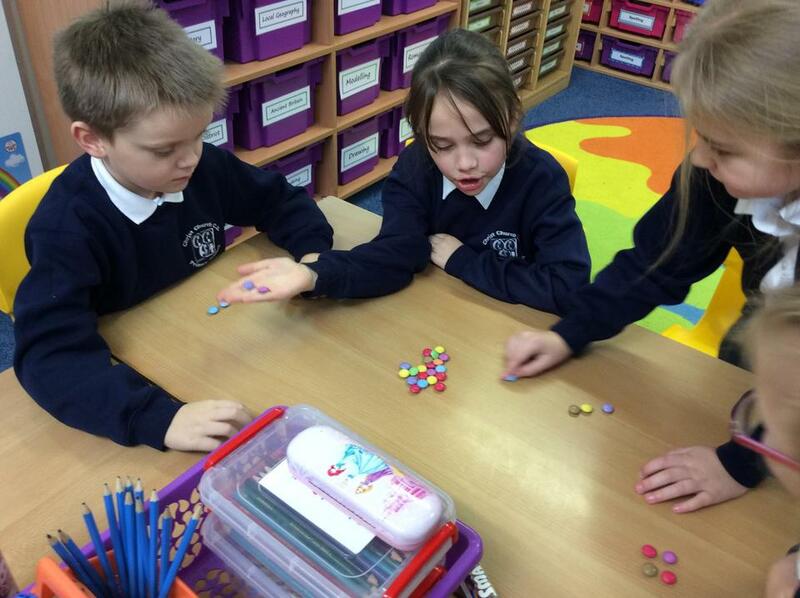 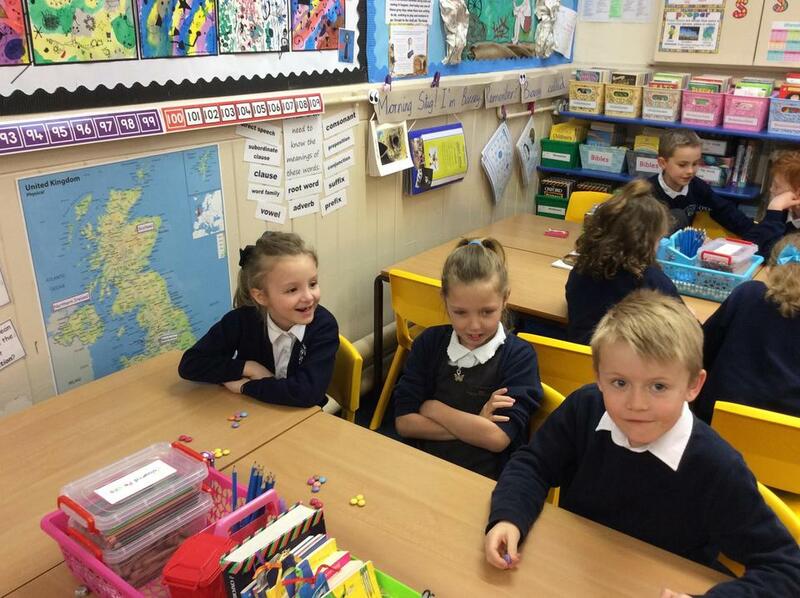 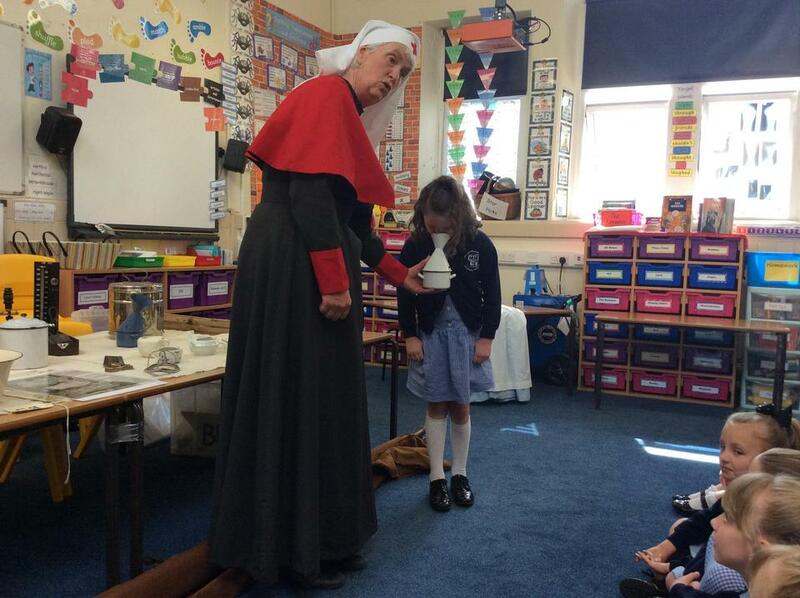 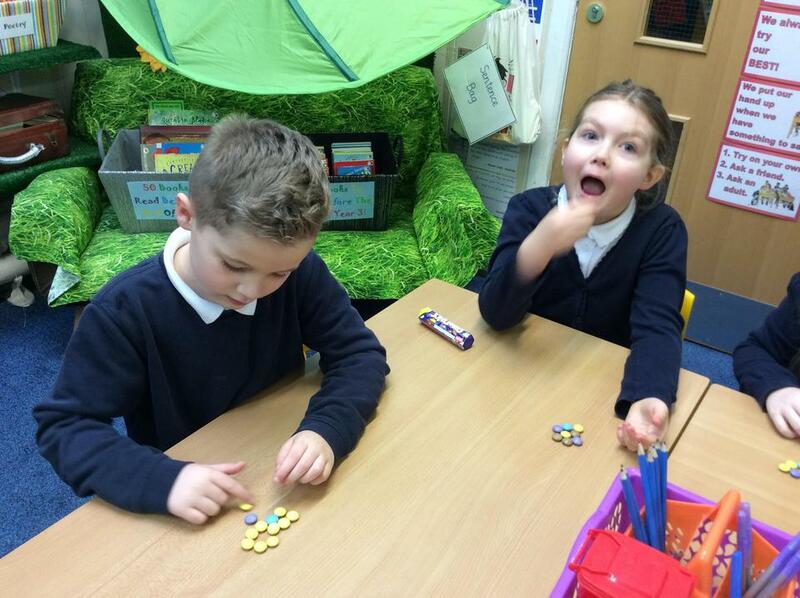 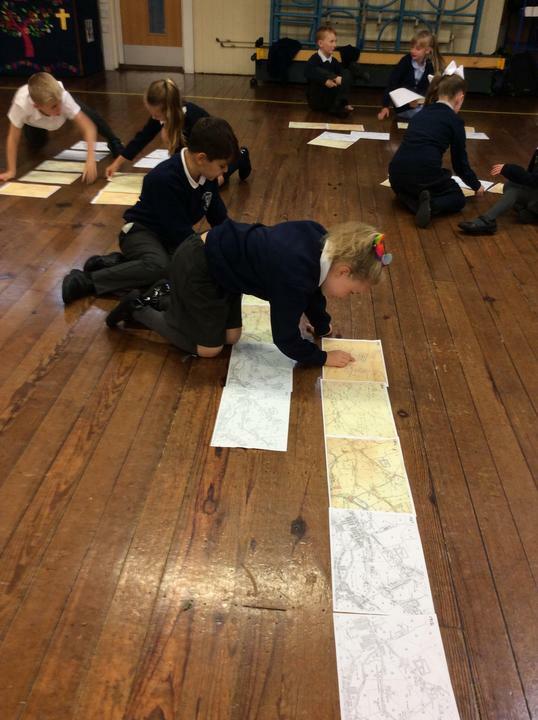 This week we have continued to find out about our local area. 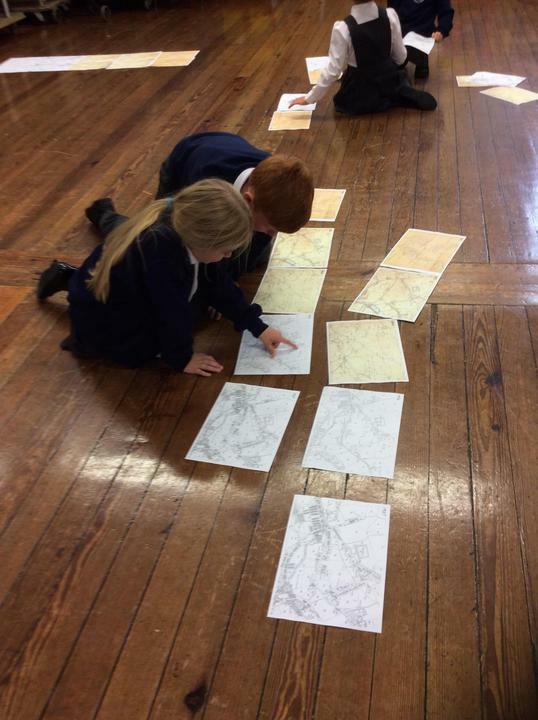 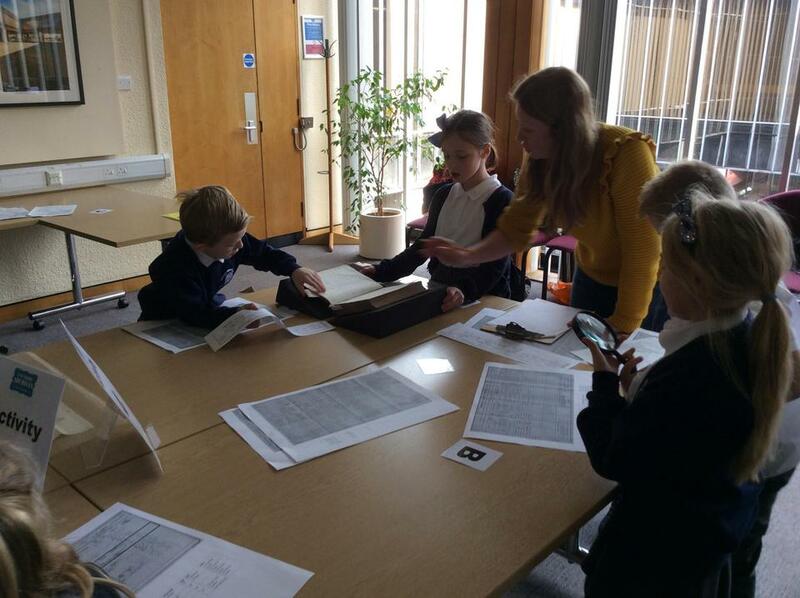 Here we are working collaboratively to put some historical maps into chronological order. 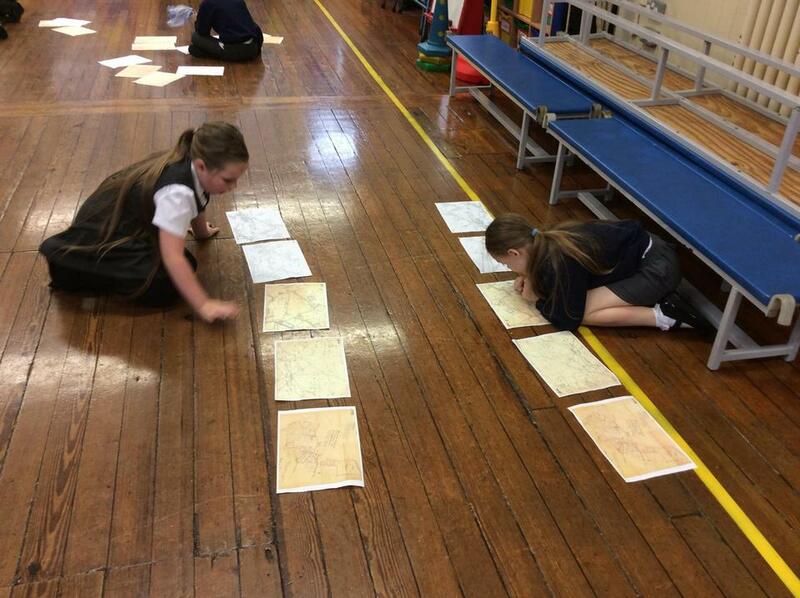 It made us really think about how we decided which was the oldest map and which was the newest. 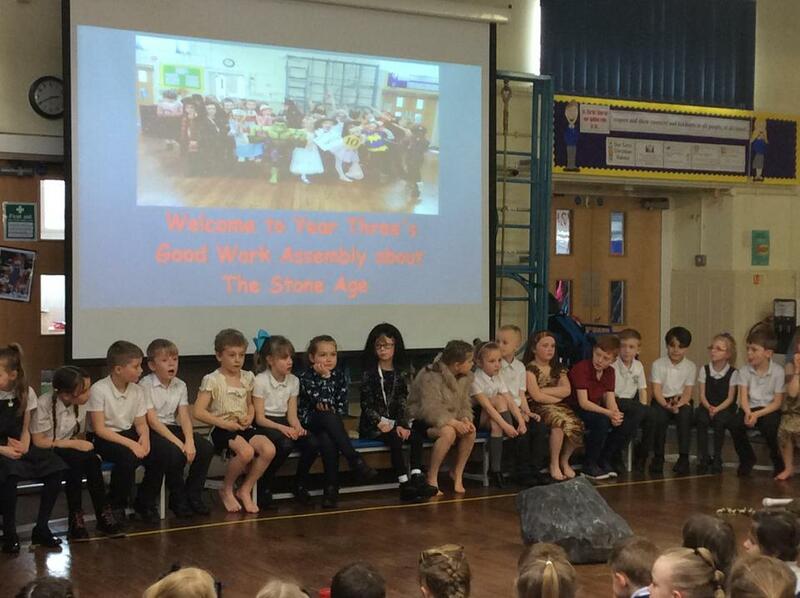 Welcome to Year 3 everyone! 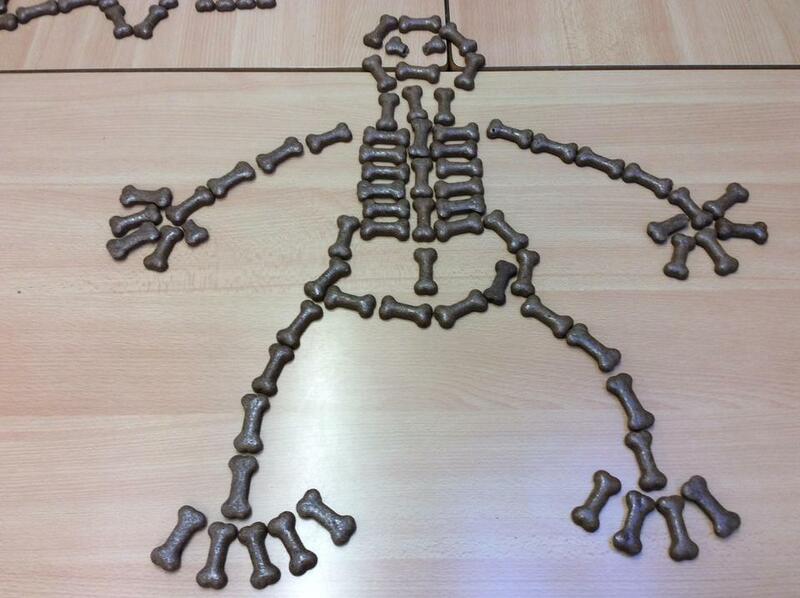 I hope everybody is ready for another big year of learning! 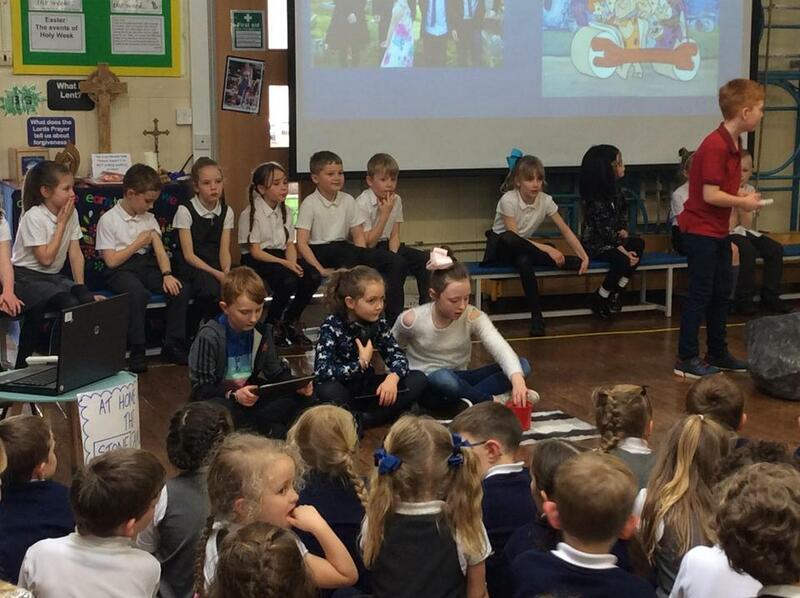 Make sure you have a look at our Big Picture to find out what we will be learning about this half term.